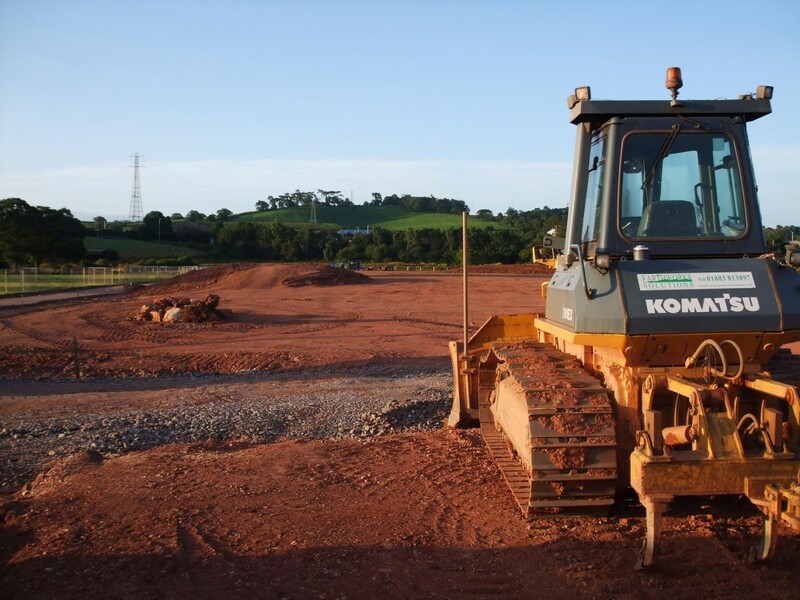 When you click on a project item, a preview will open & show you more details. 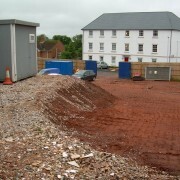 Site Clearance and Enabling for Housing Project, Ottery St Mary. 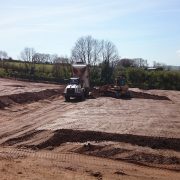 Mamhead, Nr Exeter, Small Landscaping Project. 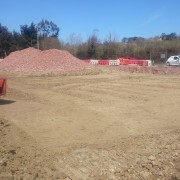 Sub Contract, Enabling Works/Piling Mat, Commercial Retail Development, Plymouth. 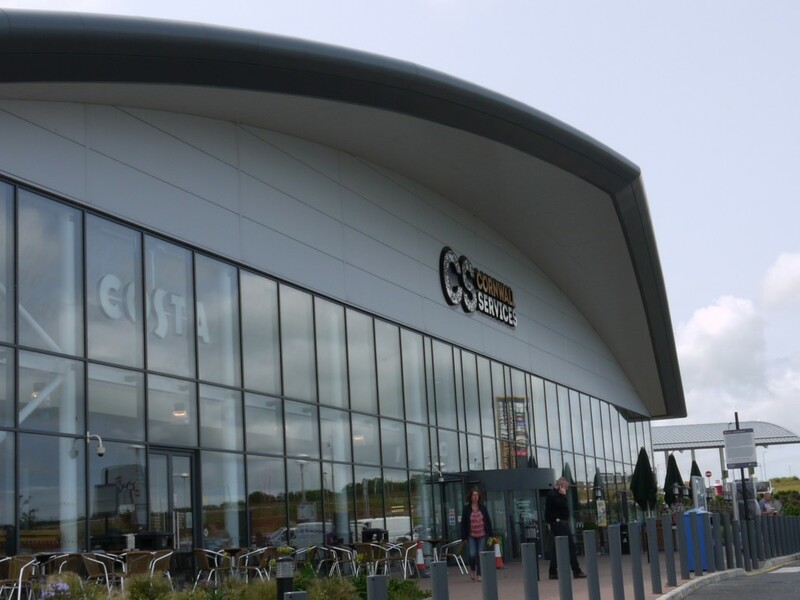 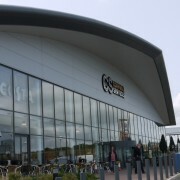 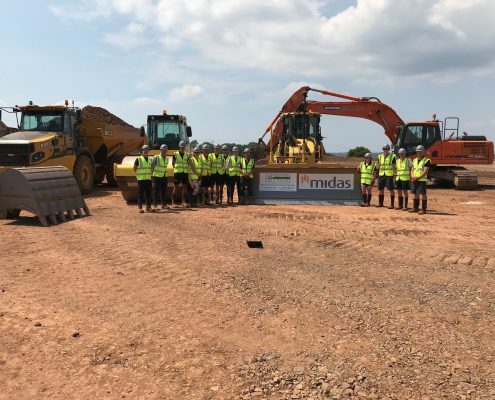 • Sub-contract works for Midas Construction. 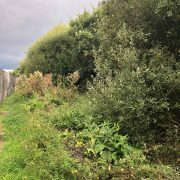 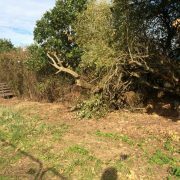 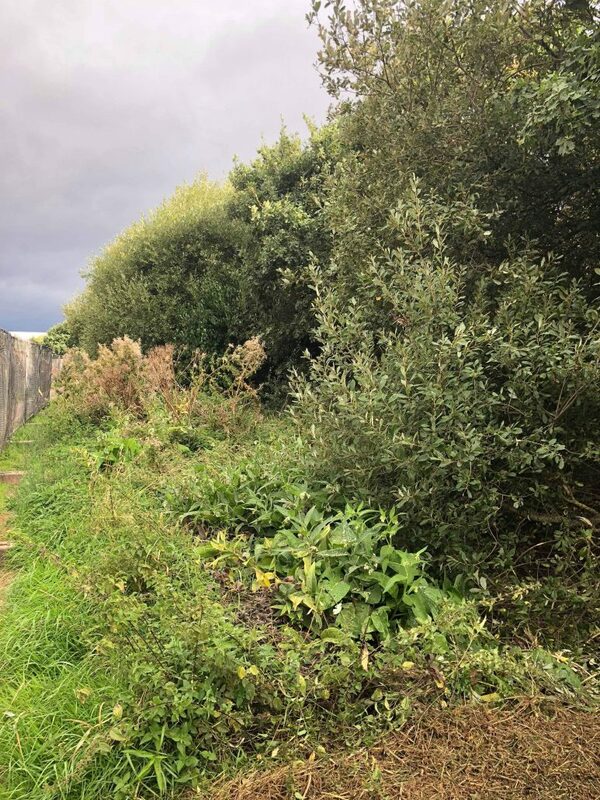 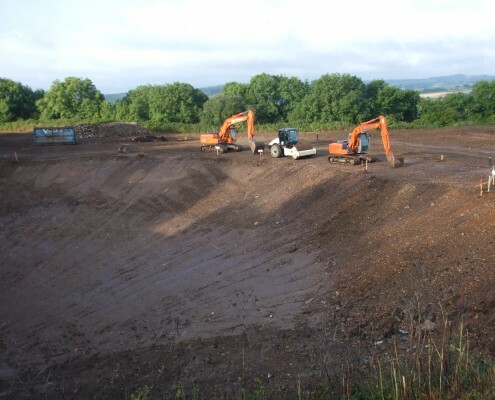 • General site clearance of shrubs, trees and vegetation including general waste, concrete and tarmac materials to licensed premises for disposal or recycling. 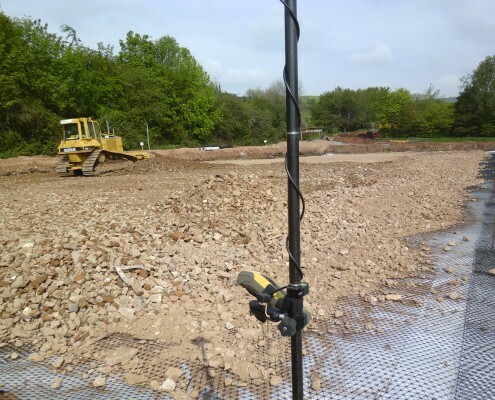 • Reduce level excavation to GPS DTM surface models and placement of previously managed pre load materials to filling specification to design levels. 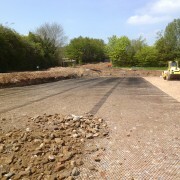 • Relocation and importation of quarry products to construct piling mat including placement to specification. 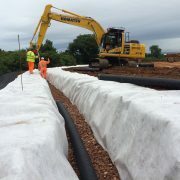 • Installation of geotextile separation layer. 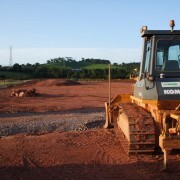 • Management of sub-contract testing engineer to specification. 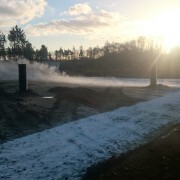 • In house volumetrics and earthworks modelling. 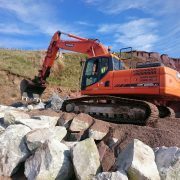 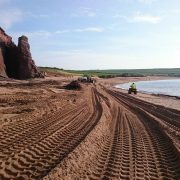 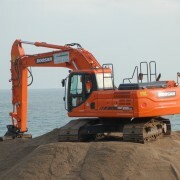 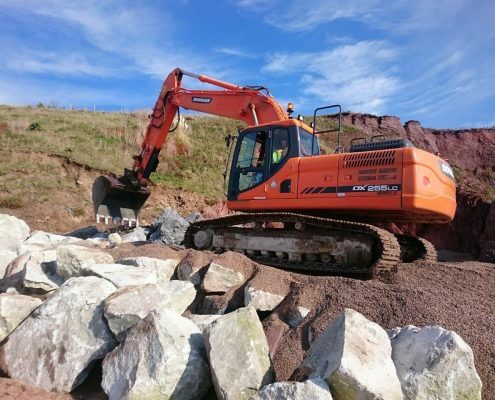 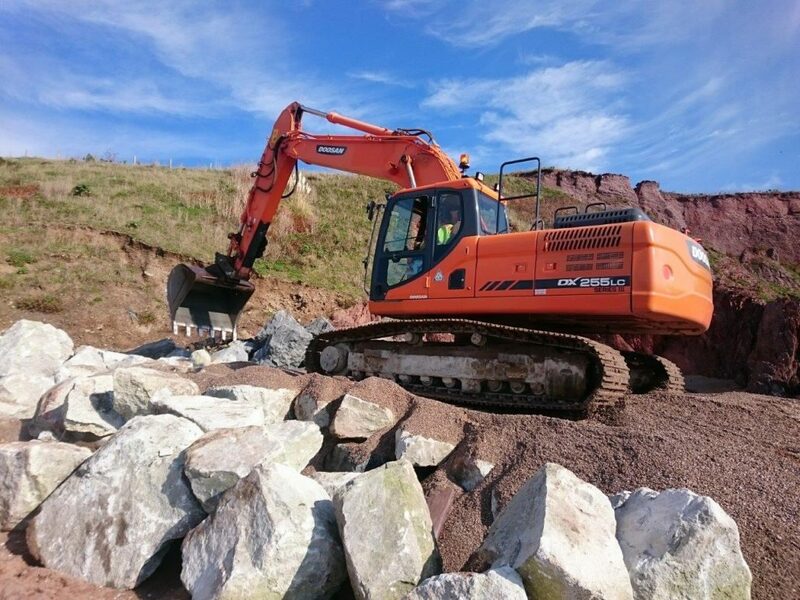 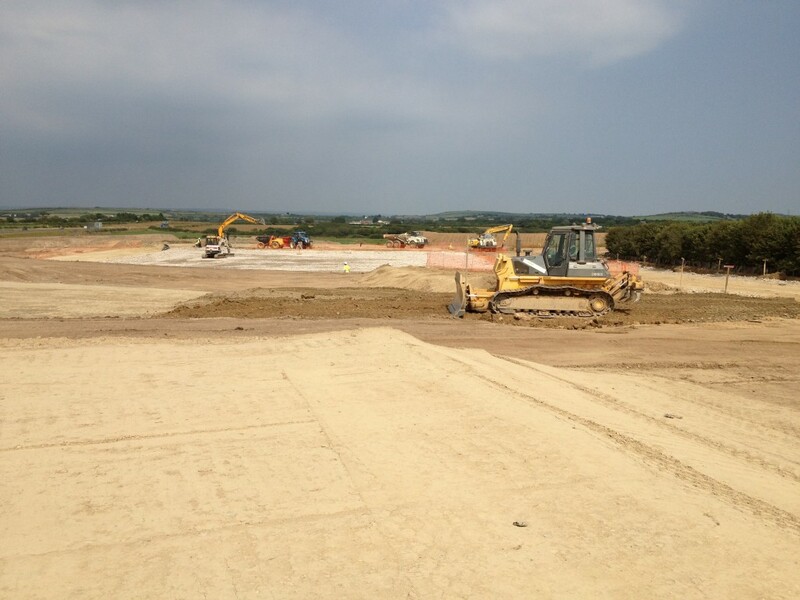 Principle Contractor, Sea defence and Rock Armour works, Thurlestone, South Devon. 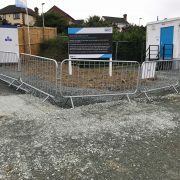 • Privately Funded Principle Contractor works. 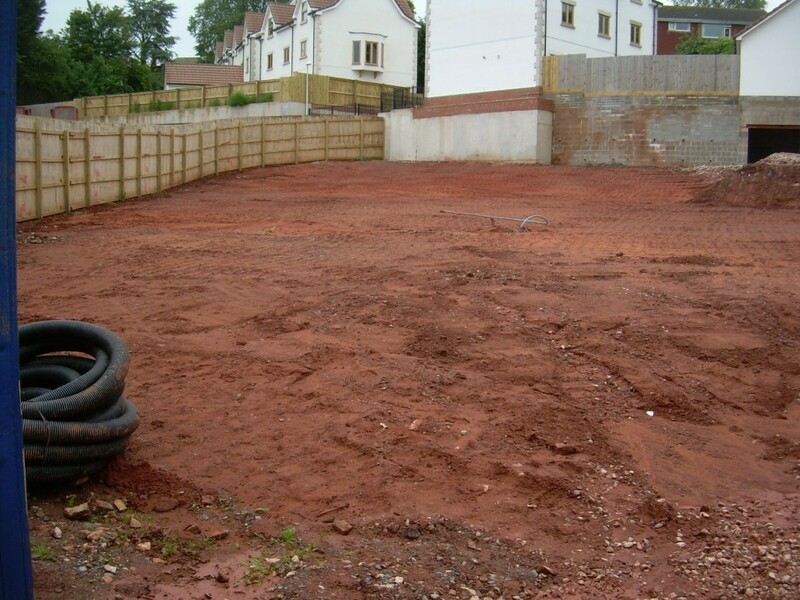 • Establish and reinstate site compound upon completion. 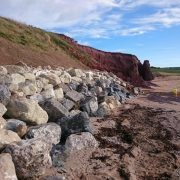 • Stabilizing of existing rock armour profile. 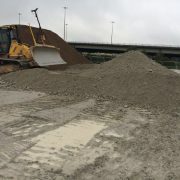 • Importation and placement of 2 to 4 tonne rock to new armour profile. 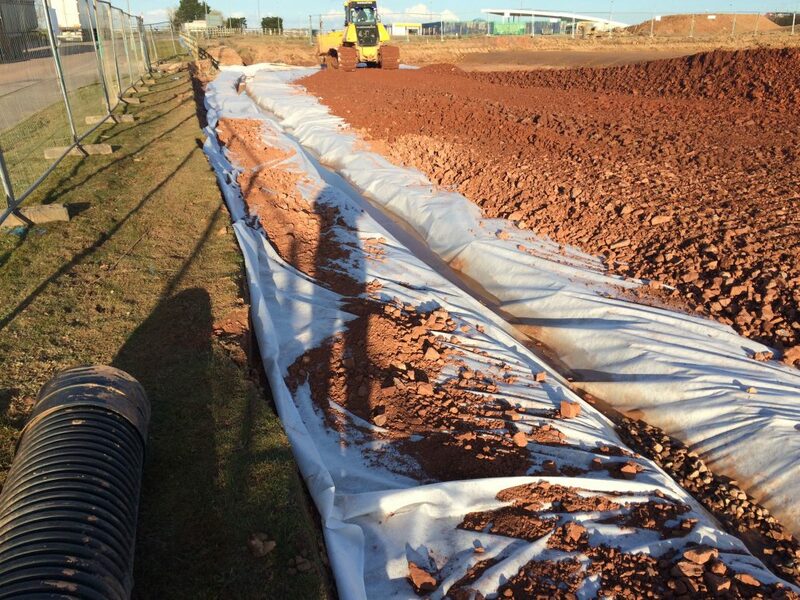 • Importation and placement of soils above rock armor upon anchored geotextile to stabilize existing slope profile. 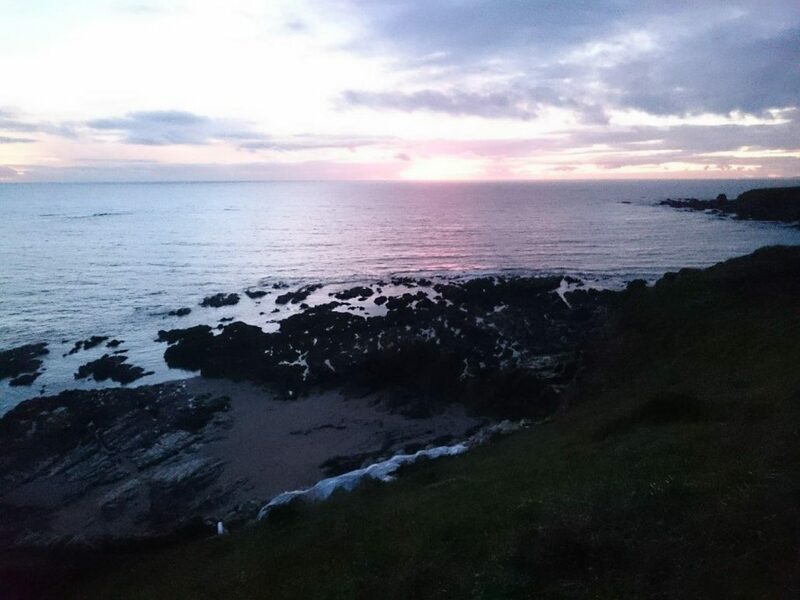 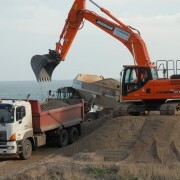 • Management of Health and Safety, general public and traffic in busy seaside location. 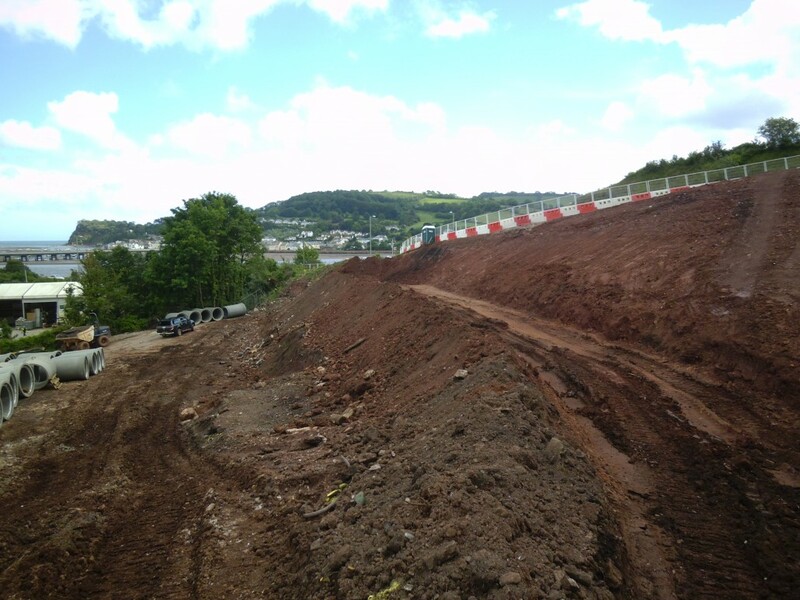 • Successful implementation of traffic management plan. 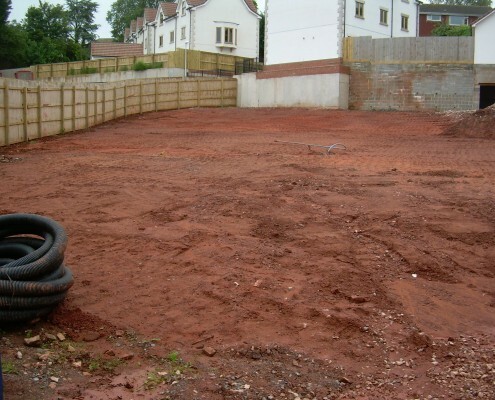 • All works successfully carried out within programmed time and budget to specification. 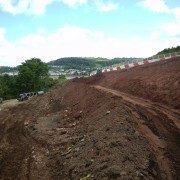 • All works carried out above MHW. 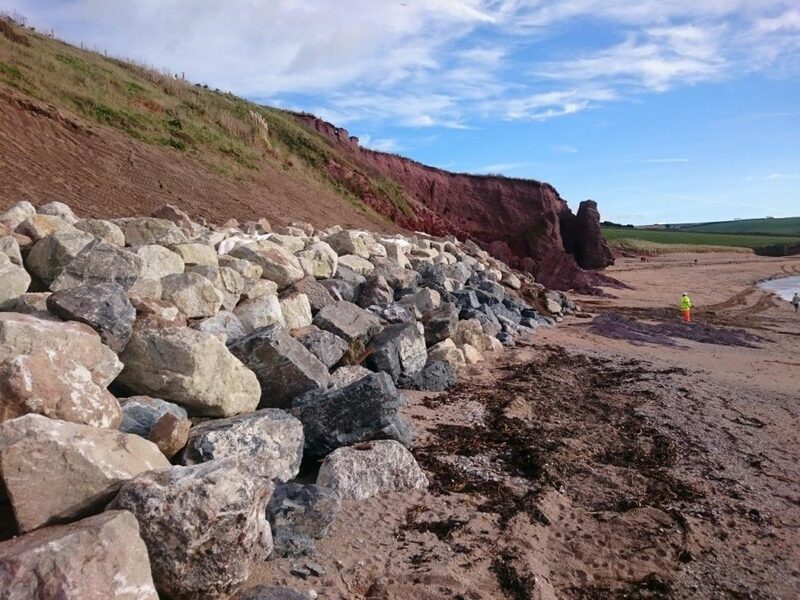 • All materials transported 800 m along beach profile from re-handling location. 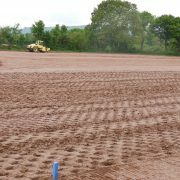 • Soils were seeded to specification. 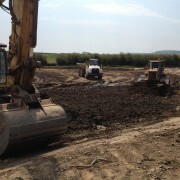 Earthworks modelling and setting out by ourselves. 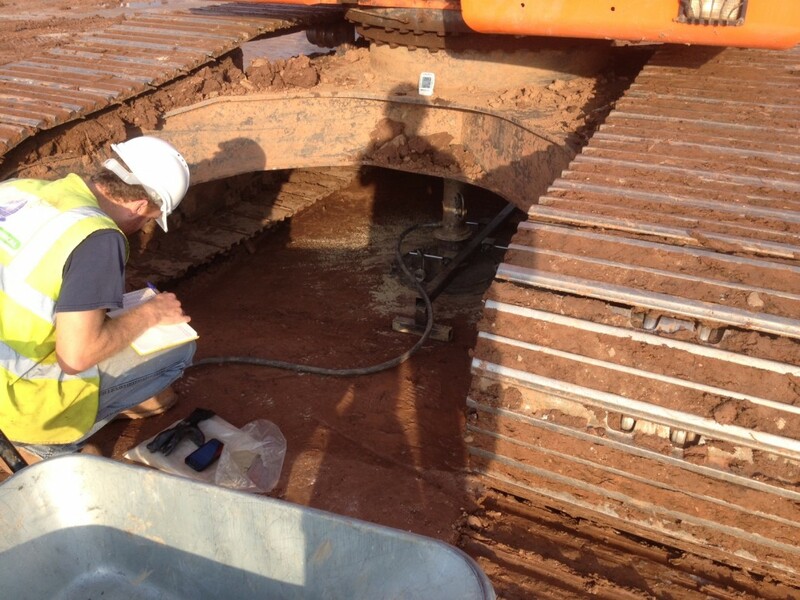 All materials and conformity testing. 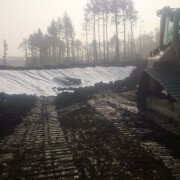 3000 + m3 Import and placement to level. 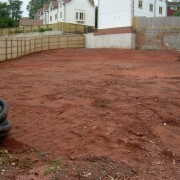 Regrade and filling of private gardens. 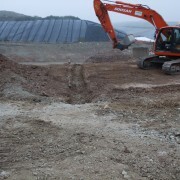 Excavation of flood relief channel for Team Van Oord approx length 1925m. 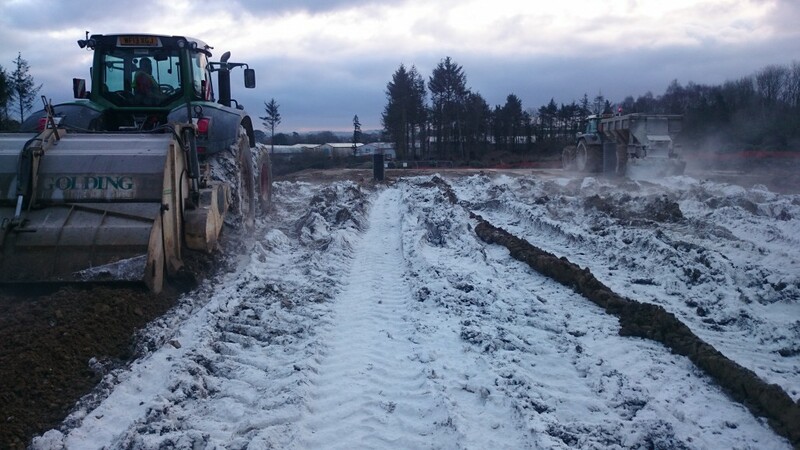 All plant was converted to BIO OILS for working on an Environment Agency contract. 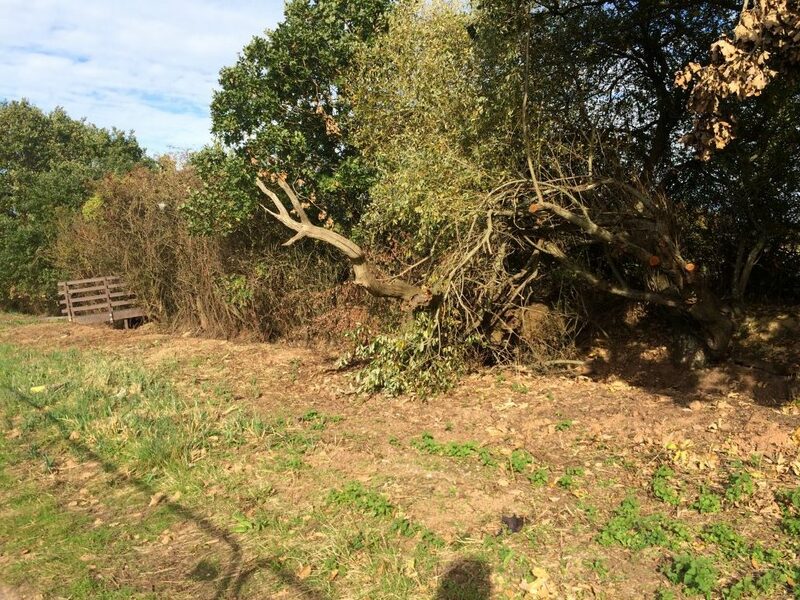 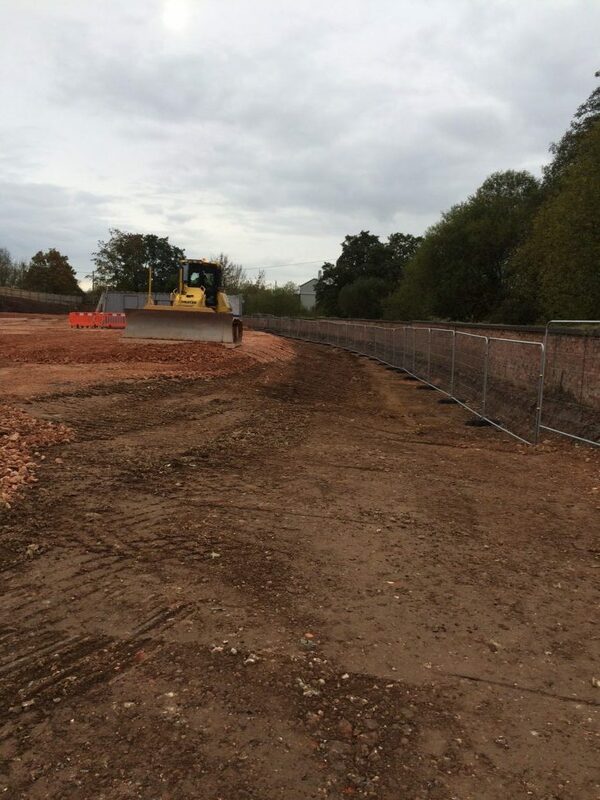 Removal of hedges and fences from site and off site disposal. 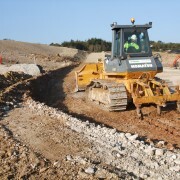 Formation of temporary haul roads. 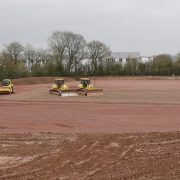 Final trim to 1:3 slopes using blade fitted with GPS machine guidance. 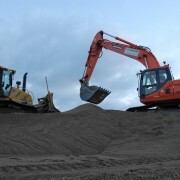 All excavated material hauled to stockpile for re-use elsewhere for embankment construction. 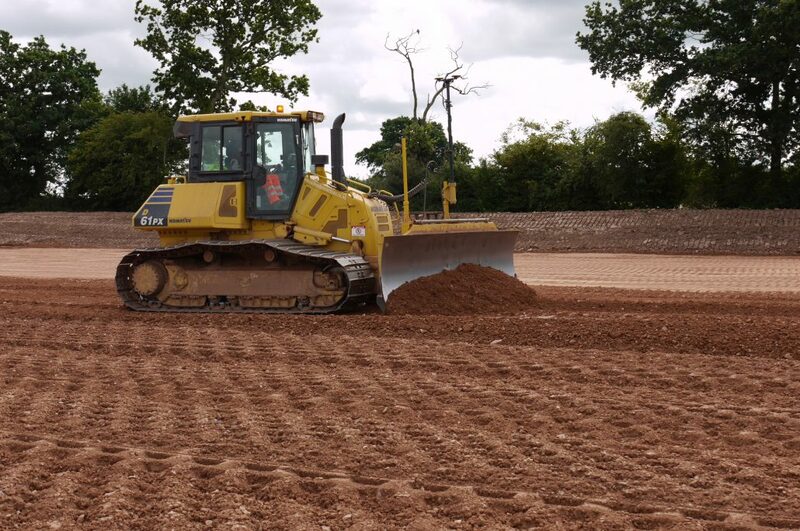 Place stockpiled topsoil to graded channel to a depth of 150mm using GPS machine guidance. Surplus topsoil was spread throughout the working area and trimmed to level. 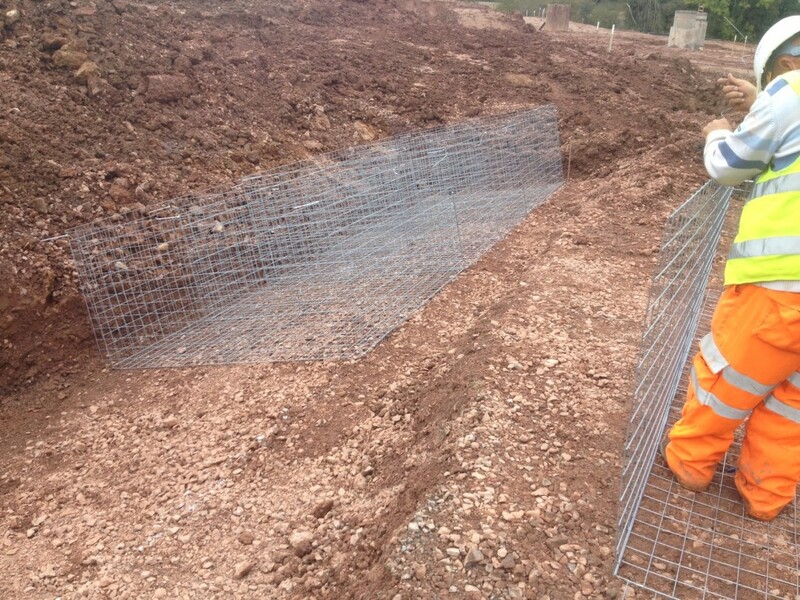 Additional works included placement of a 20m x 30m x 2.5m high embankment trial panel. 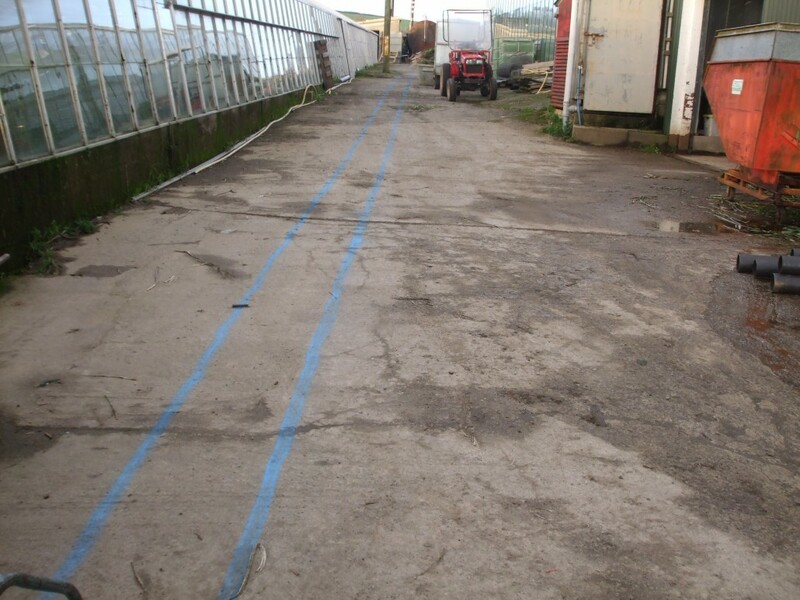 All associated measurements for monitoring settlement. 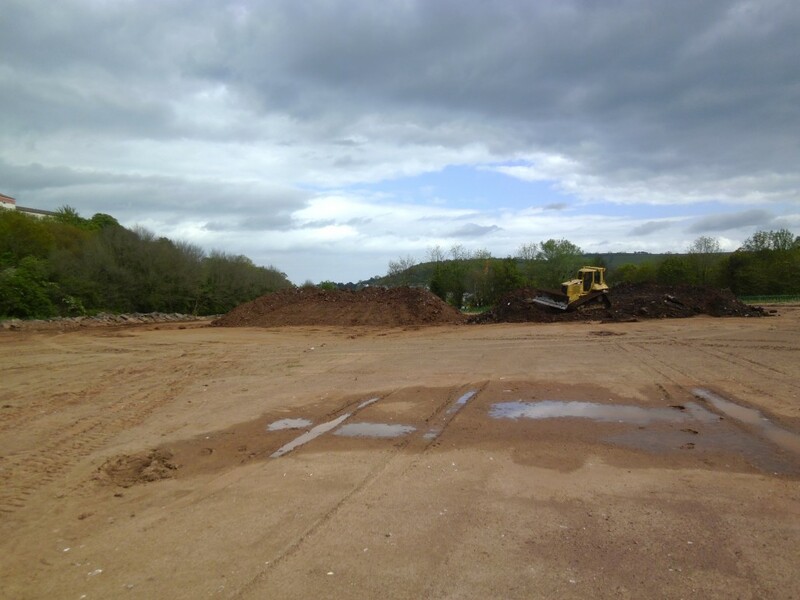 Site preparation for 3 adjacent sites for a Local Authority DLO works and private commercial unit and future development area. 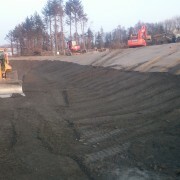 Formation of temporary haul road. 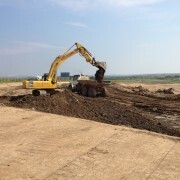 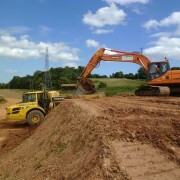 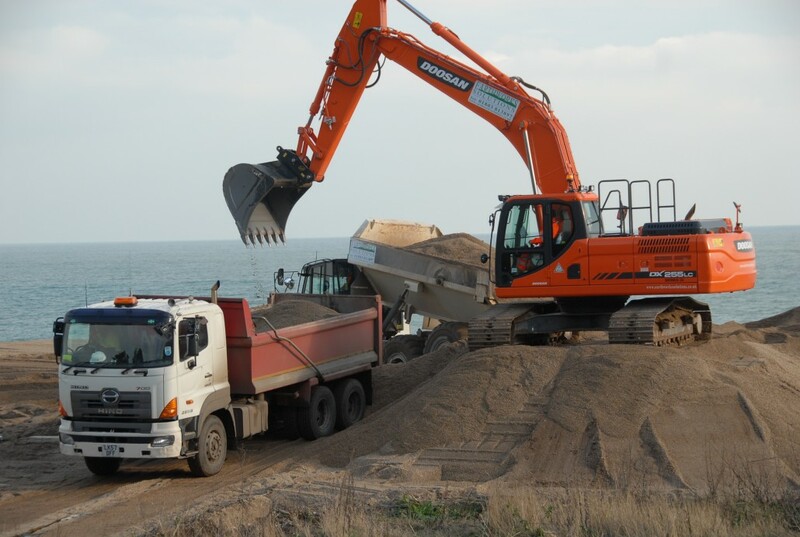 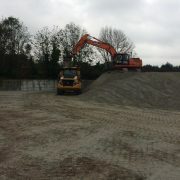 Removal and relocation of 10,000m3 topsoil stockpile. 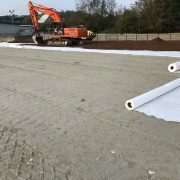 Proof roll surface to accept filling. 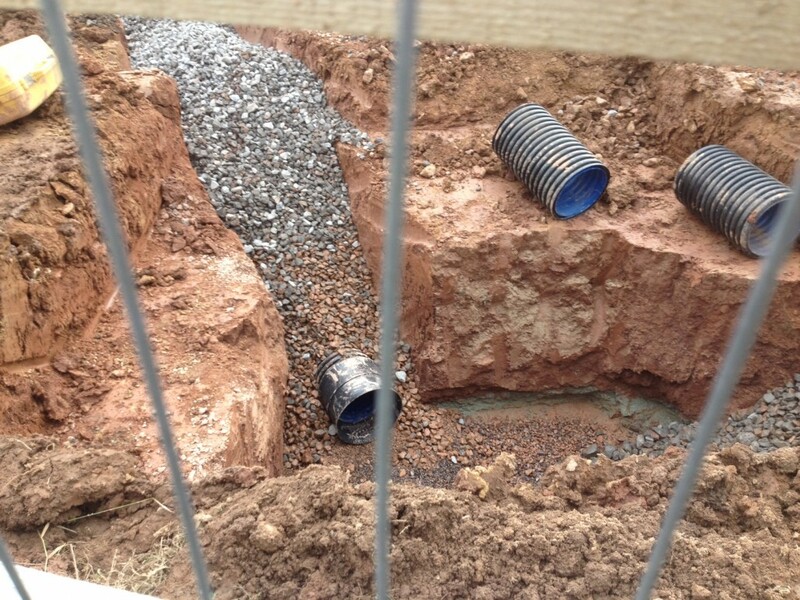 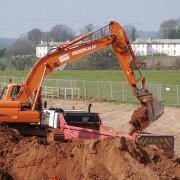 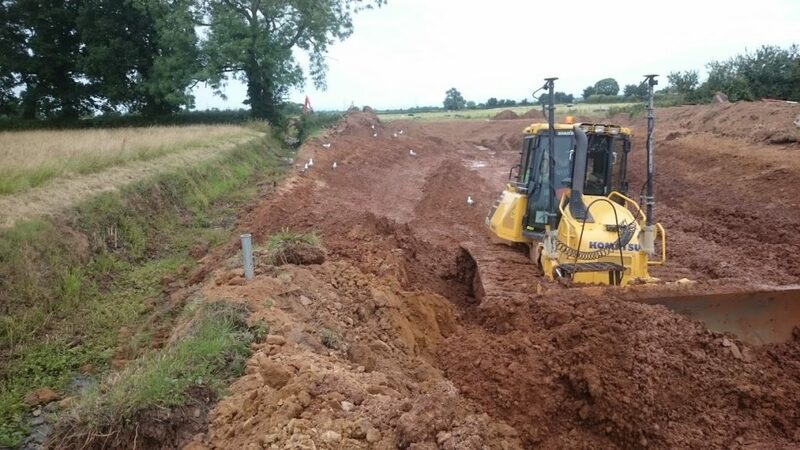 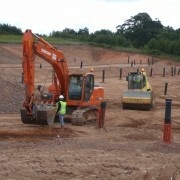 Temporary drainage works to facilitate earthworks contract. 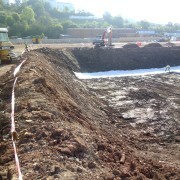 Excavation to formation level and filling of soft spots with site won material to engineered specification. 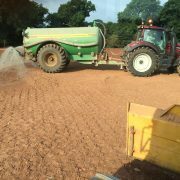 Filling and moisture conditioning of clay soils to fill to engineered specification. 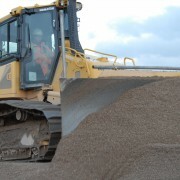 Trim and compact all surfaces to accept quarried capping material. 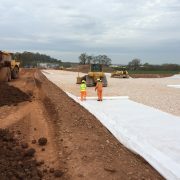 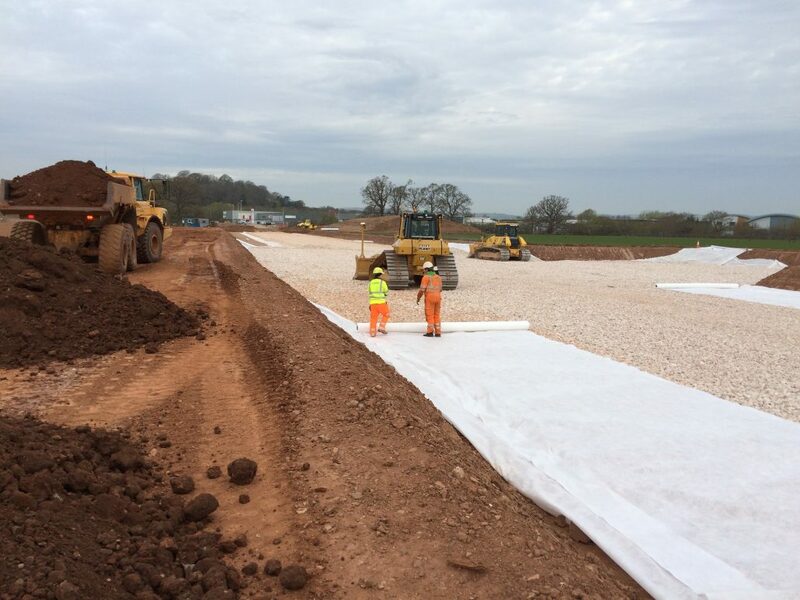 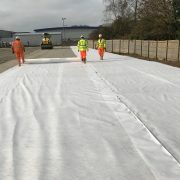 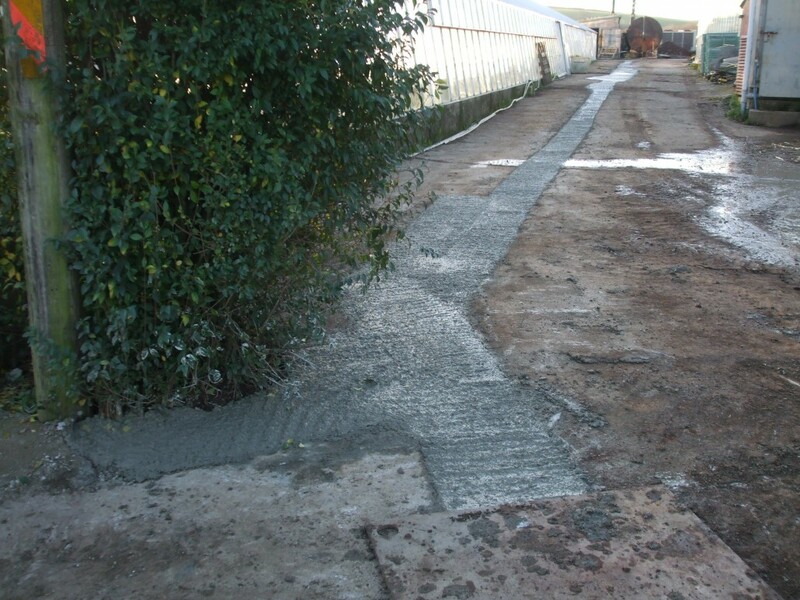 Placement of geotextile and imported 6F5 to all external areas. 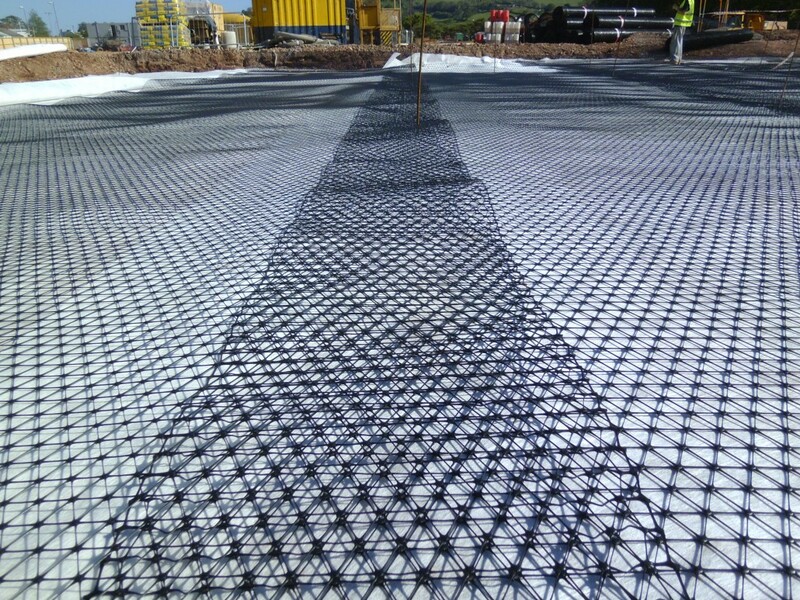 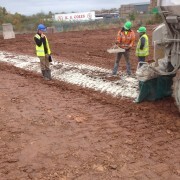 Placement of geotextile and imported Type 1 803 to building footprint. 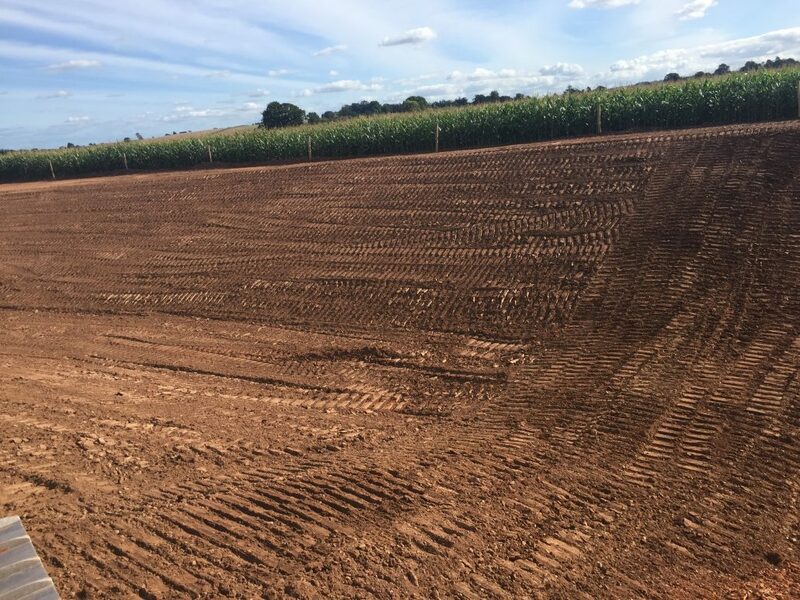 Erosion control matting placed to steep batters. 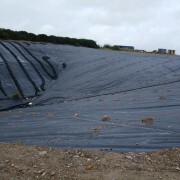 Formation of landscape bunds to provide cost effective solution for surplus unsuitable material. 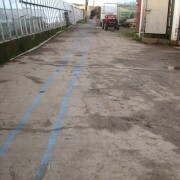 All works trimmed to level with machine operated GPS. 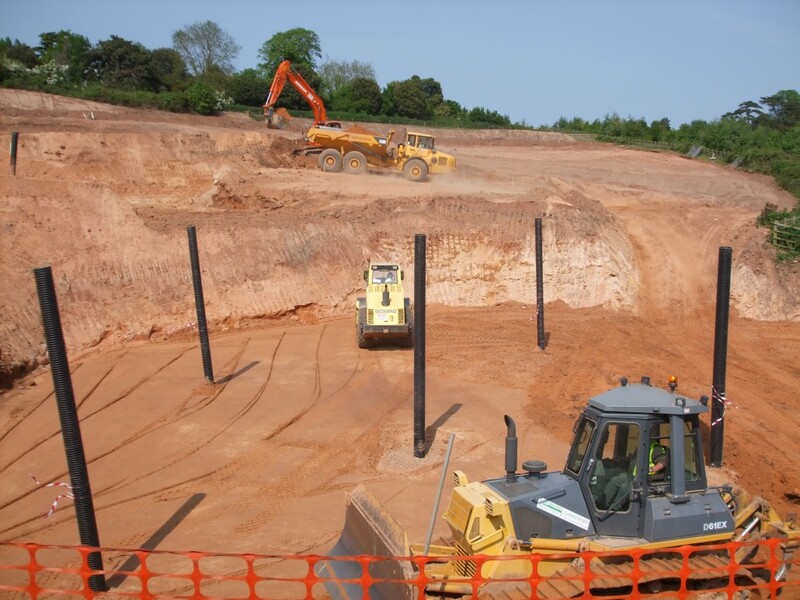 Provision of all Geotechnical Engineering on site and extensive Earthworks Modelling to Balance Material Quantities. 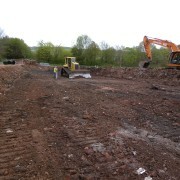 Site preparation of previously filled site to form spine road to commercial development site. 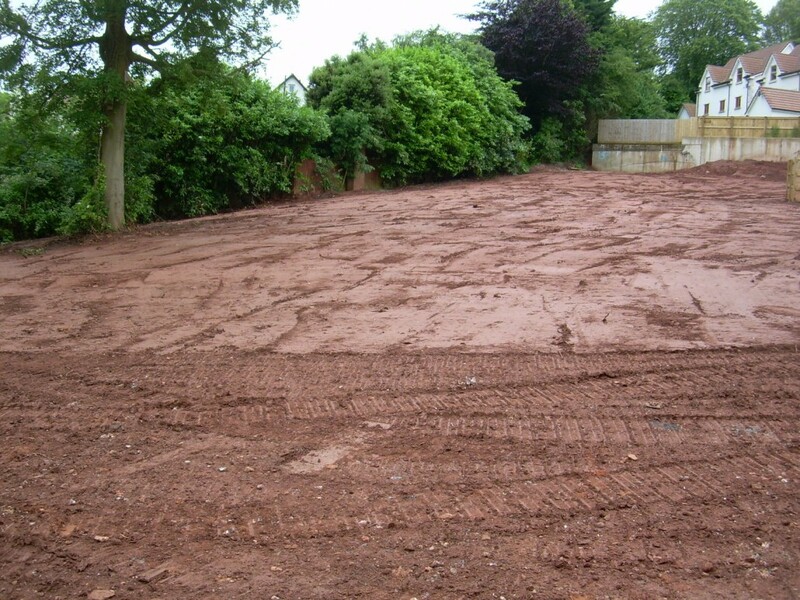 Excavate and stockpile previously placed soils down to existing original ground level. 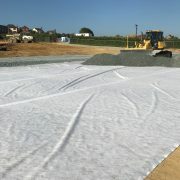 Place 150mm layer of 6C clean stone as drainage blanket wrapped in geotextile. 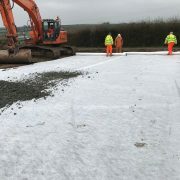 Fill to road formation level prior to filling with a further 1.0m depth of surcharge. 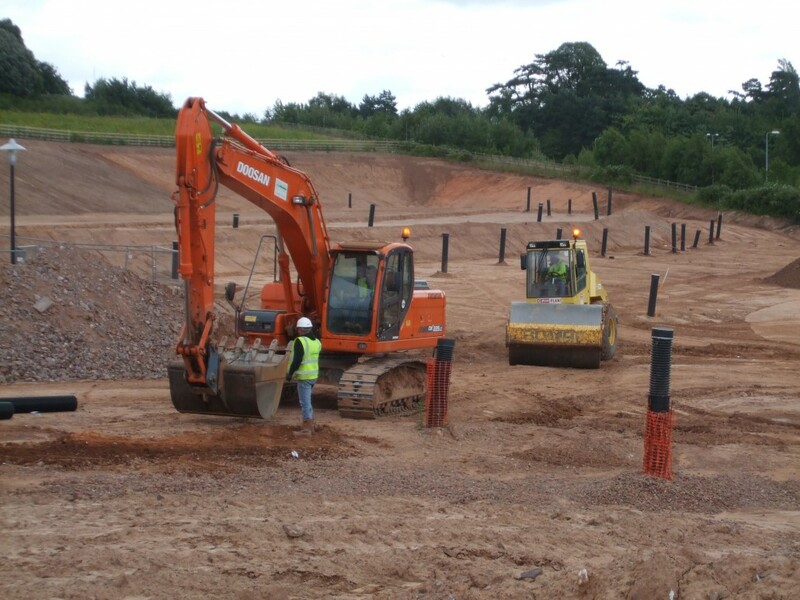 Place geotechnical monitoring stations along length of road. 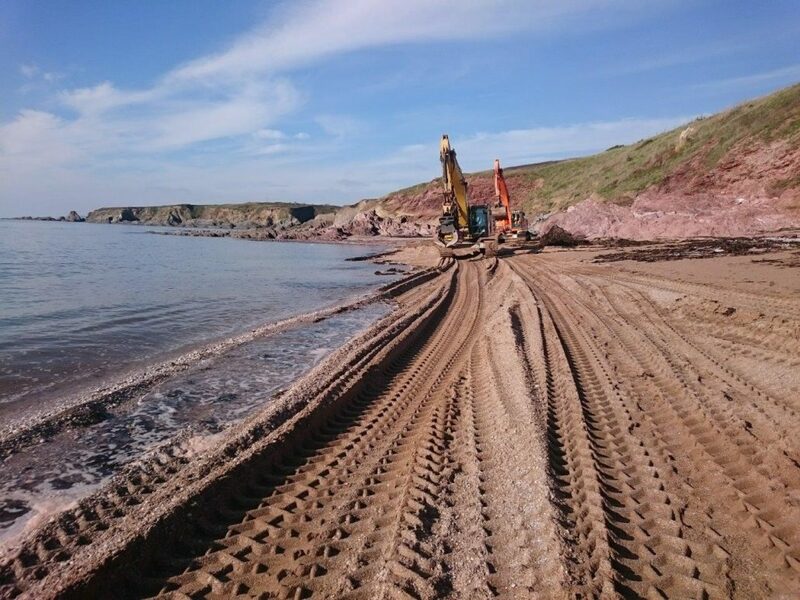 Monitor for 1 month for settlement of sub surface prior to removal of surcharge. 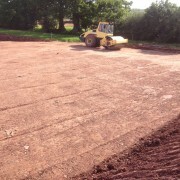 Trim and compact final surface and cap off with quarried 6F5. 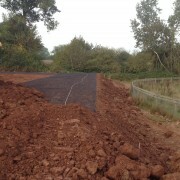 Cycle path formation in preparation for construction make up. 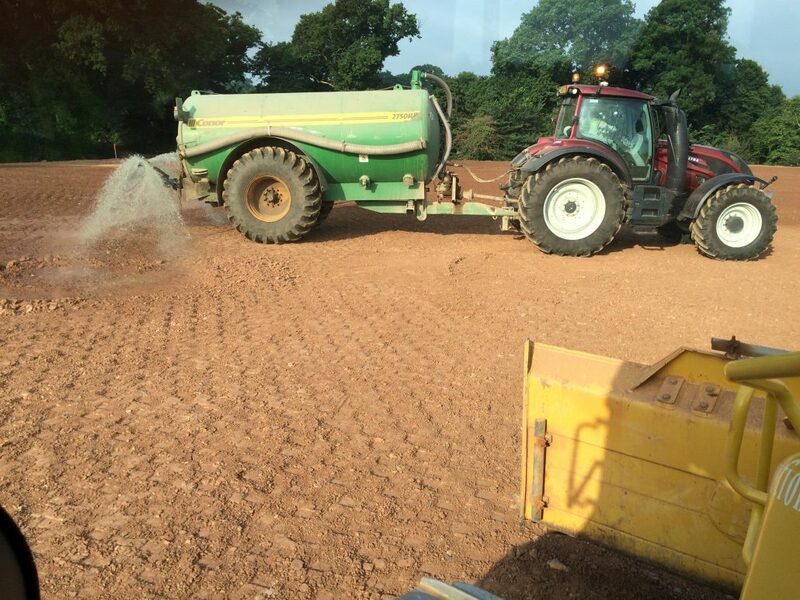 Filling and moisture conditioning of soils to facilitate filling to engineered specification. 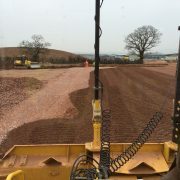 All works trimmed to level with blade mounted with machine operated GPS. 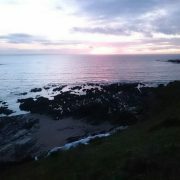 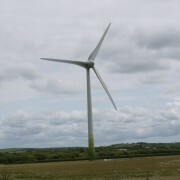 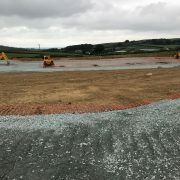 As areas of fill are completed and surcharged, the surcharge was subsequently moved on to other fill areas with further surcharging over the remainder of the site. 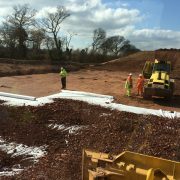 All materials placed were sourced locally, geotechnically approved prior to import under the site permit. 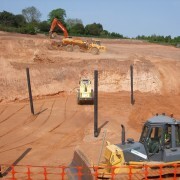 Importation of Soils for Structural Pre-load. 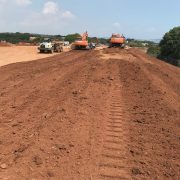 Works were undertaken in 2 phases after negotiating a contract with the Project Management team to import a shortfall of material on site. 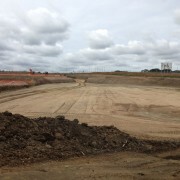 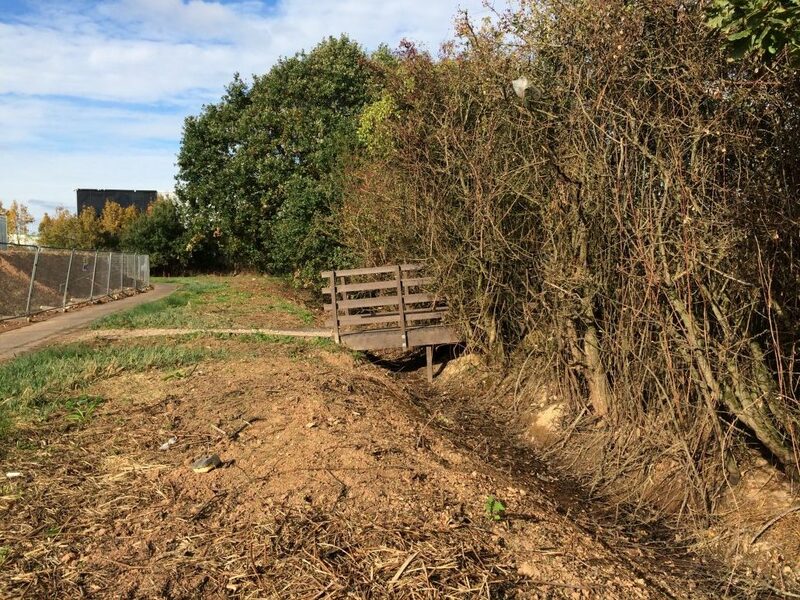 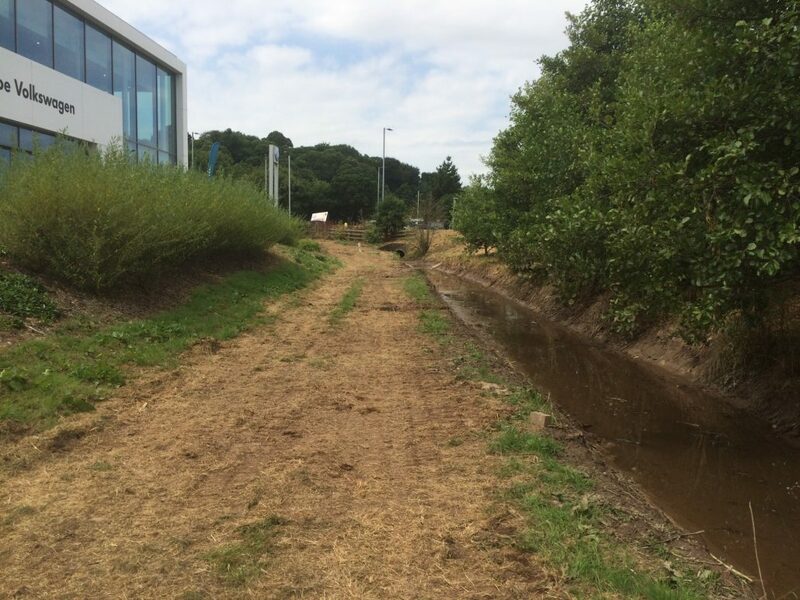 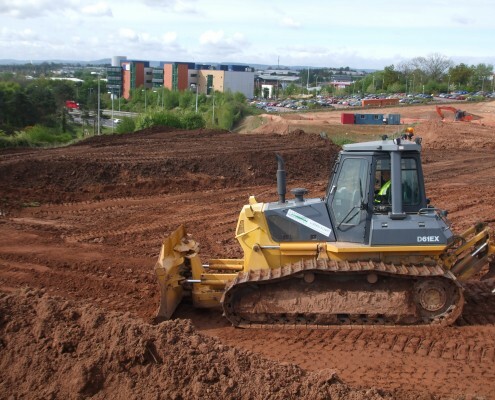 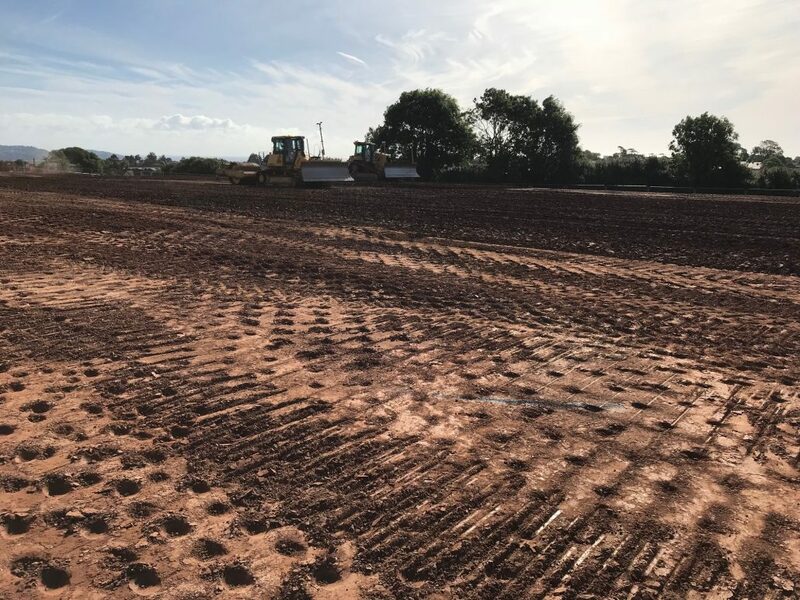 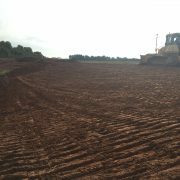 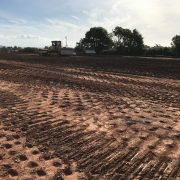 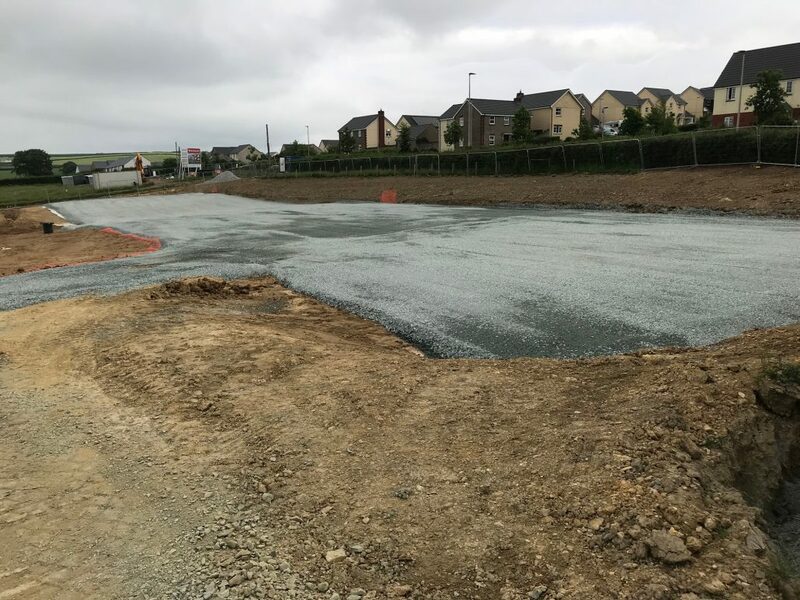 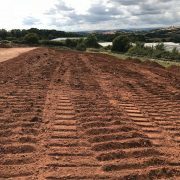 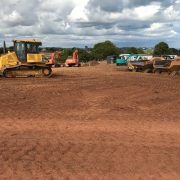 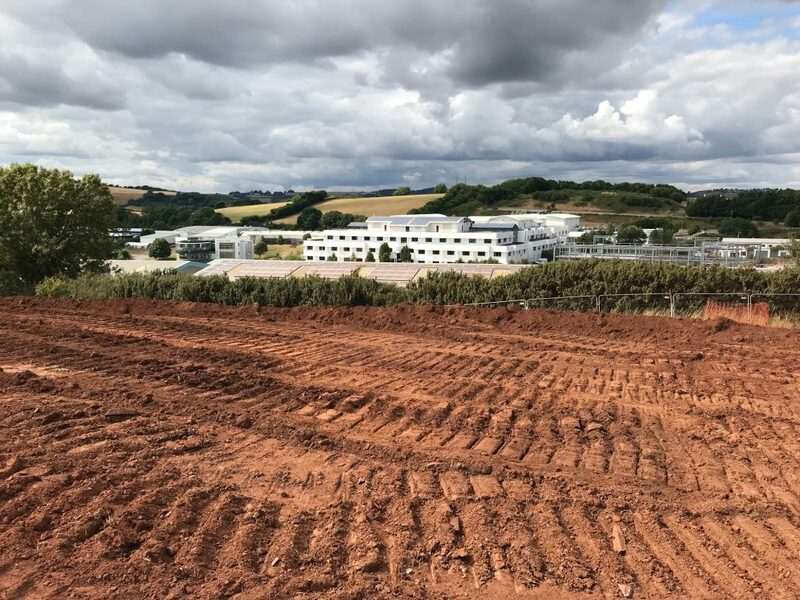 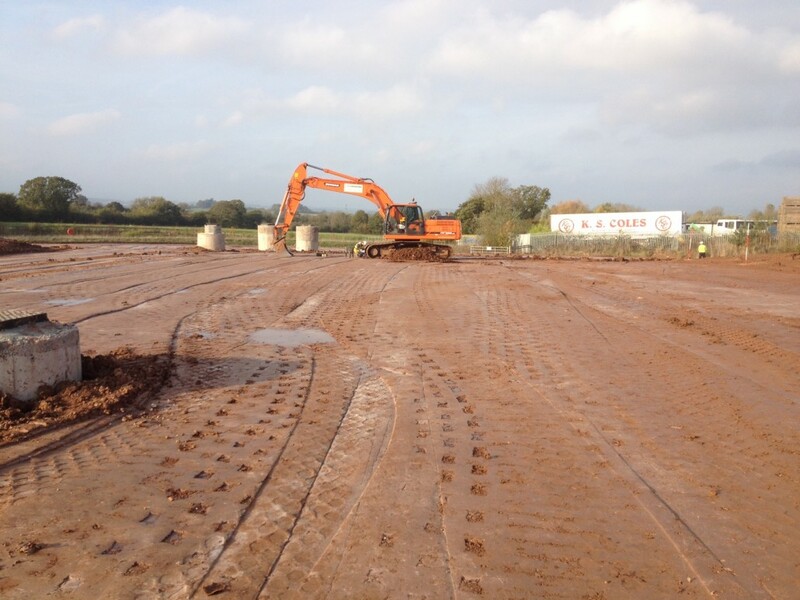 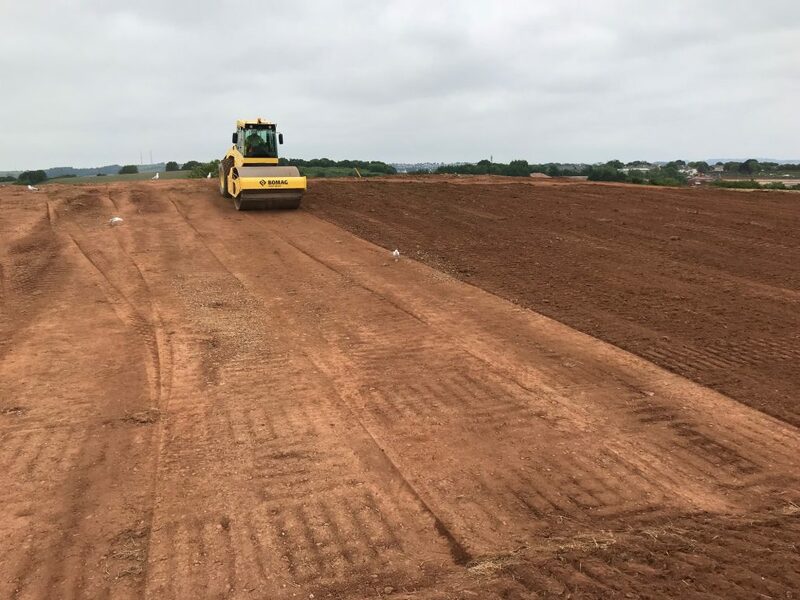 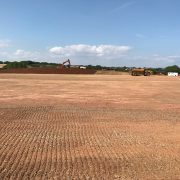 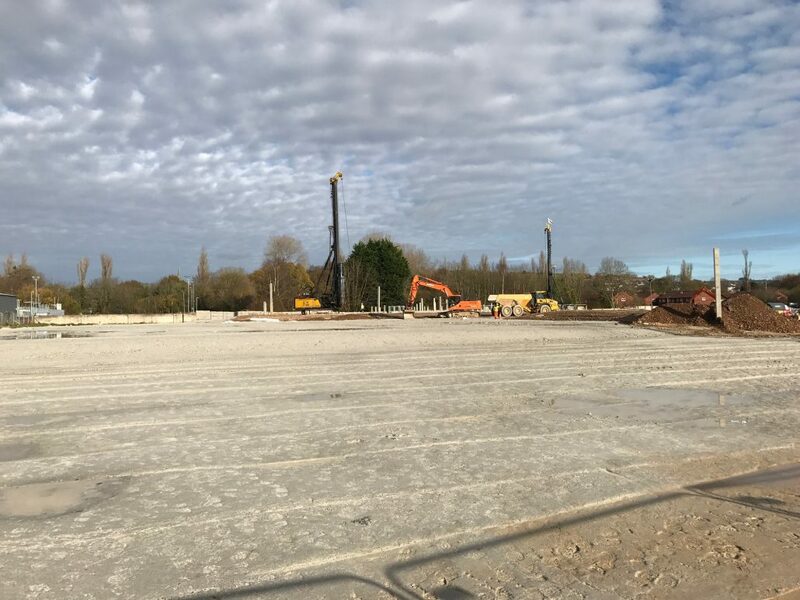 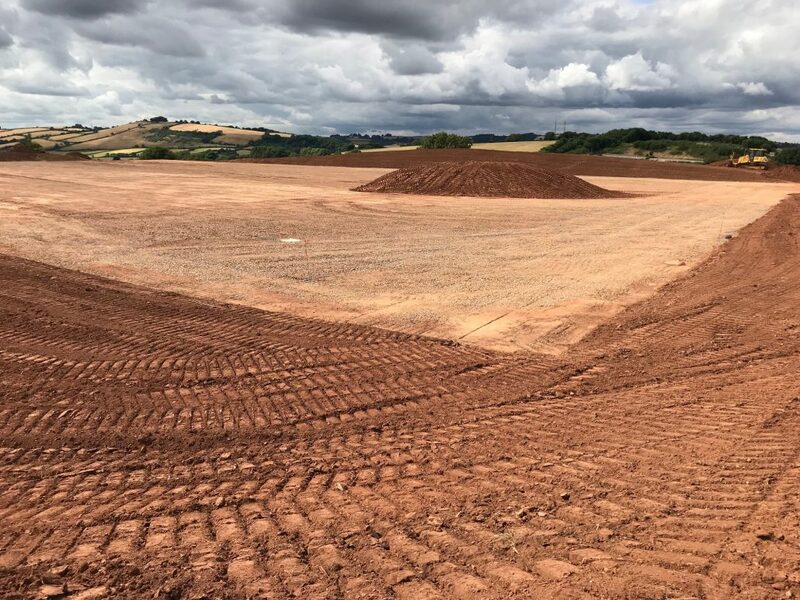 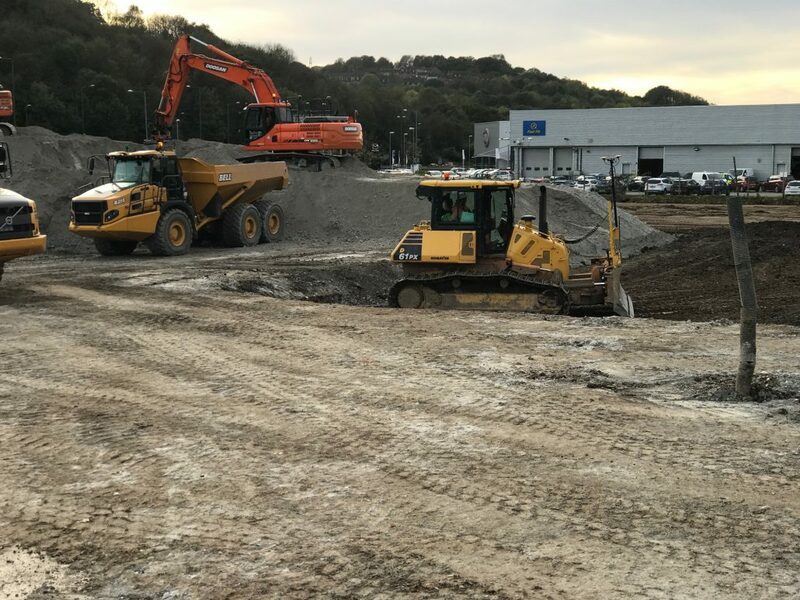 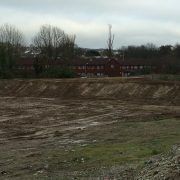 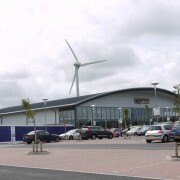 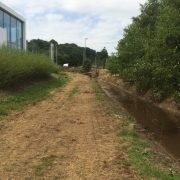 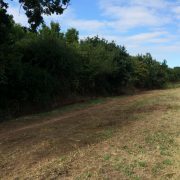 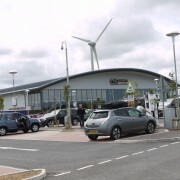 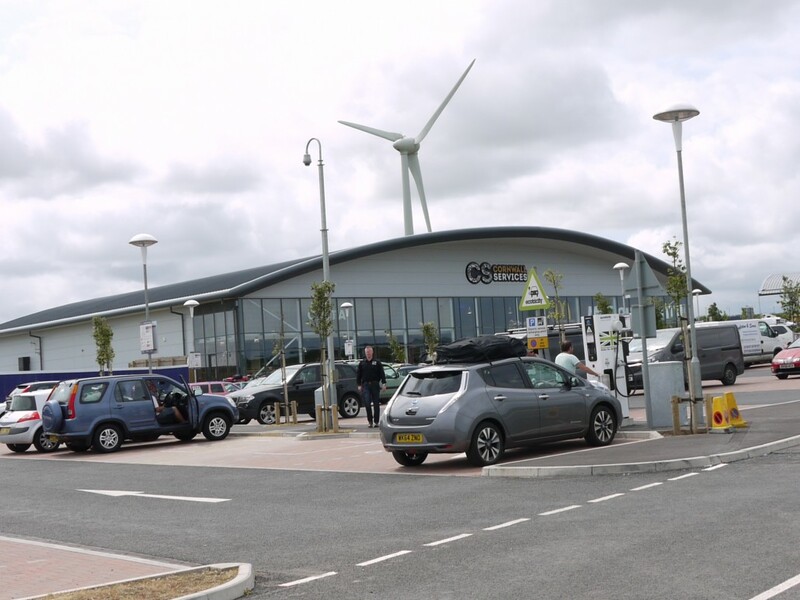 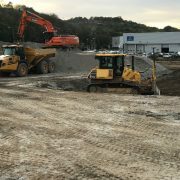 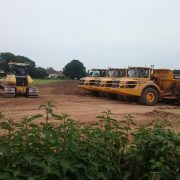 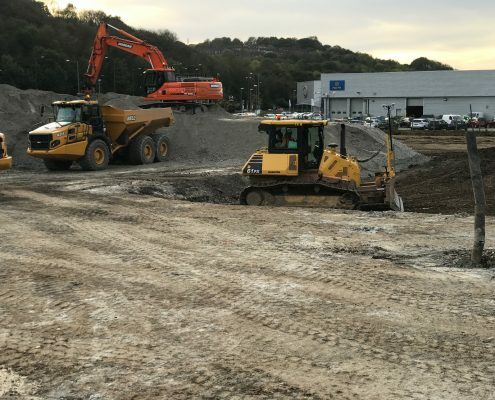 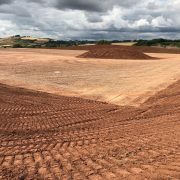 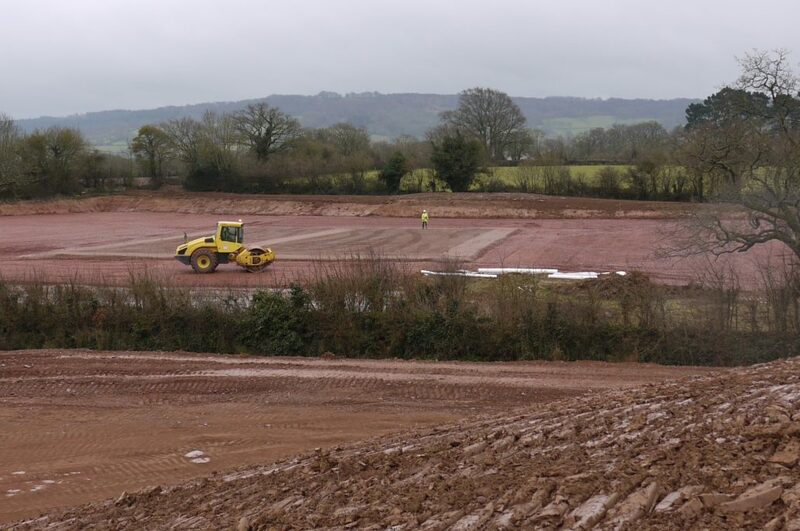 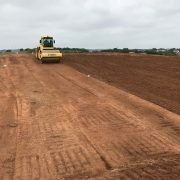 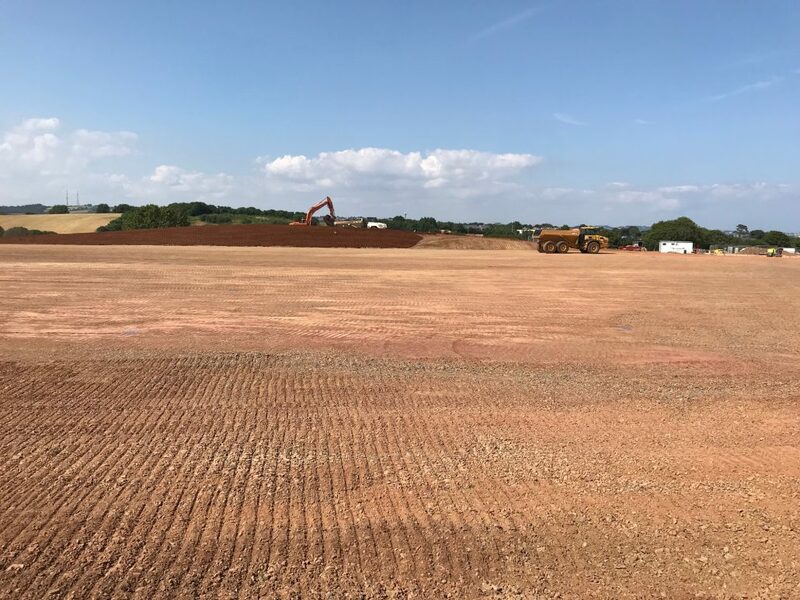 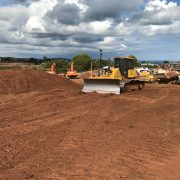 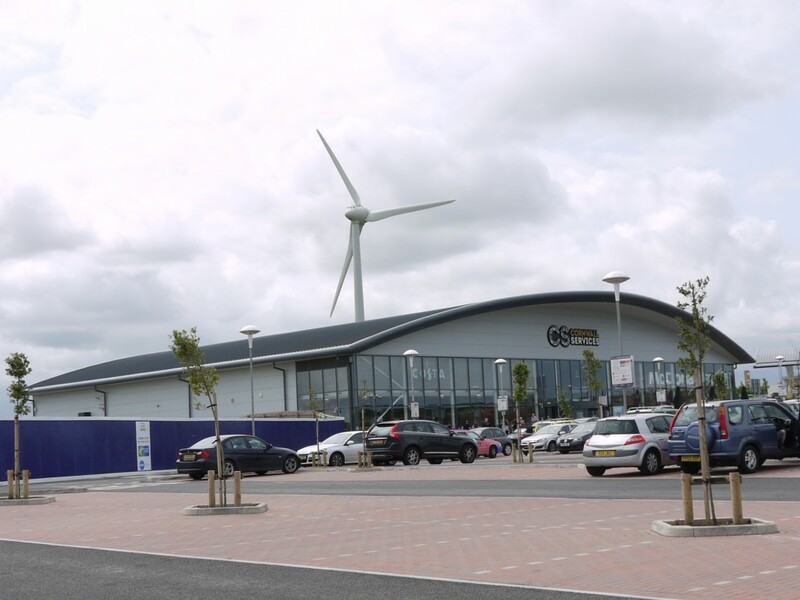 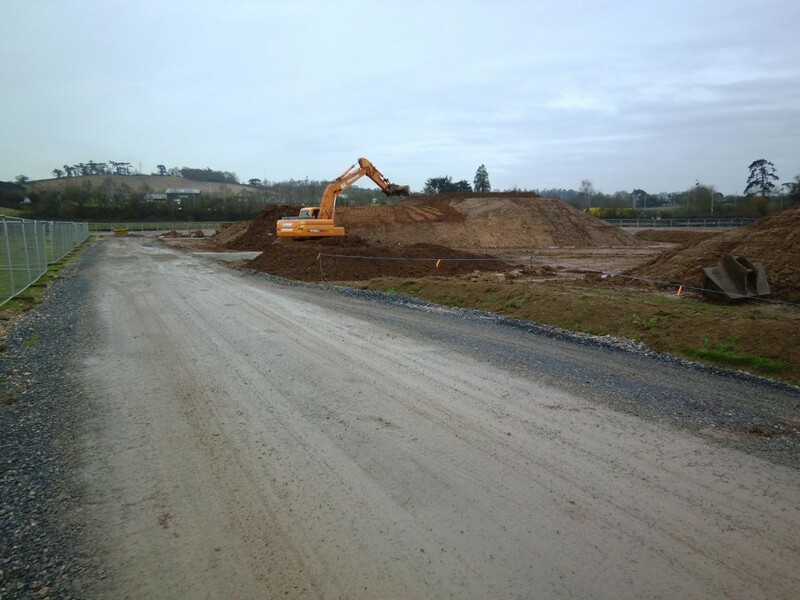 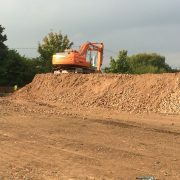 Initially the site was cleared and prepared to import 2,500m3 of subsoil to raise the site above the flood zone to facilitate a future commercial/retail development. 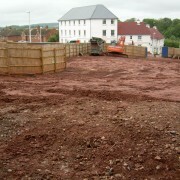 Material was sourced from another development site under a CL:aire application. 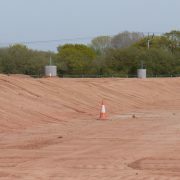 The site was revisited 6 months later to move the stockpile and was placed to a defined depth as surcharge on part of the development site. 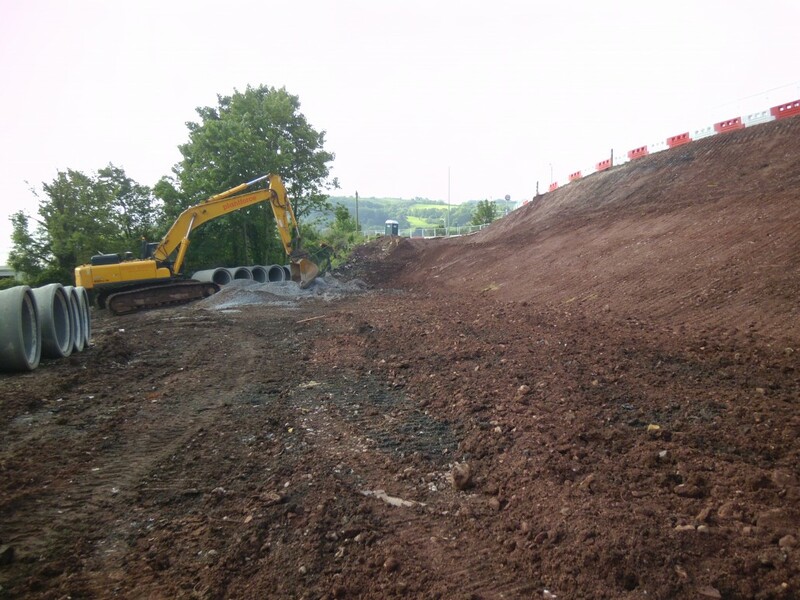 Remodelling of existing sloping field to form working platforms for Housing Development. 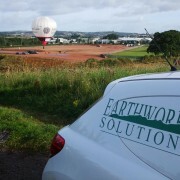 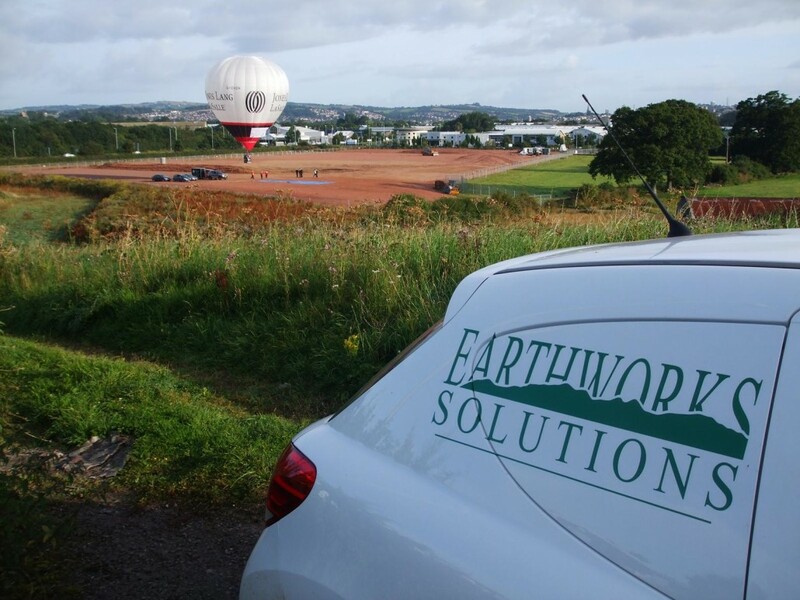 Earthworks Solutions provided a 3D model of the earthworks profile that was loaded onto a GPS machine controlled system. 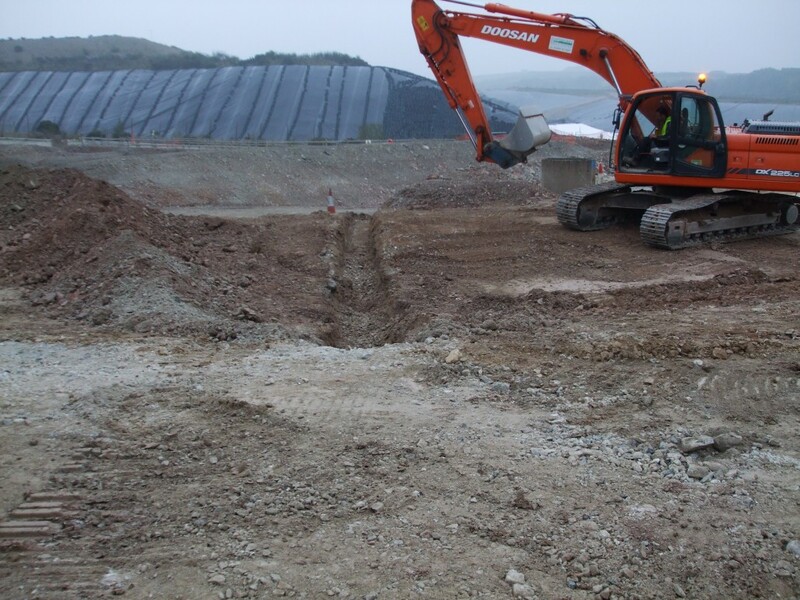 Each platform was excavated out with a 1:1 slope to the rear to enable the construction of a RC retaining wall. 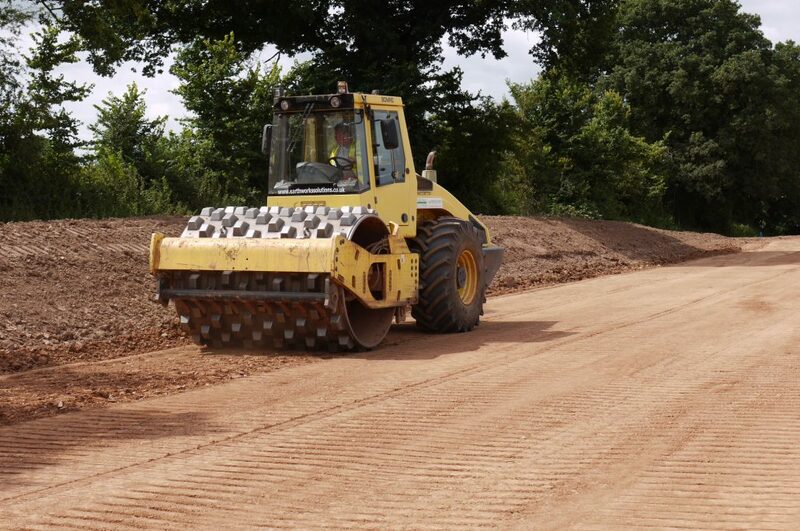 All estate roads were cut to formation level with an agreed depth of protection layer to protect the formation due to the time of year. 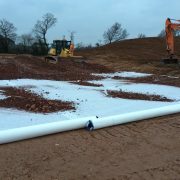 Excavated material that was oversize and not immediately suitable for filling was placed to stockpile for processing and for incorporating within the fill areas on site. 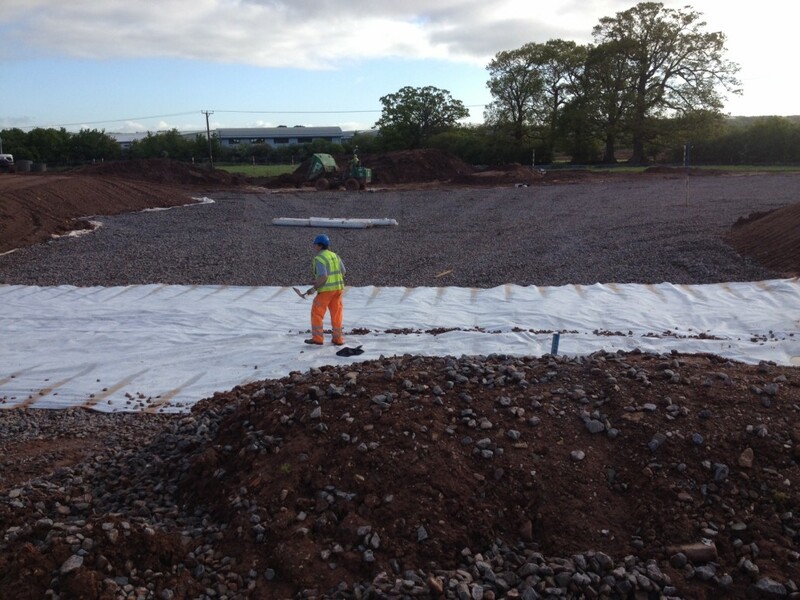 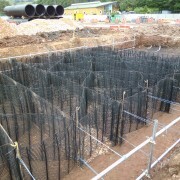 Materials for processing were screened to 75mm down for use within the fill areas on site. 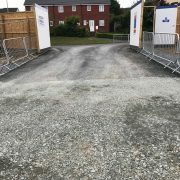 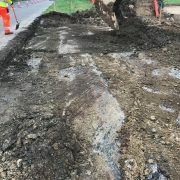 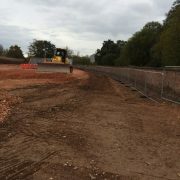 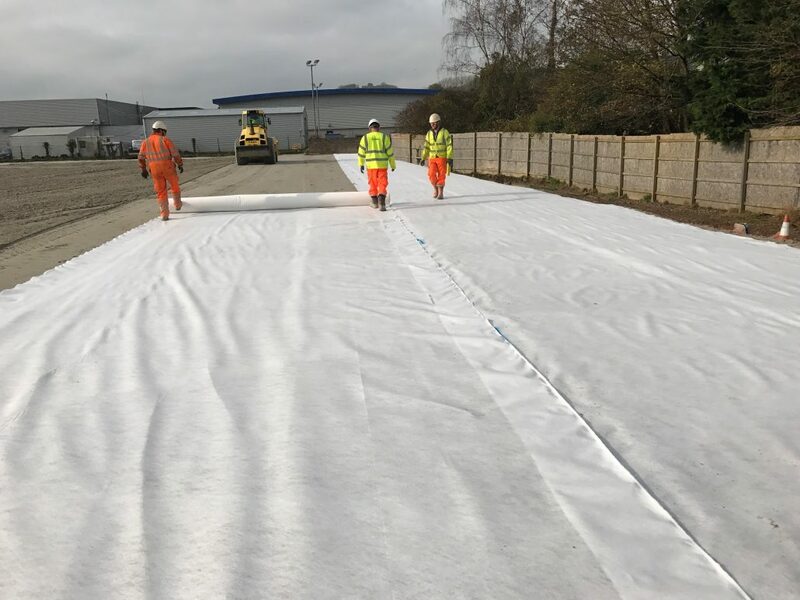 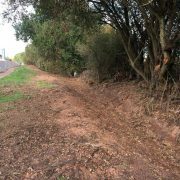 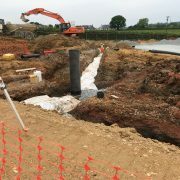 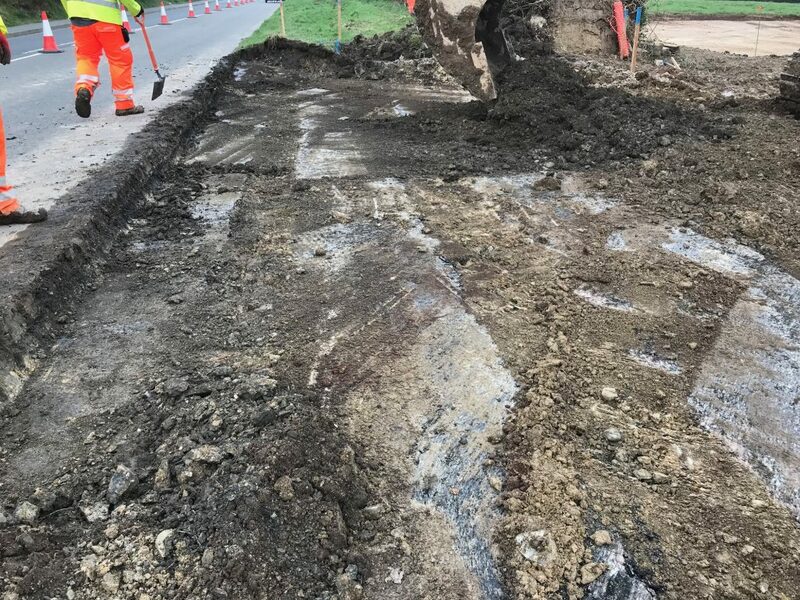 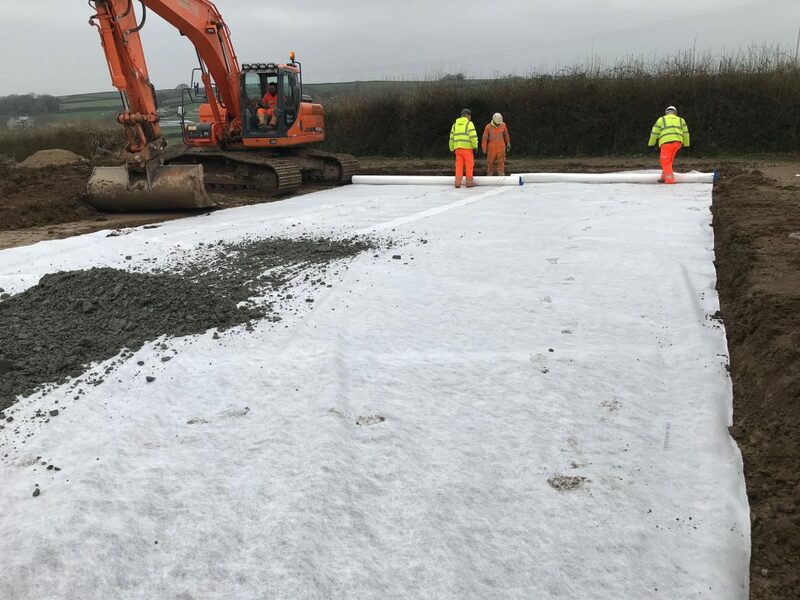 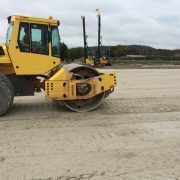 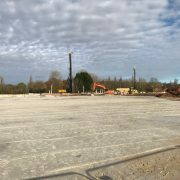 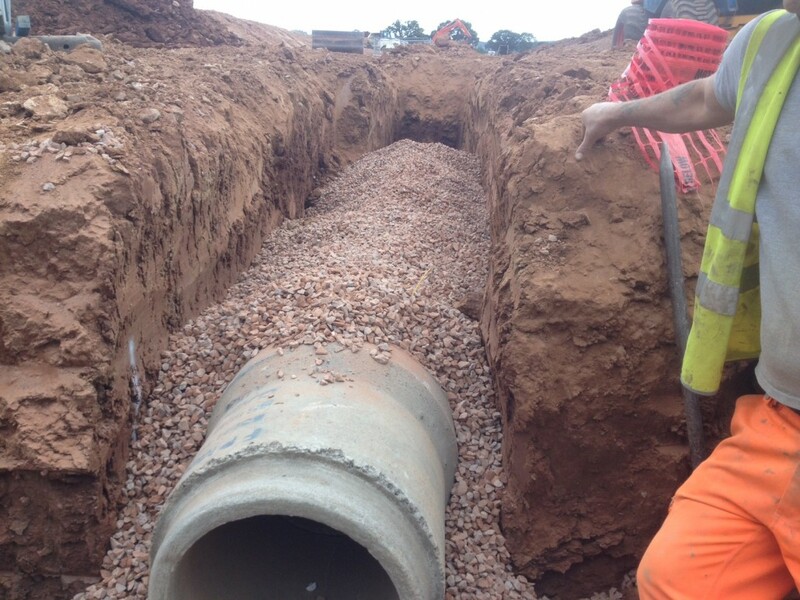 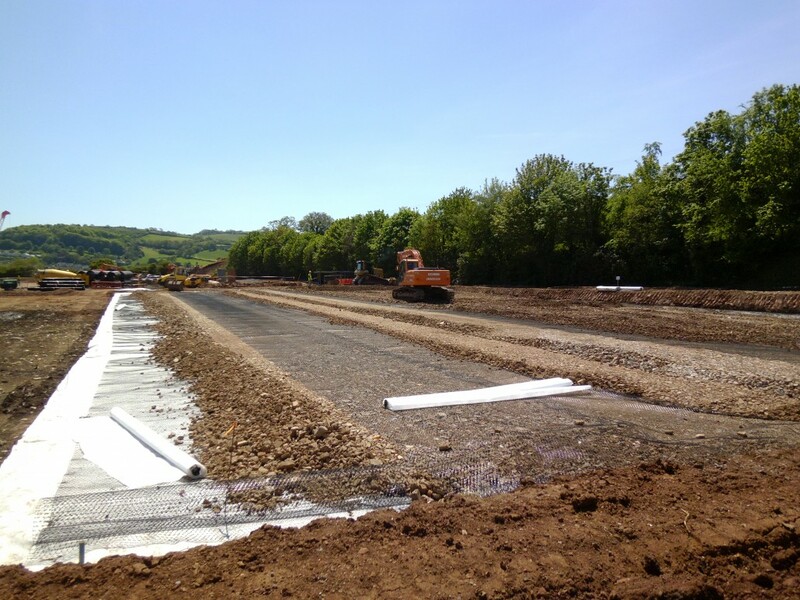 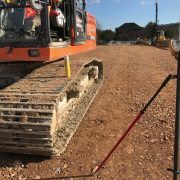 All site won suitable fill material was placed to Specification for Highways Works and tested for conformity by an independent Engineer prior to continuing. 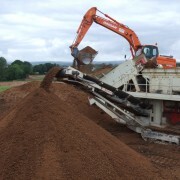 Surplus topsoil was either spread to landscape areas on site or disposed off site. 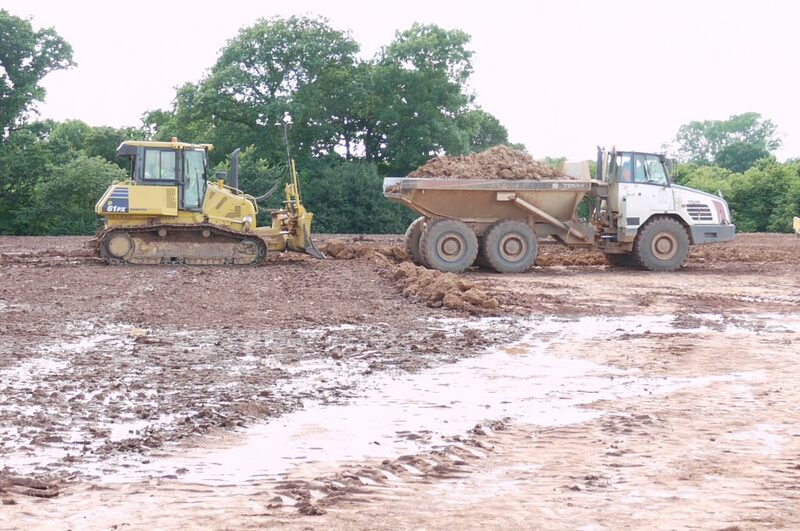 All surplus unsuitable soils were disposed off site to licensed premises. 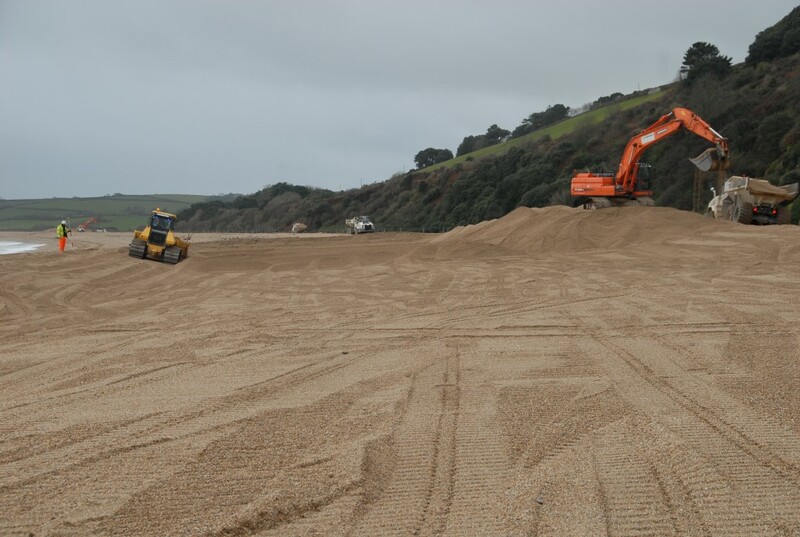 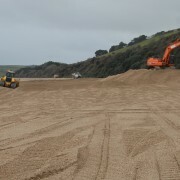 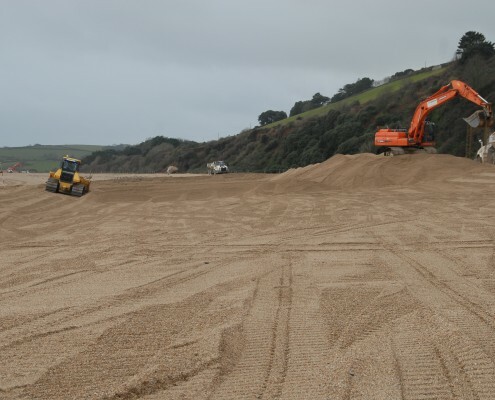 Prepare site for various loading/deposition points along Slapton Sands. 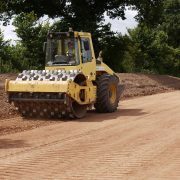 Place roped sleepers to protect protected flora from vehicle movements. 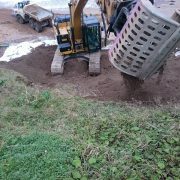 Excavate shingle from above the MHWL at the Northern end of Slapton sands. 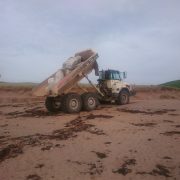 Haul approximately 1500m along shingle beach to loading point at point of public car park. 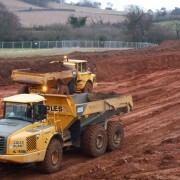 Load into road lorries and haul 3.5km and tip to Torcross. 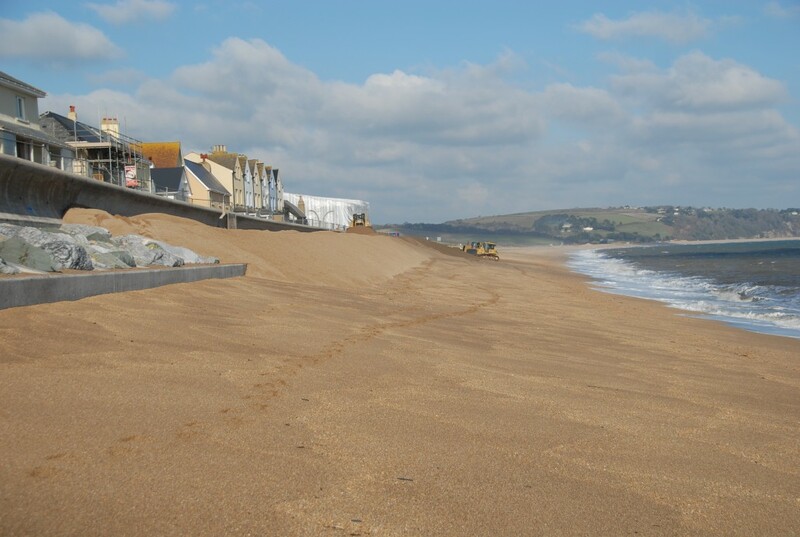 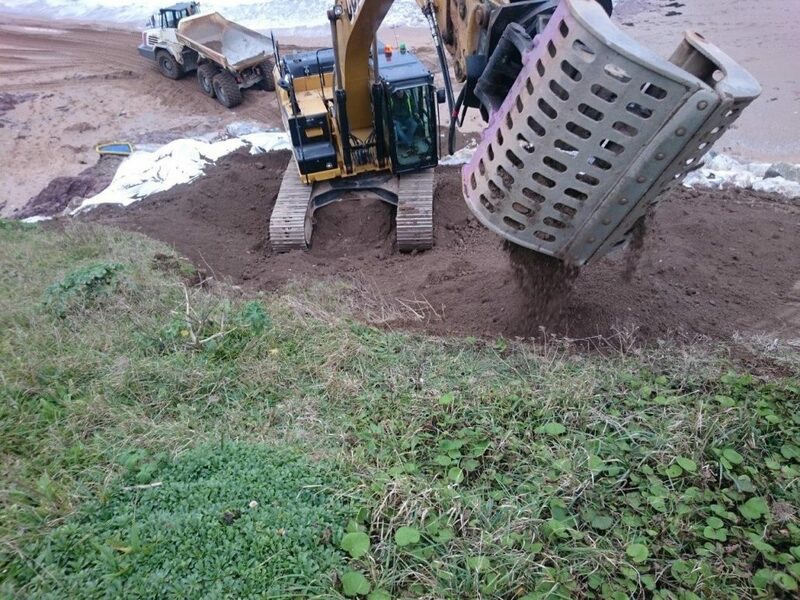 Shift shingle with dozers along the length of Torcross sea defence wall to afford greater protection. 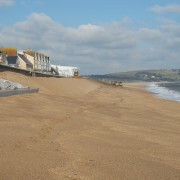 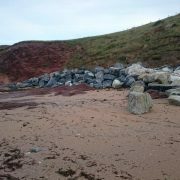 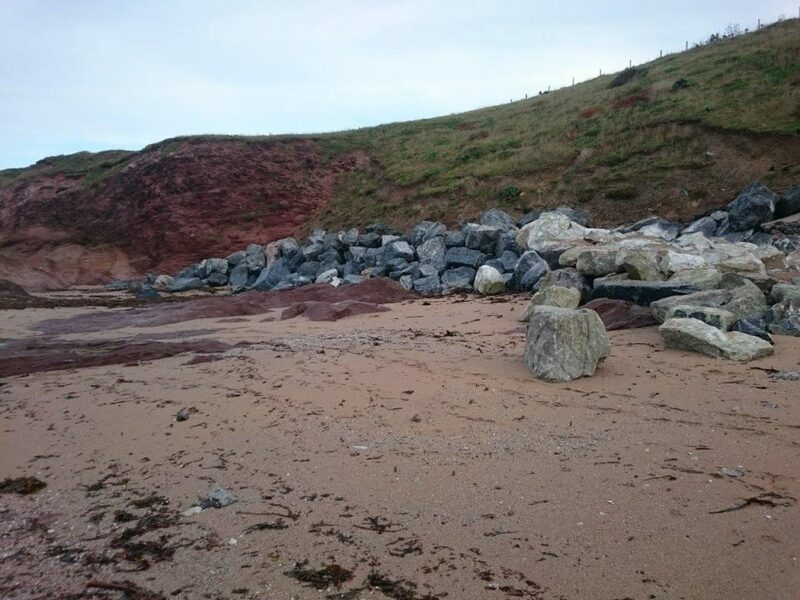 Form a number of shingle bastions at key points along Slapton Sands to counter long shore drift. 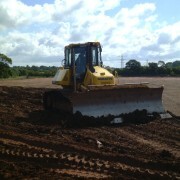 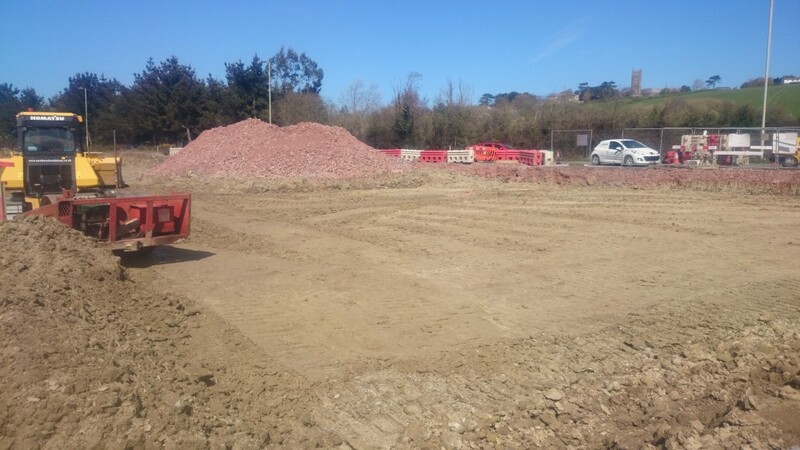 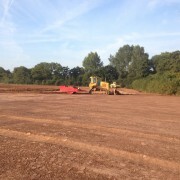 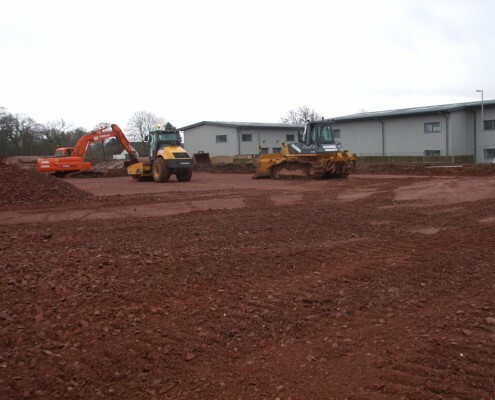 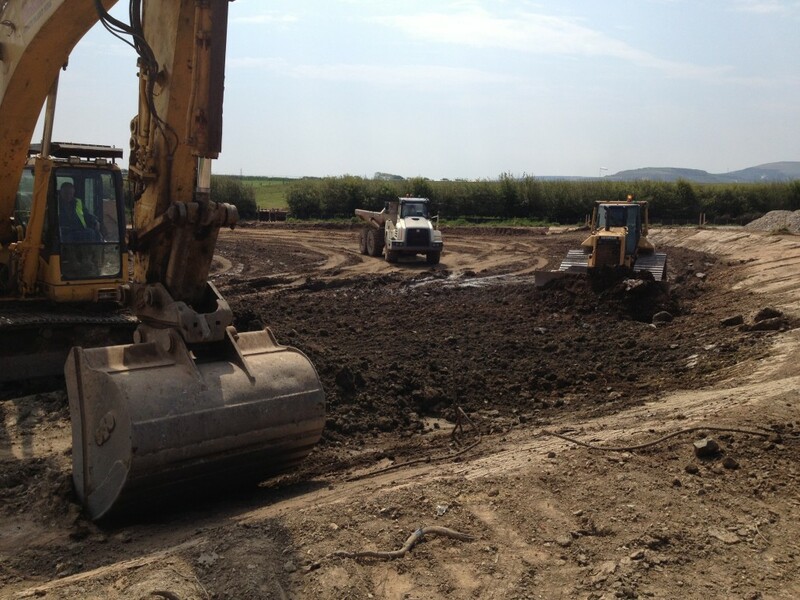 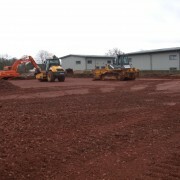 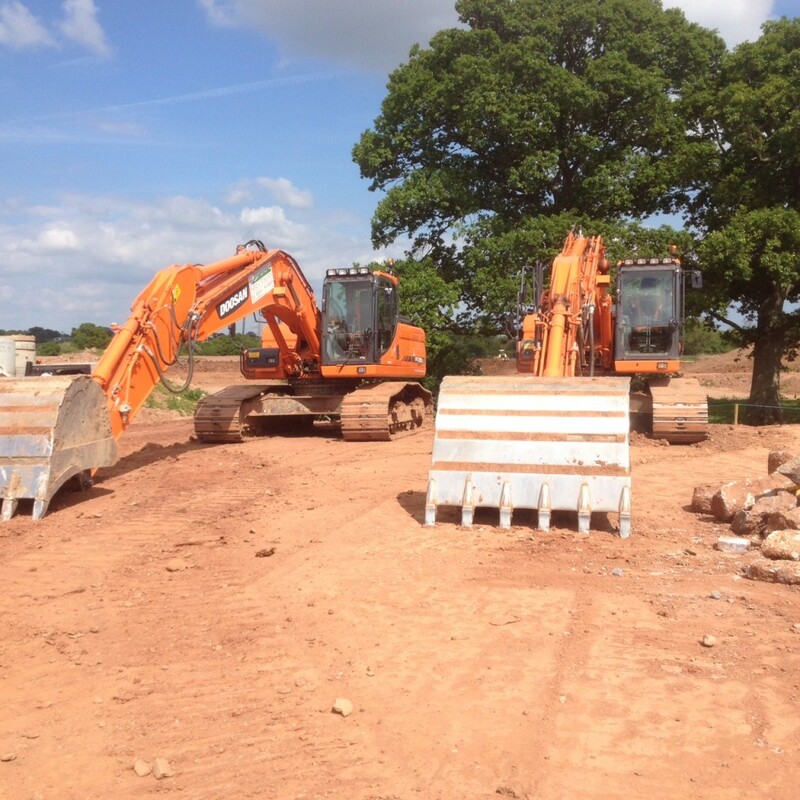 Site preparation for new commercial development on a Greenfield site. 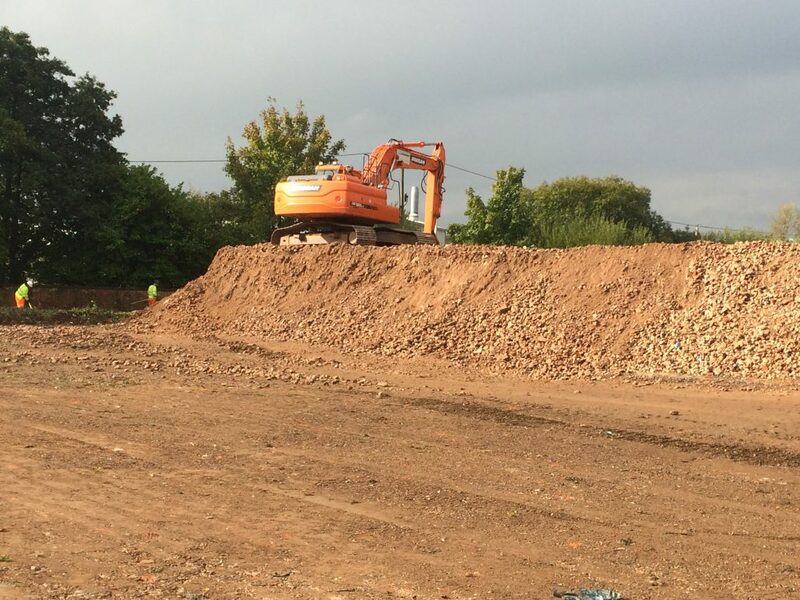 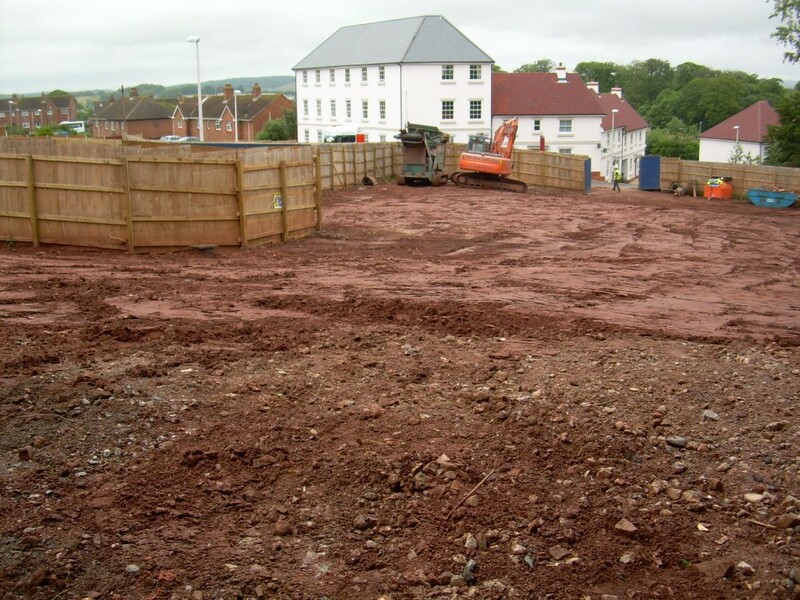 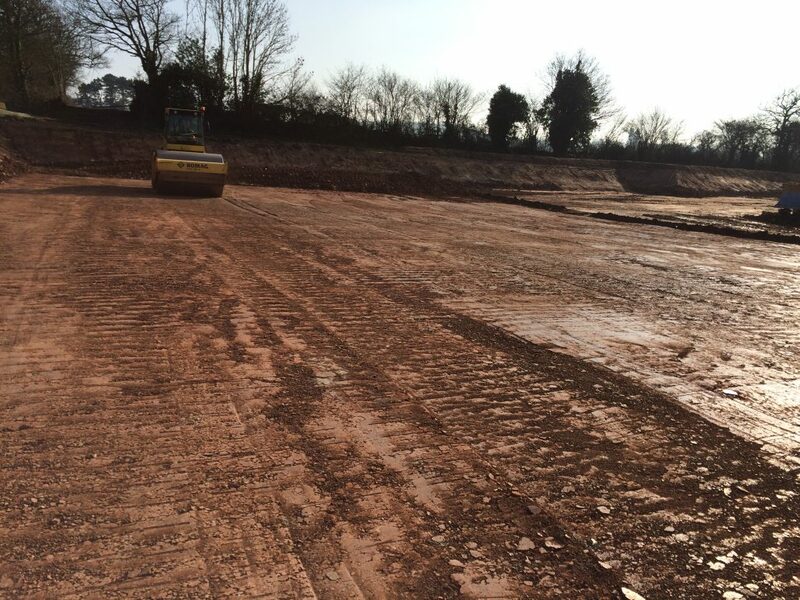 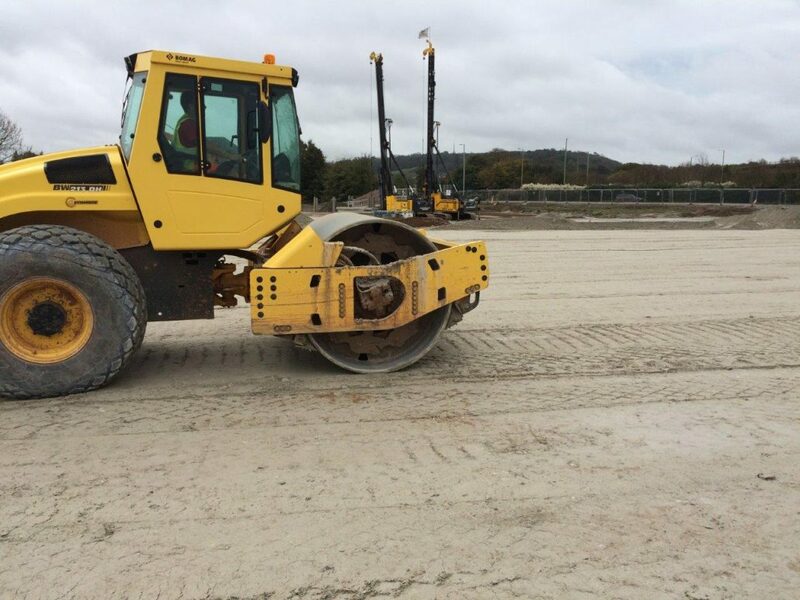 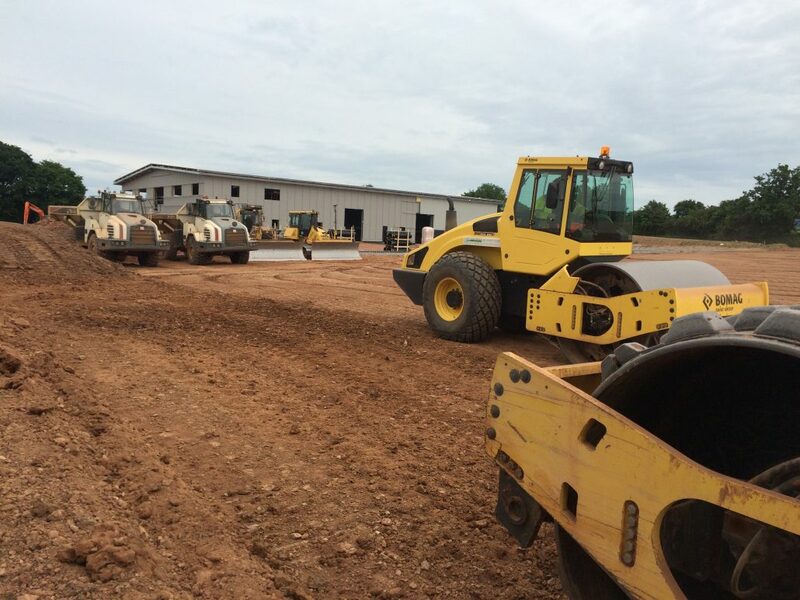 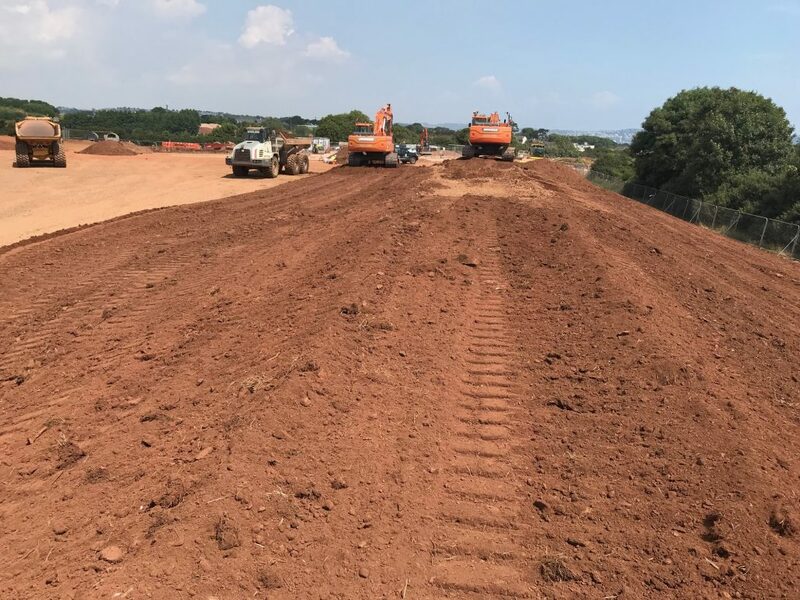 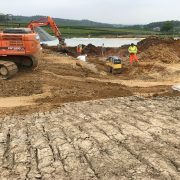 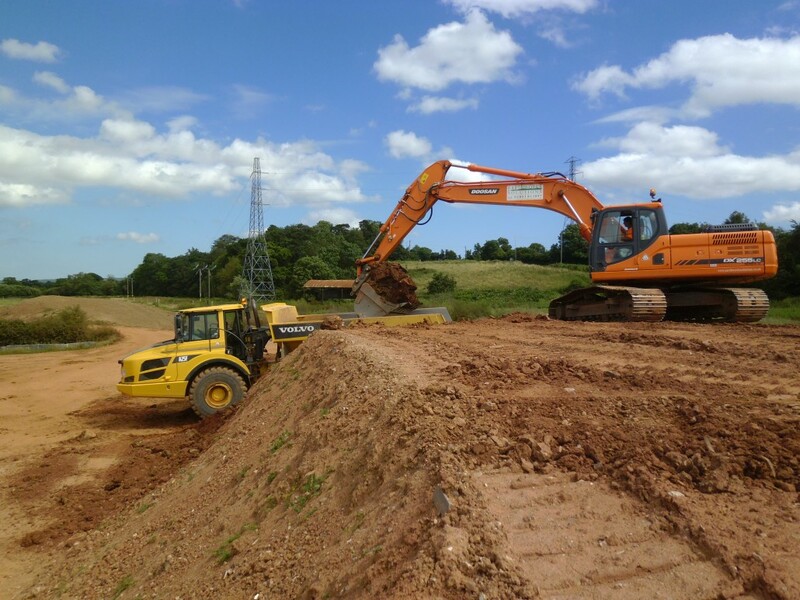 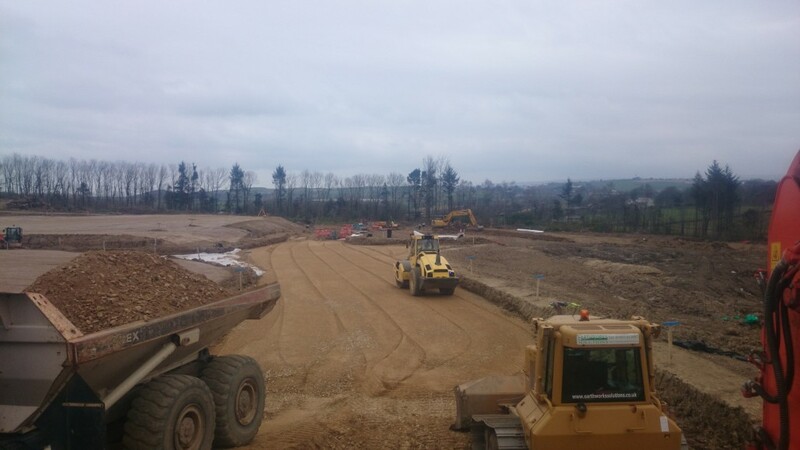 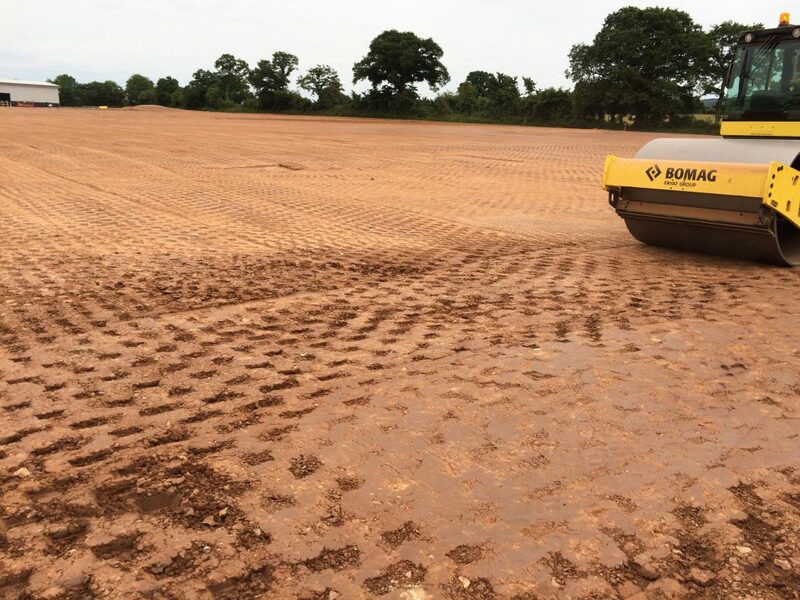 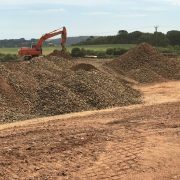 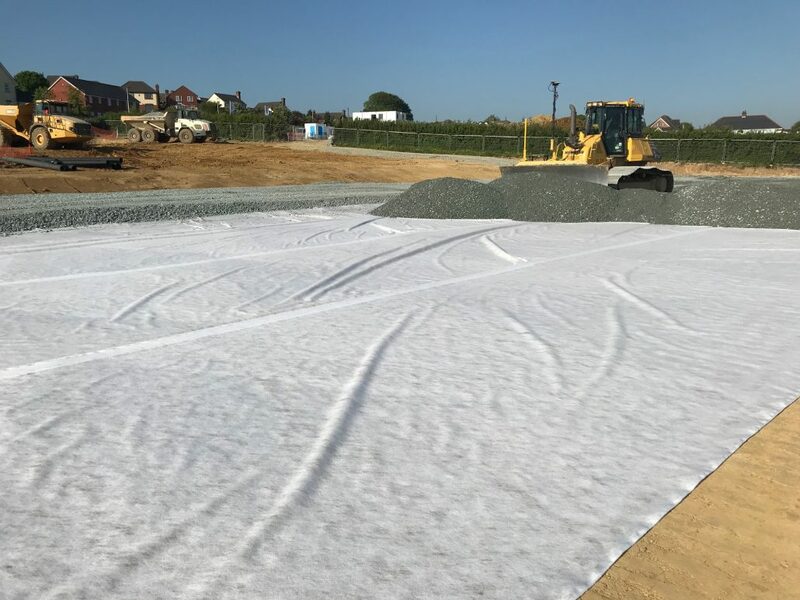 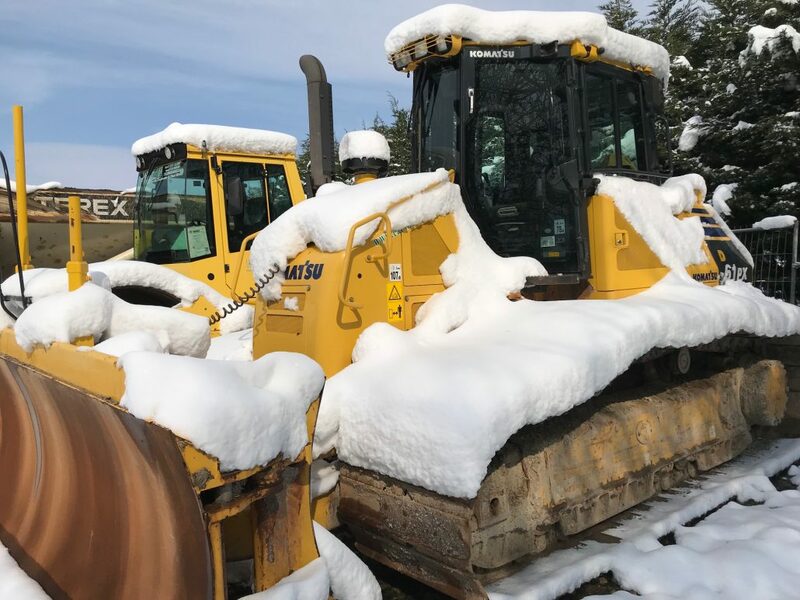 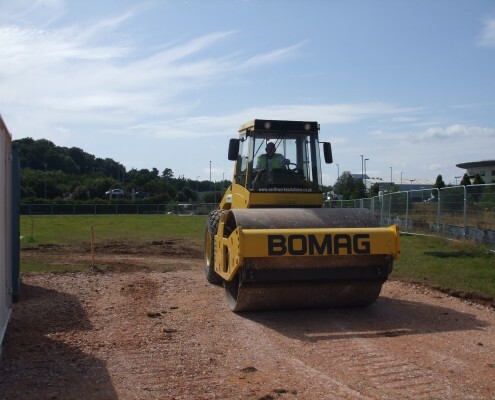 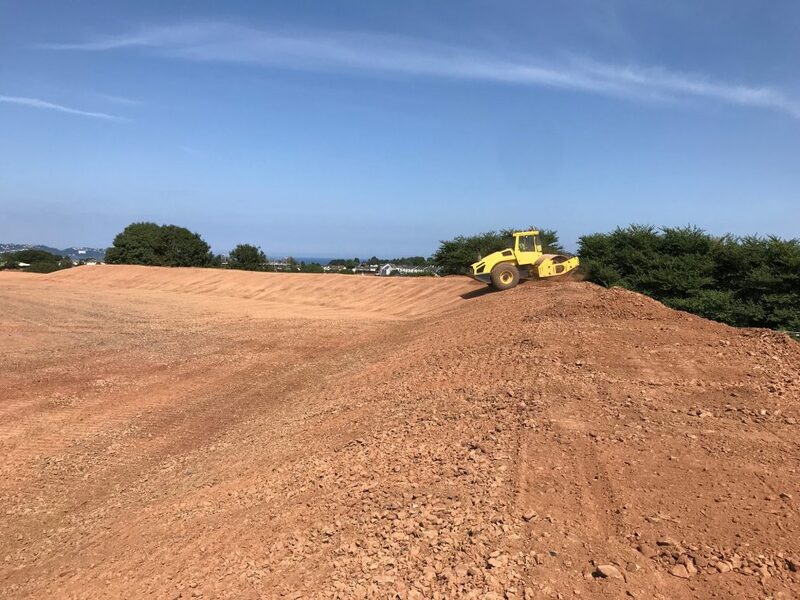 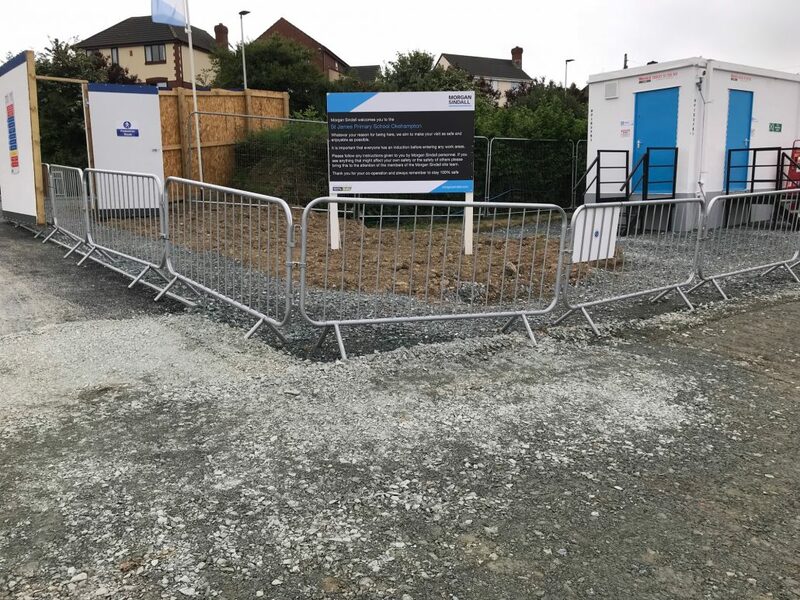 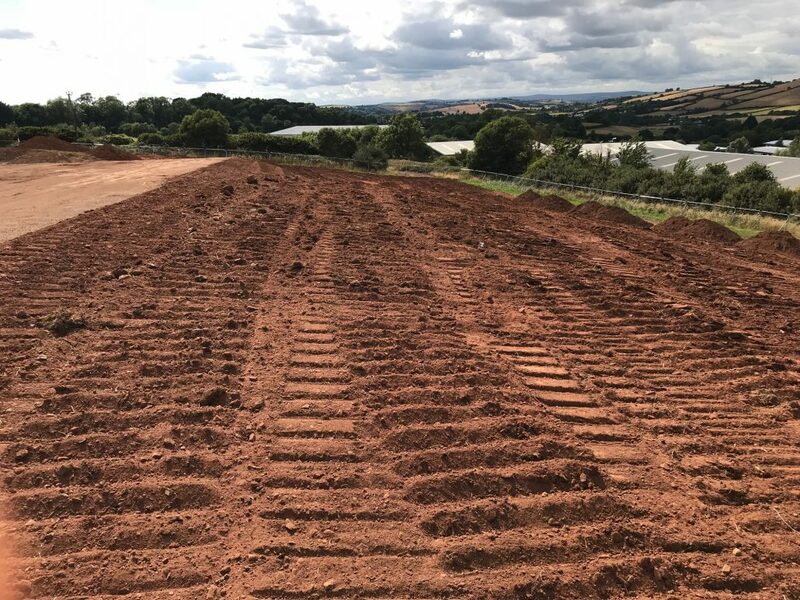 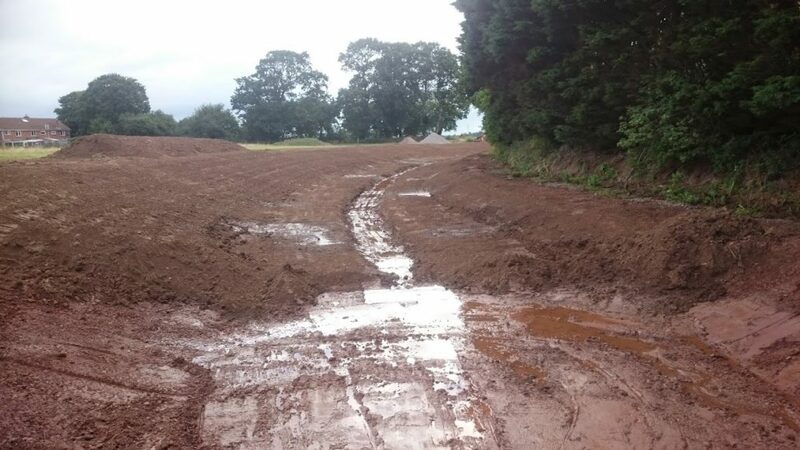 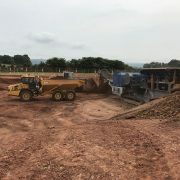 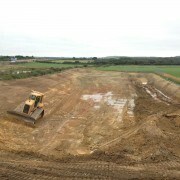 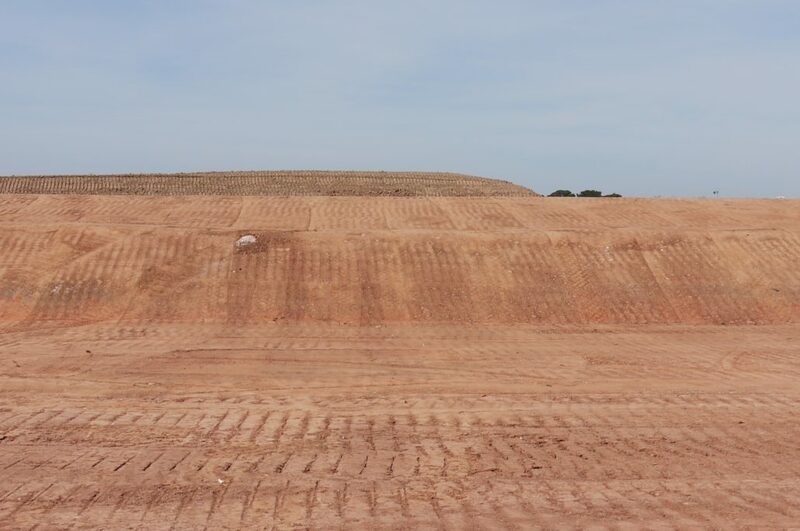 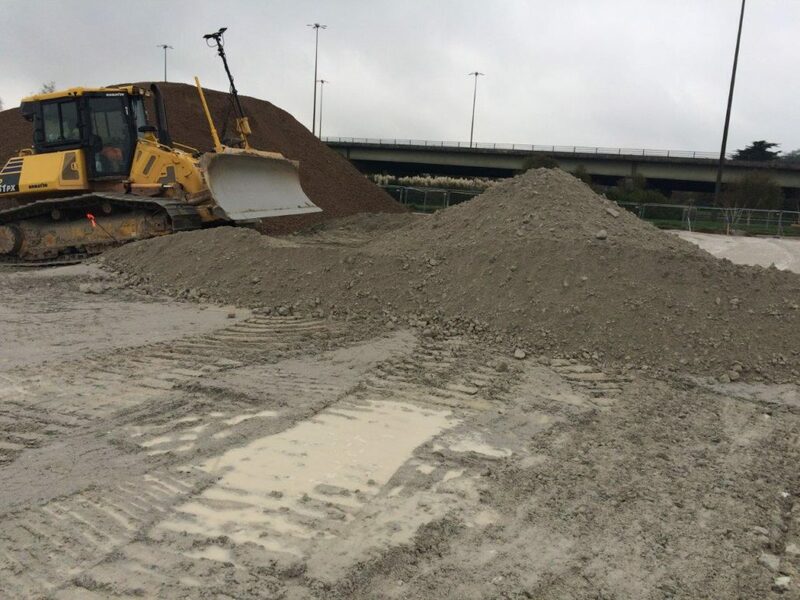 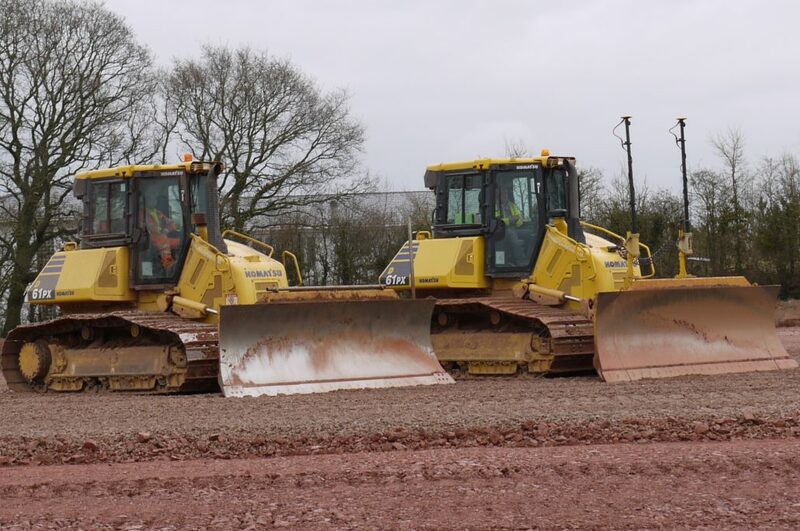 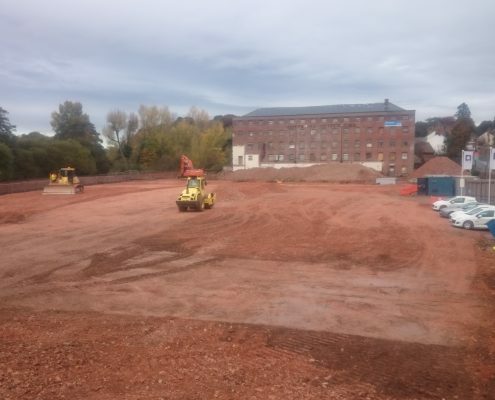 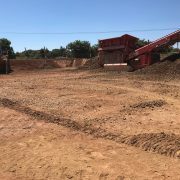 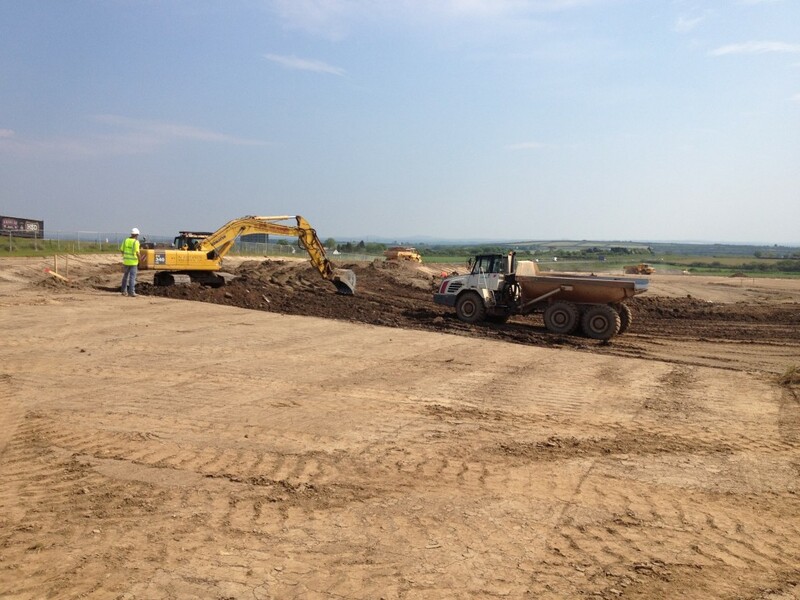 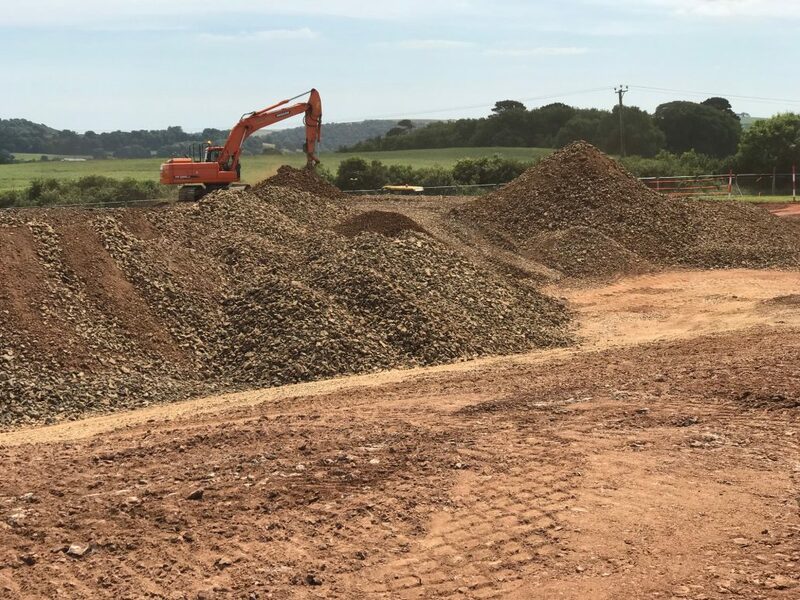 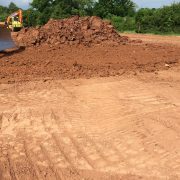 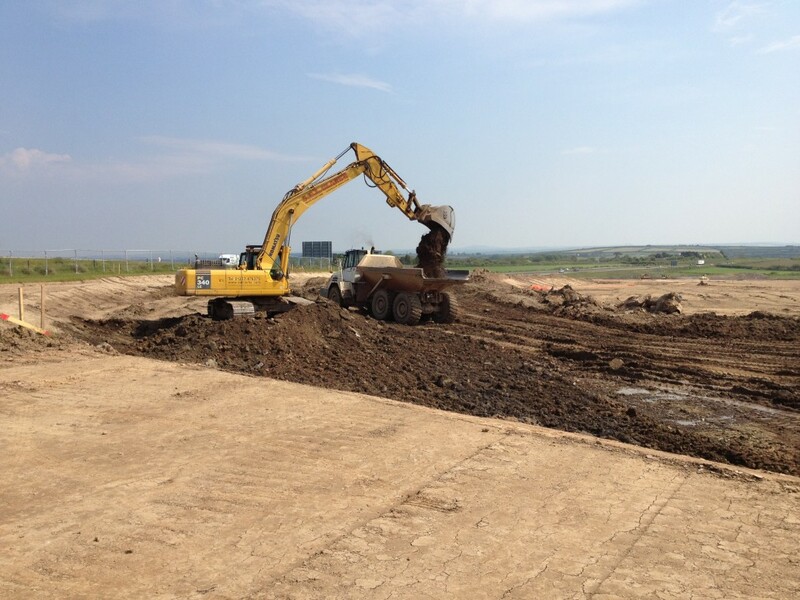 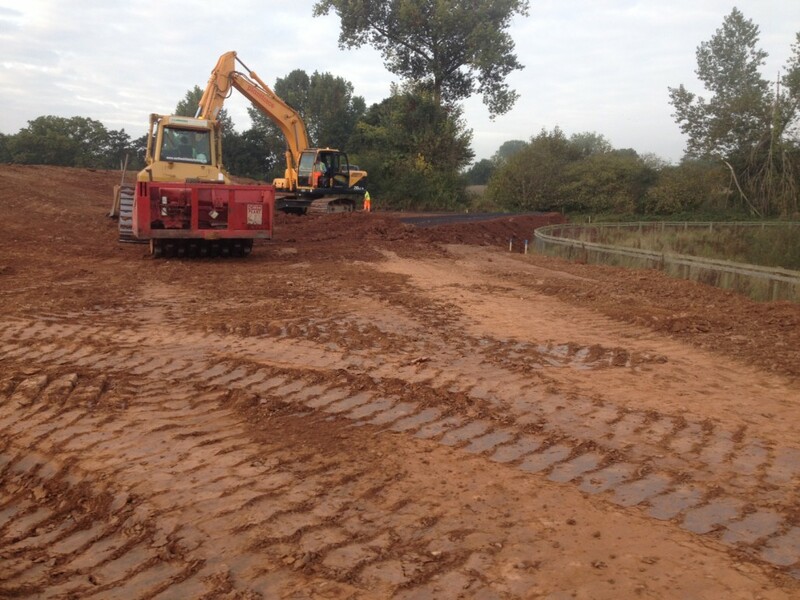 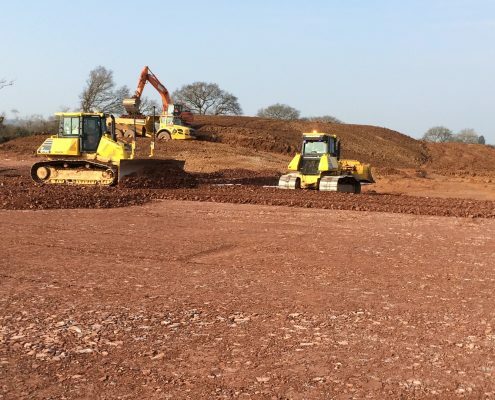 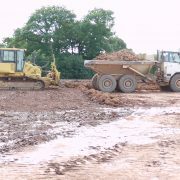 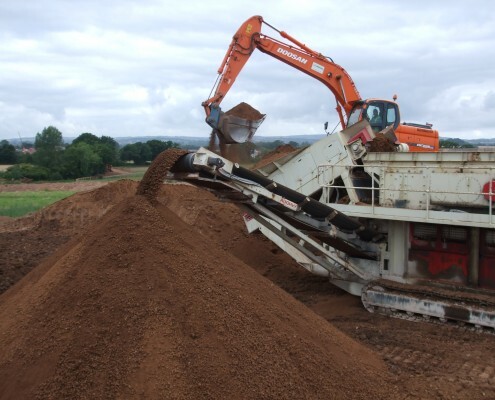 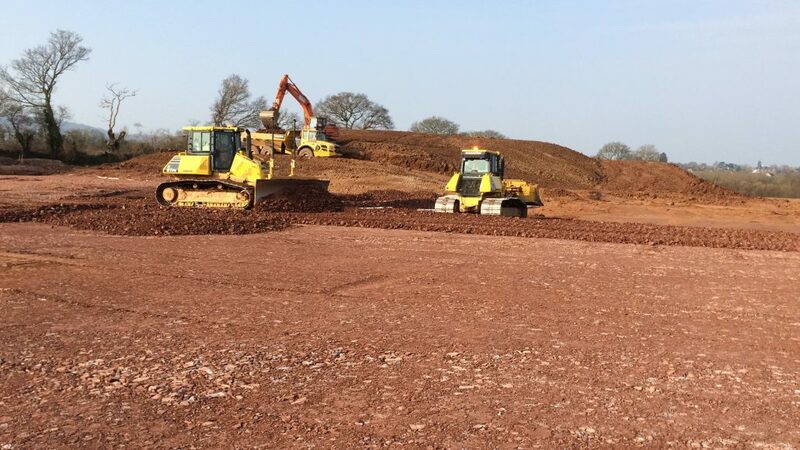 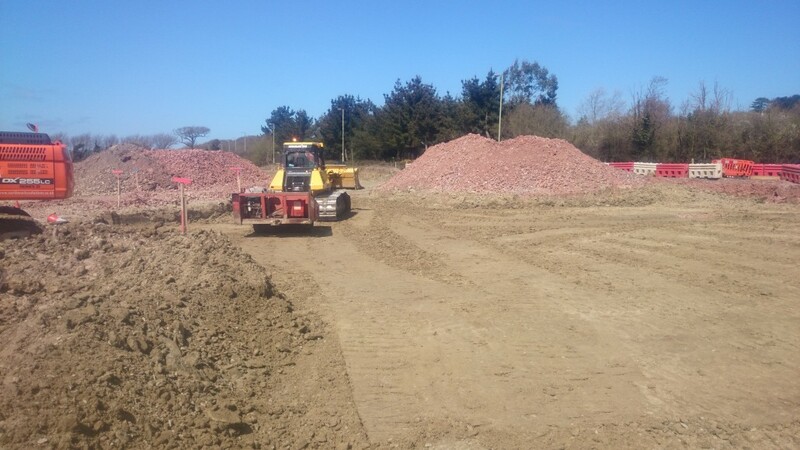 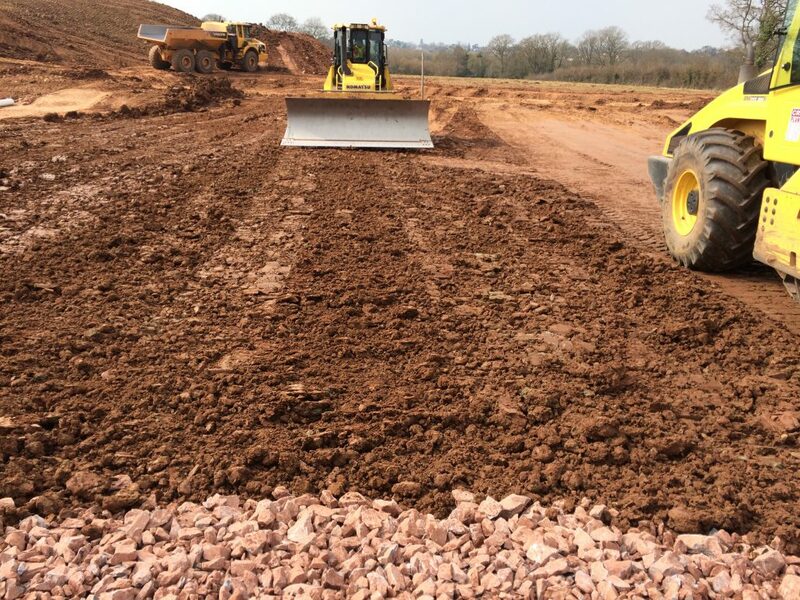 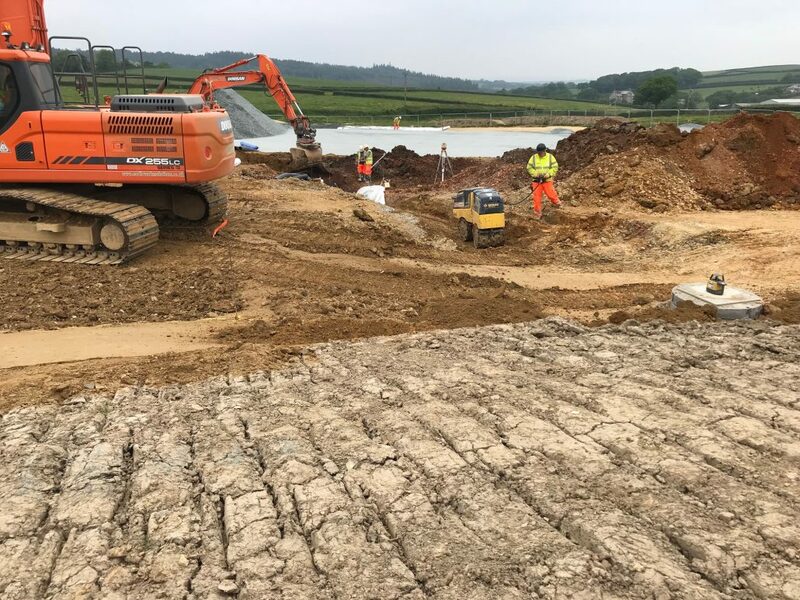 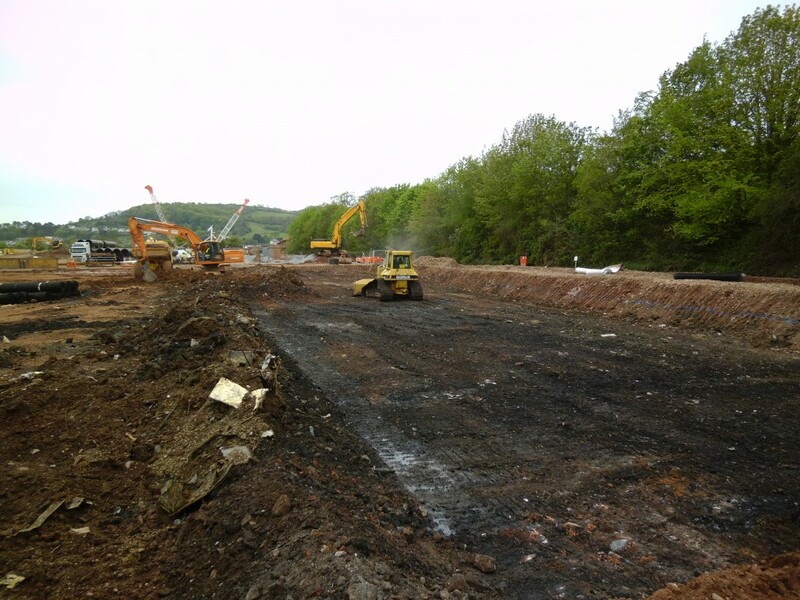 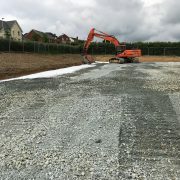 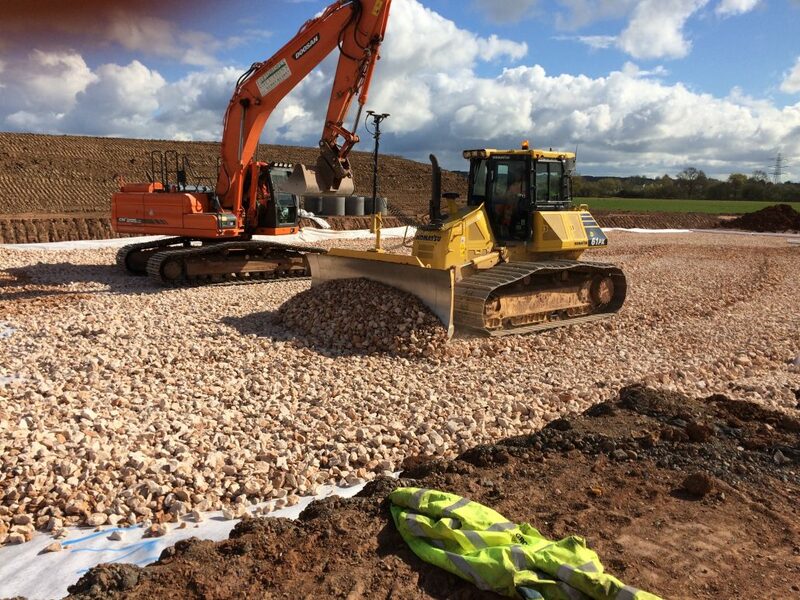 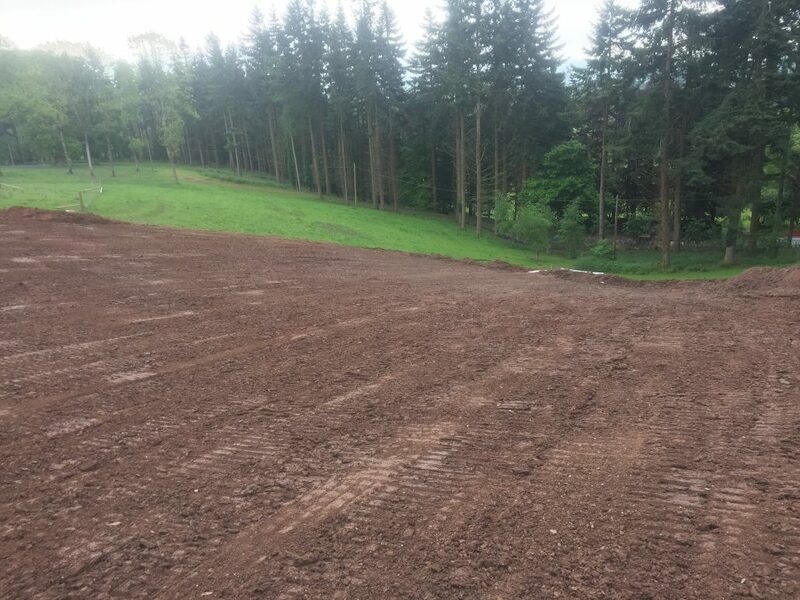 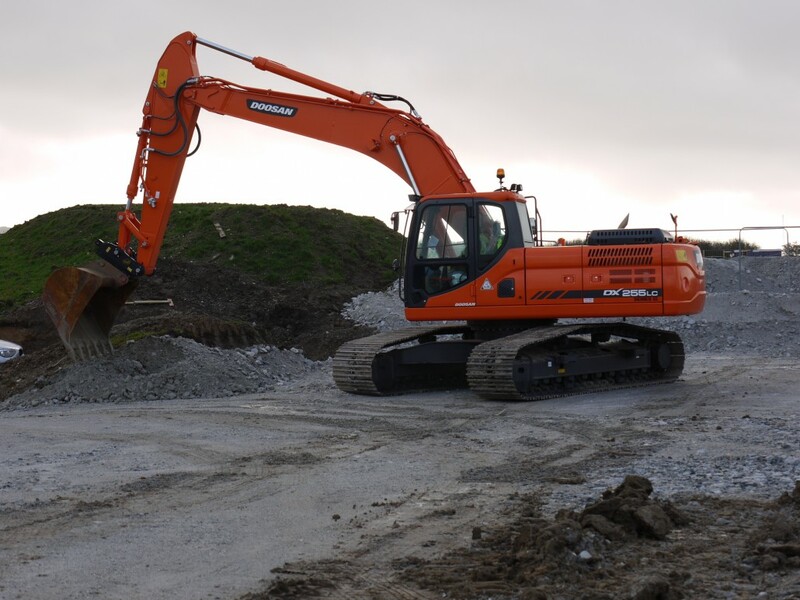 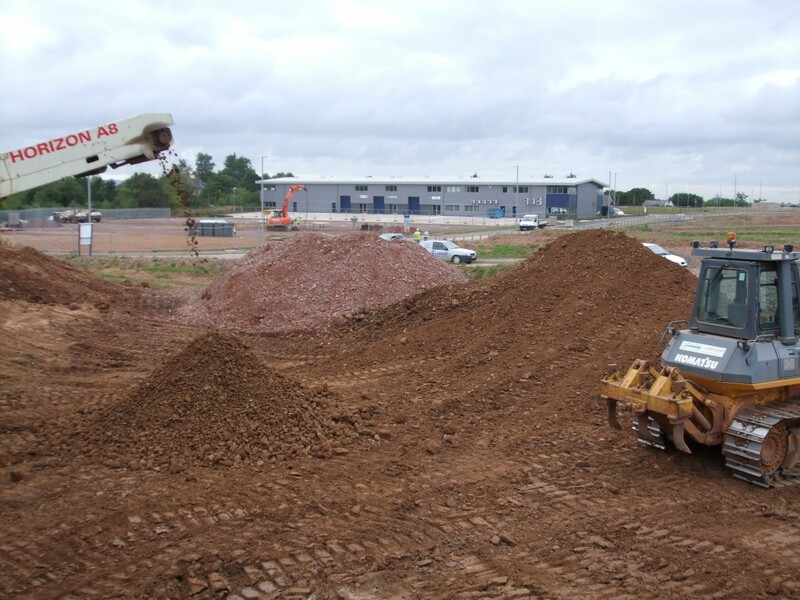 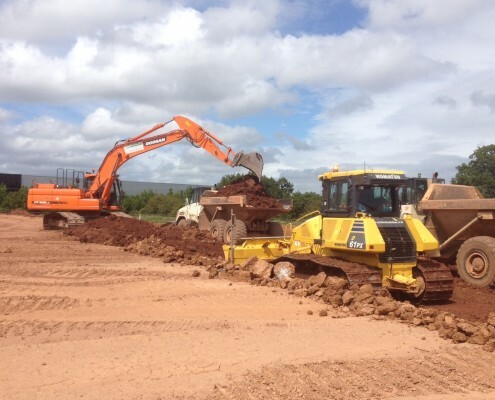 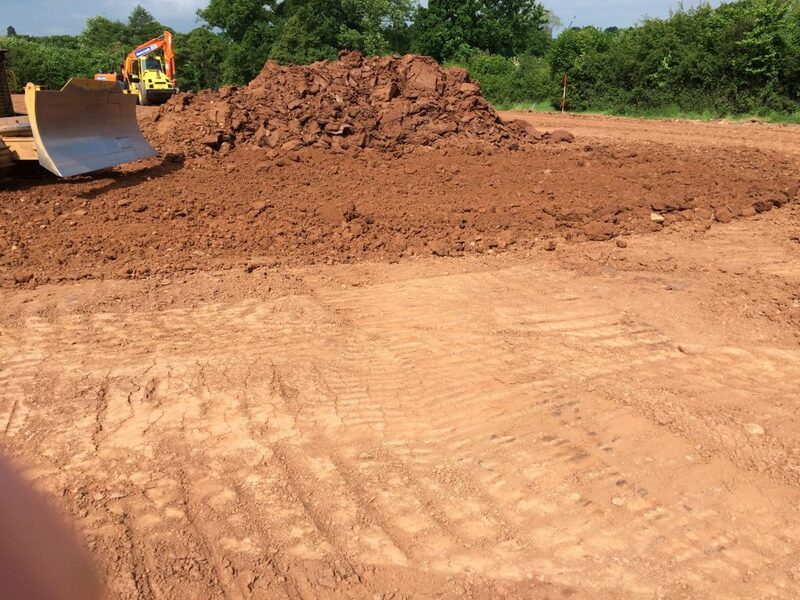 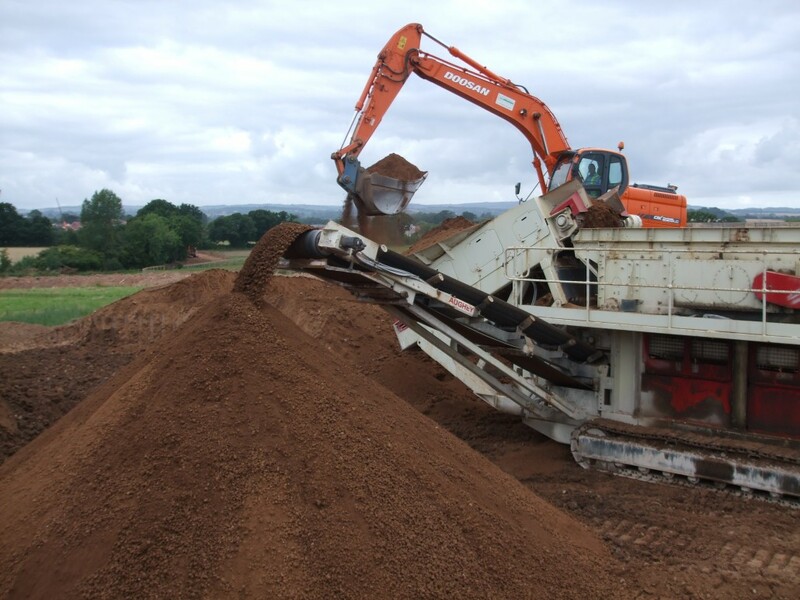 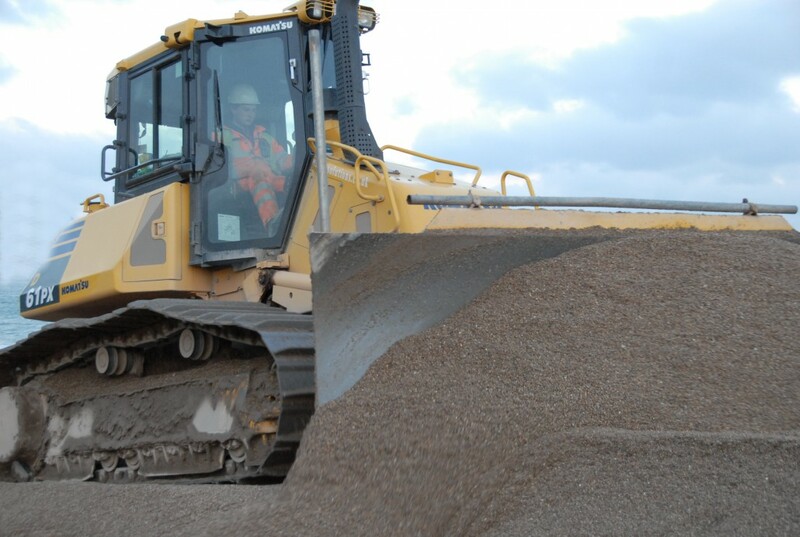 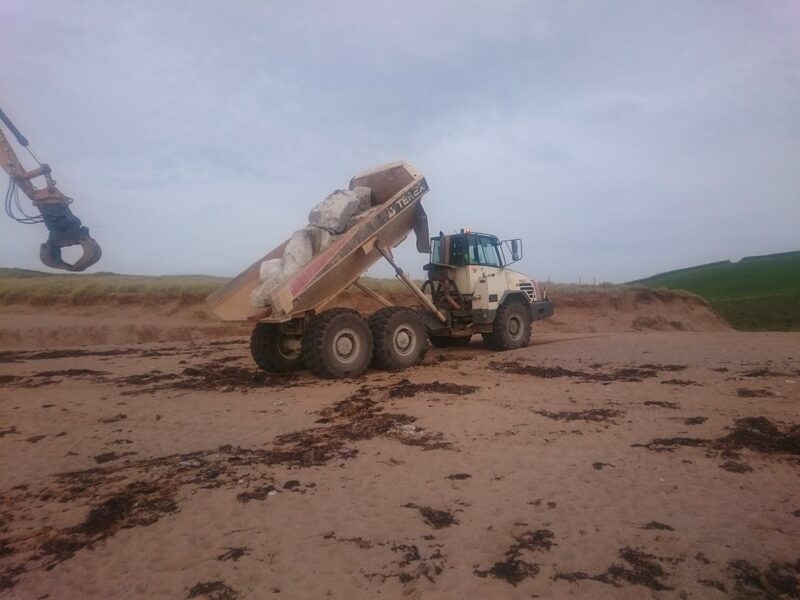 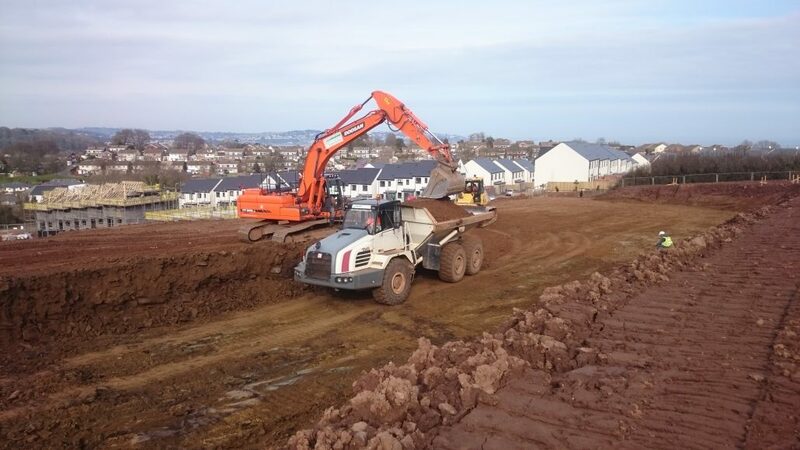 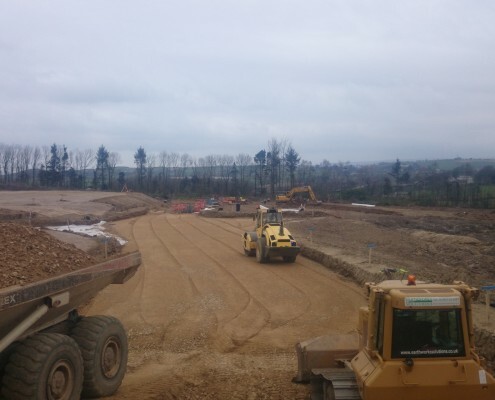 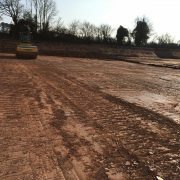 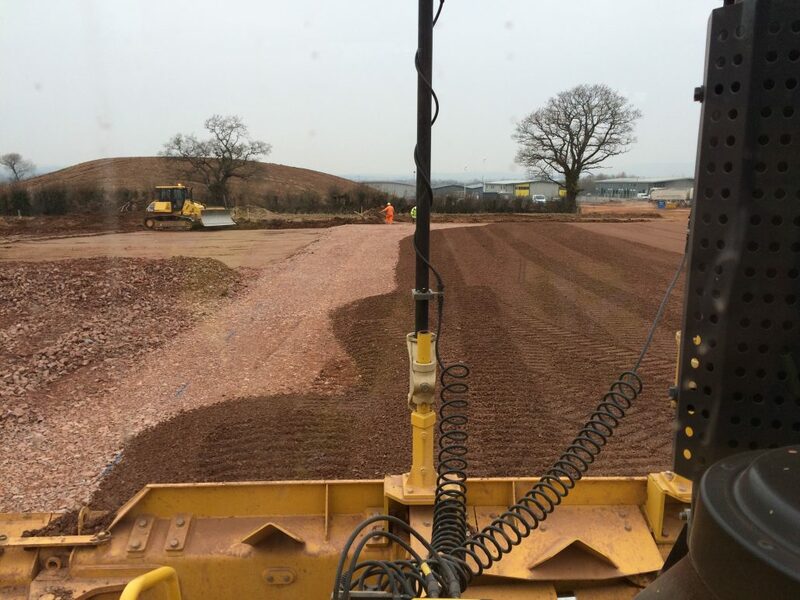 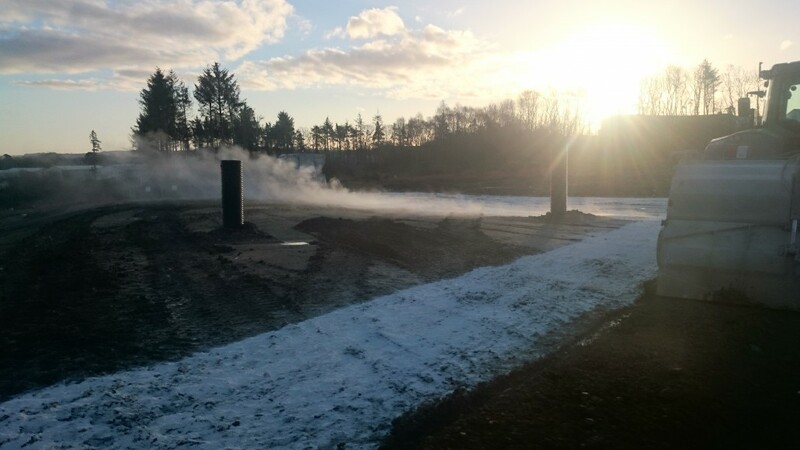 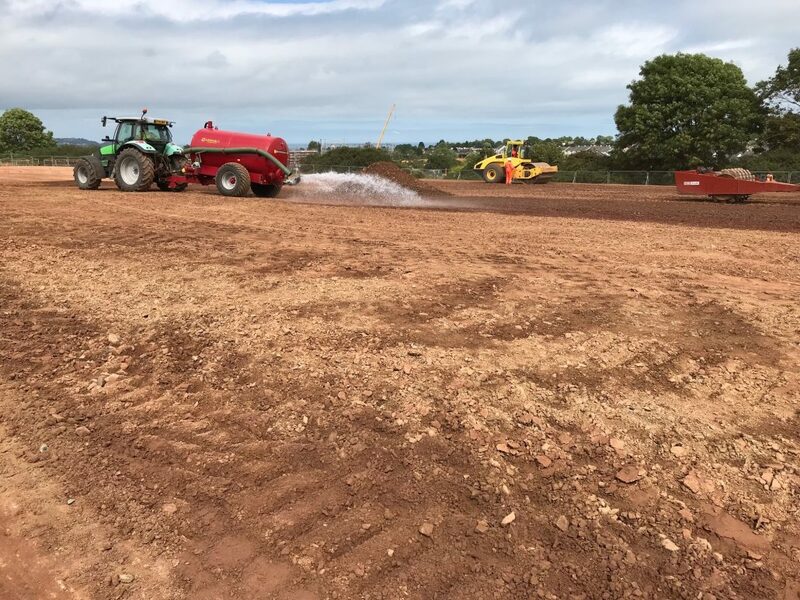 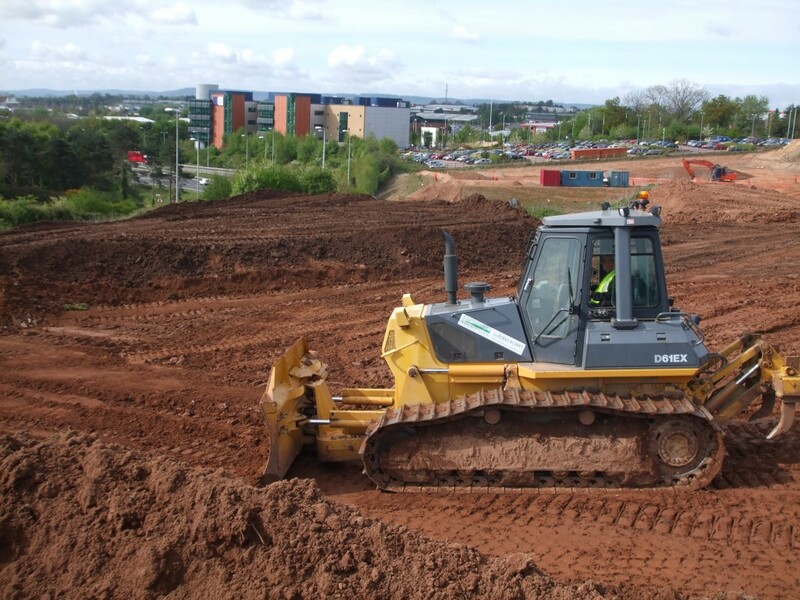 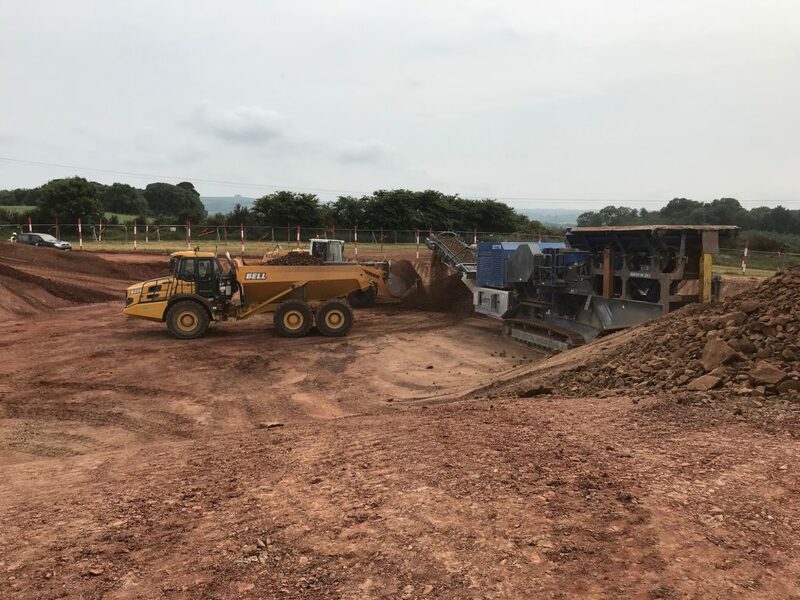 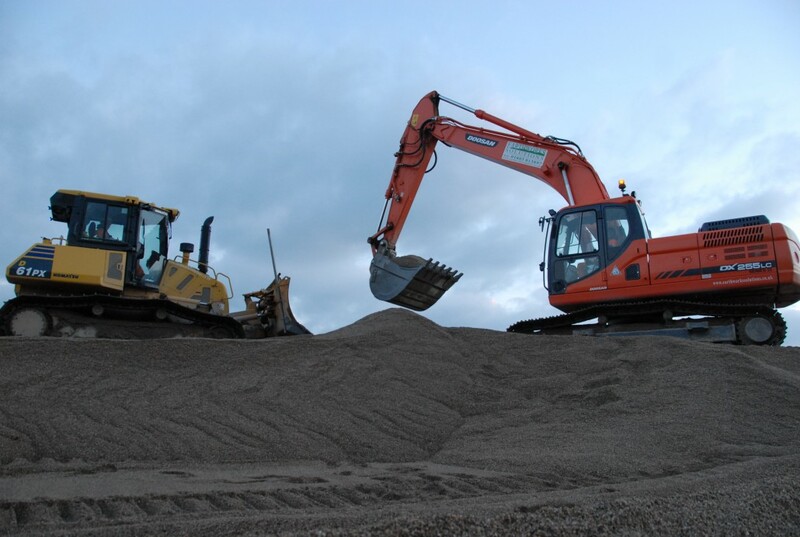 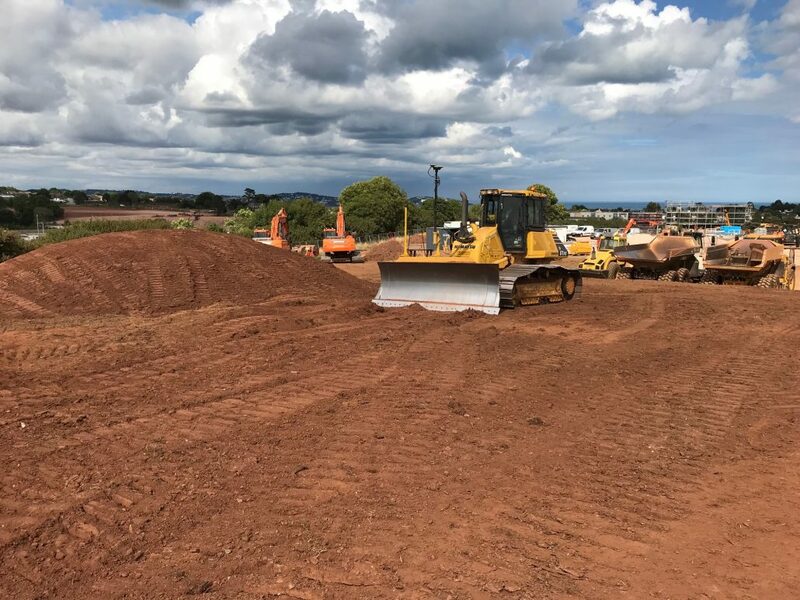 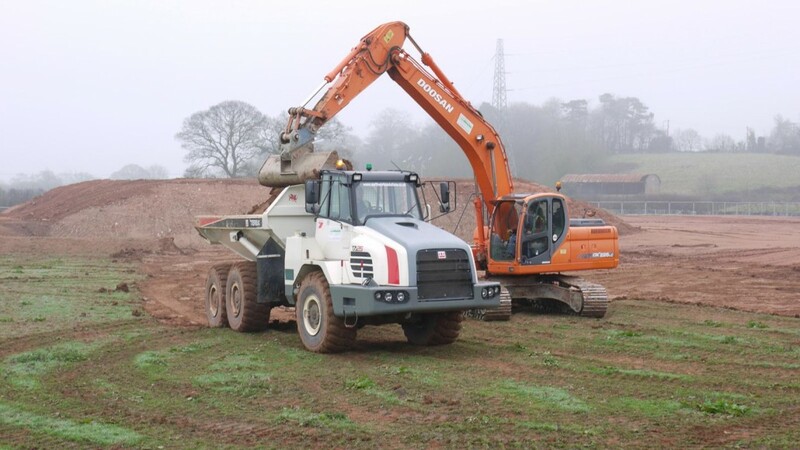 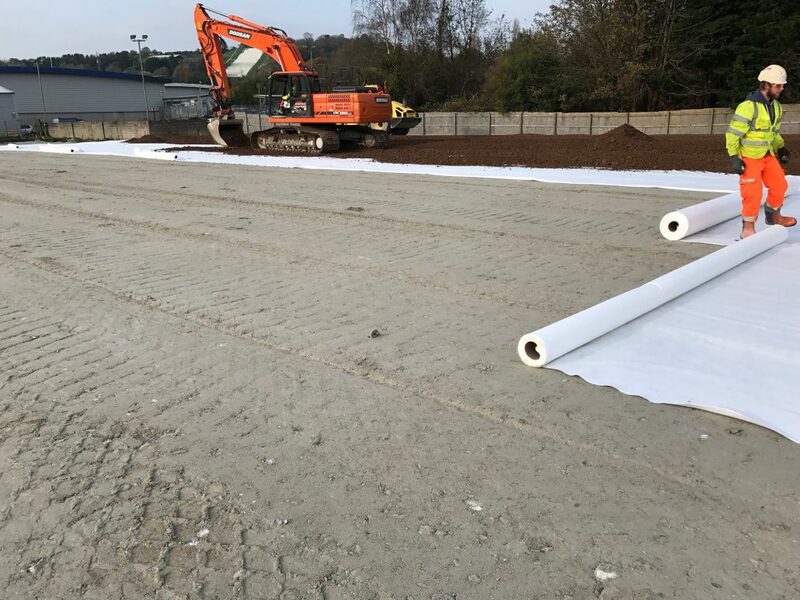 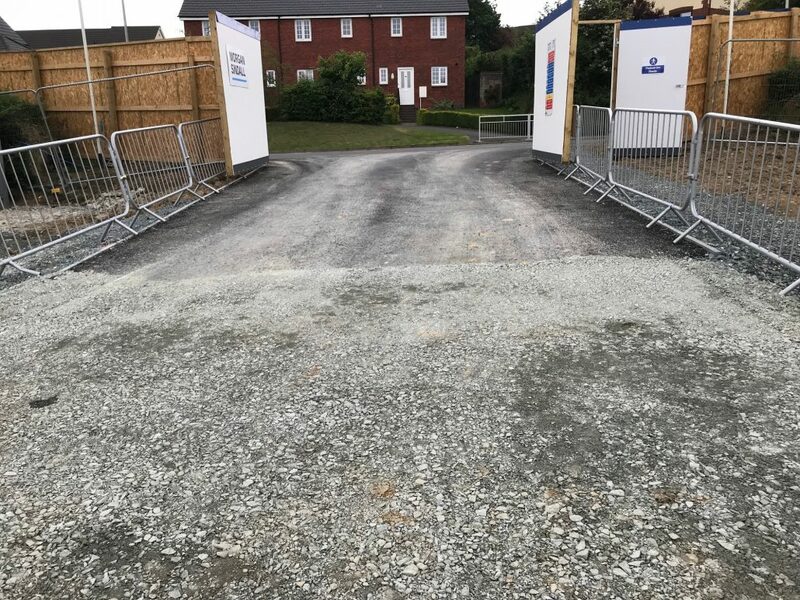 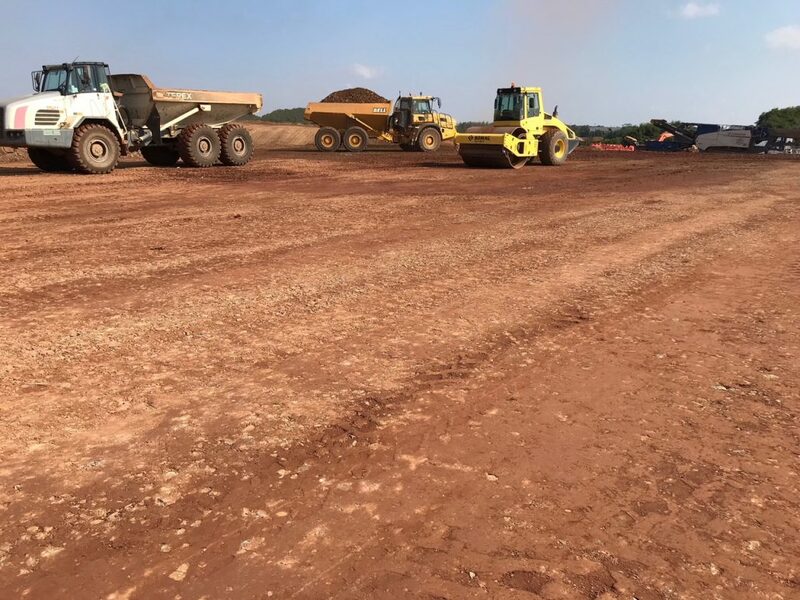 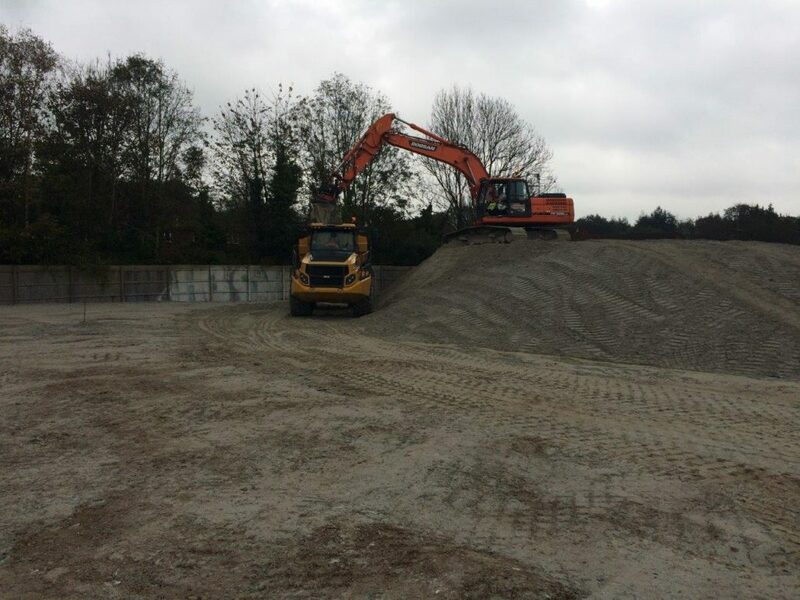 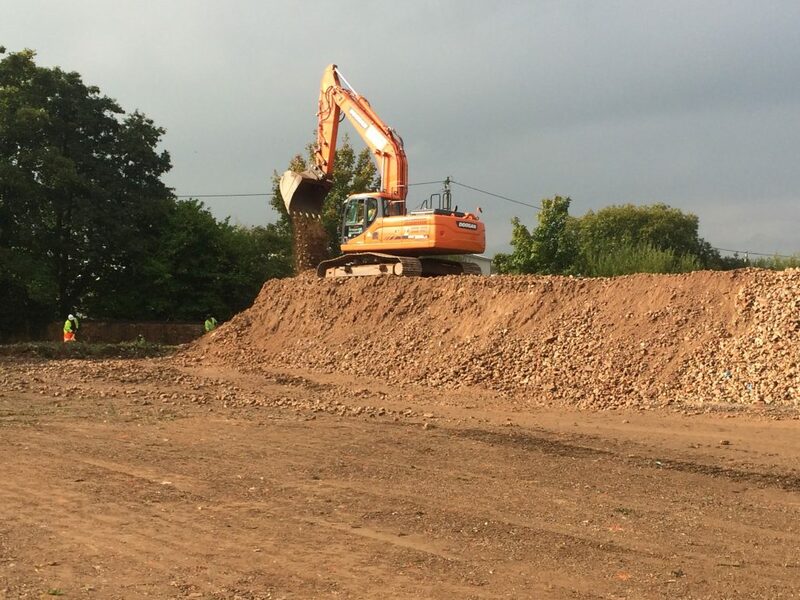 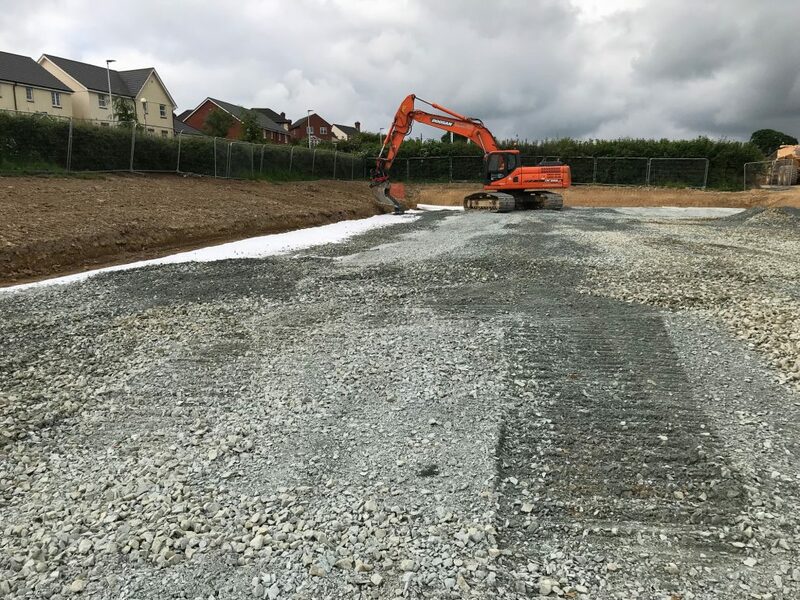 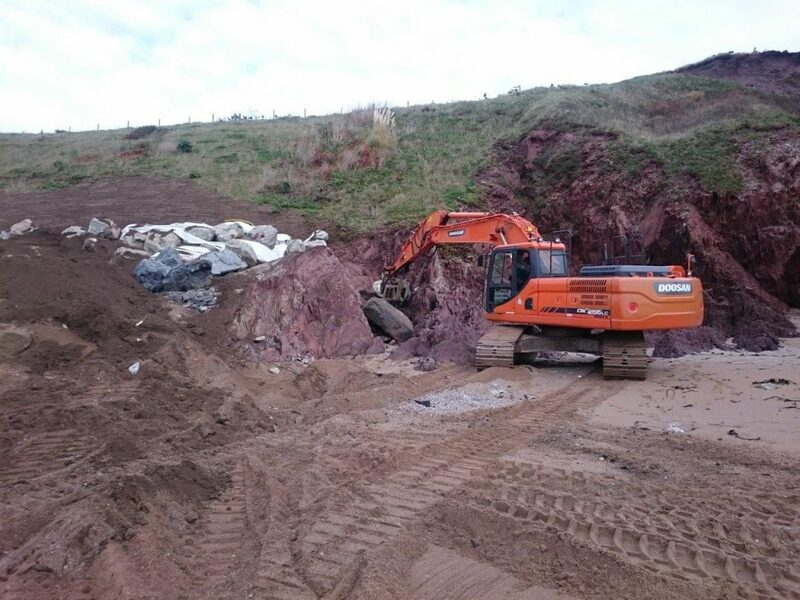 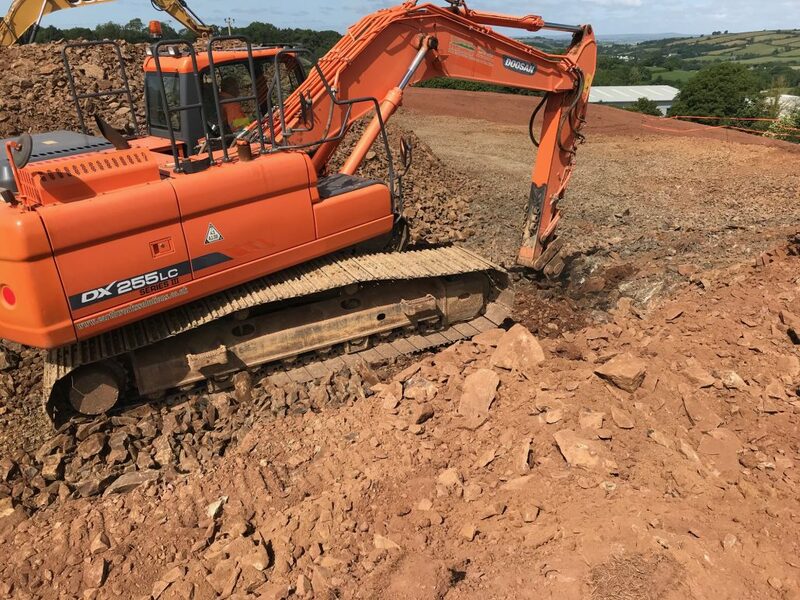 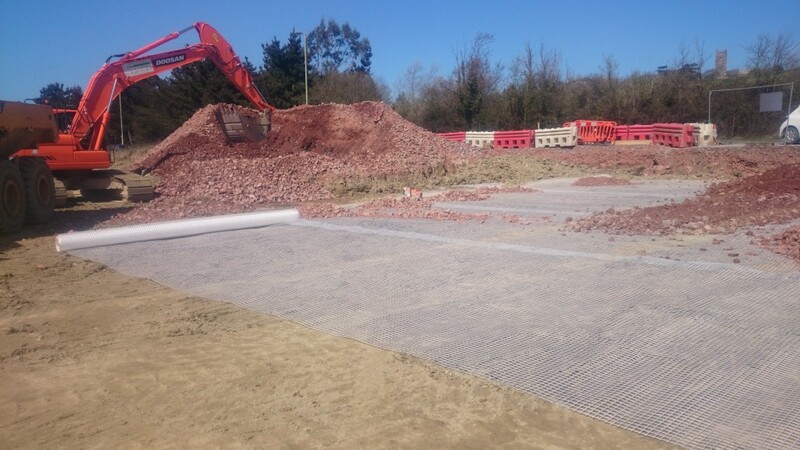 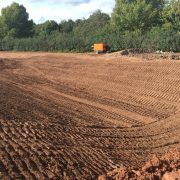 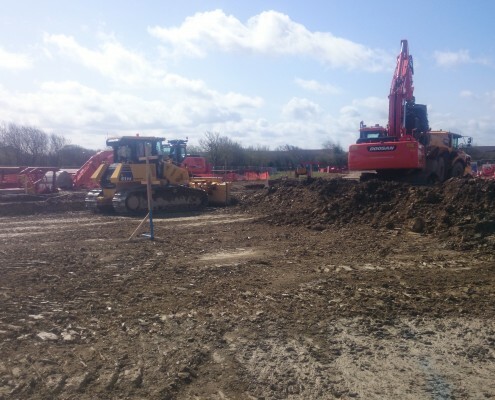 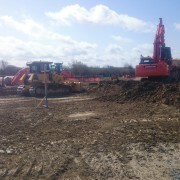 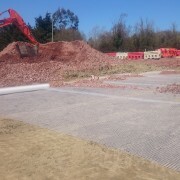 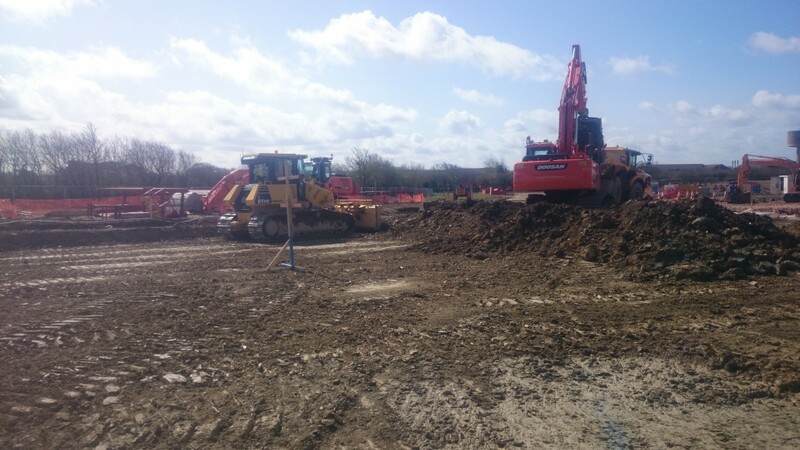 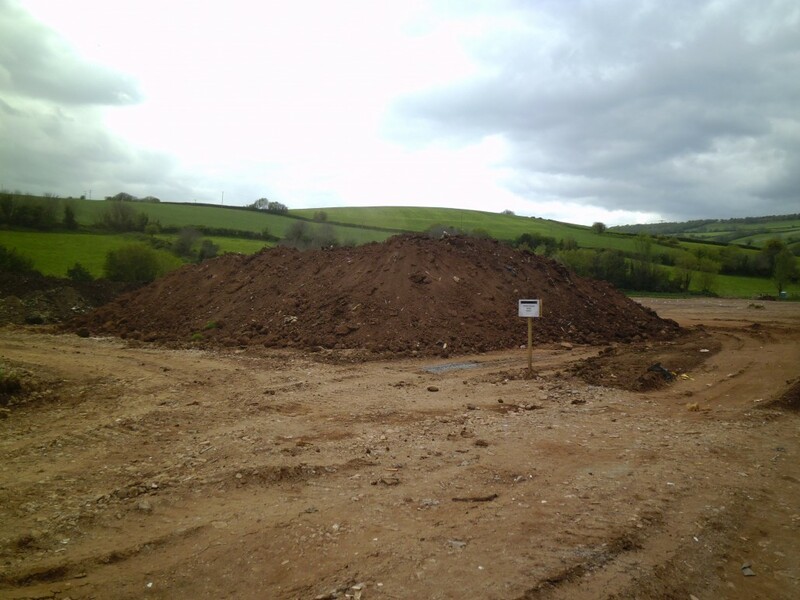 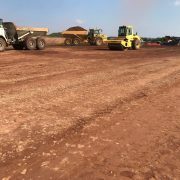 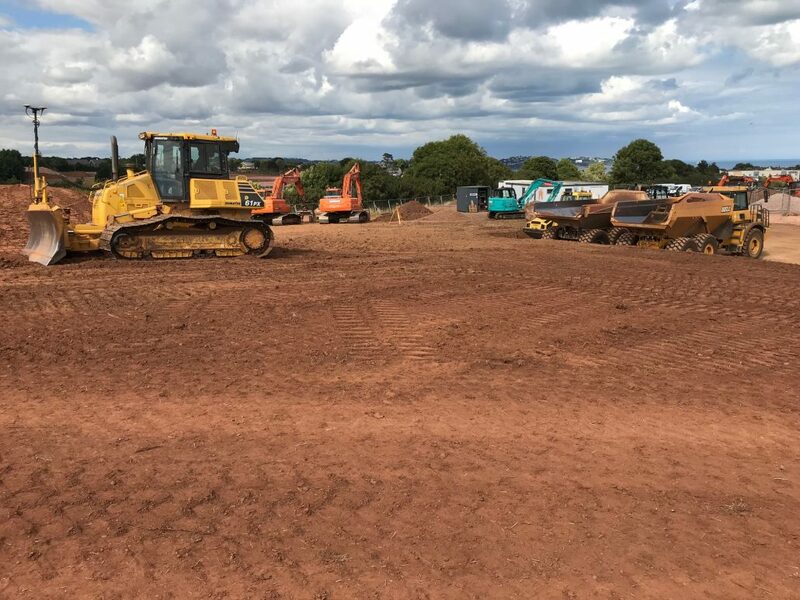 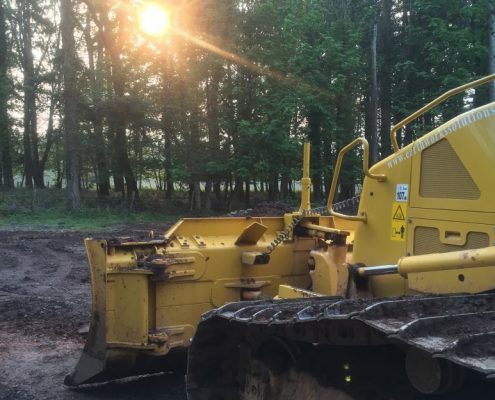 Existing site had multiple stockpiles of previously dumped material on site all of which required sorting and drying to achieve the optimum moisture content prior to replacement and compaction. 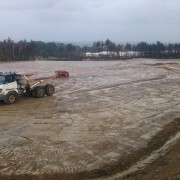 Strip remaining field of topsoil and stockpile on site. 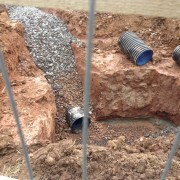 Placement of new Foul and Surface water drainage within new infrastructure. 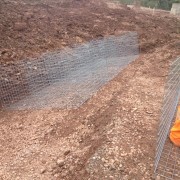 Diversion of electricity cable to site boundary. 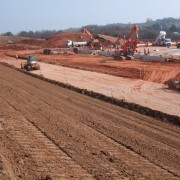 Construction of reinforced earth embankment. 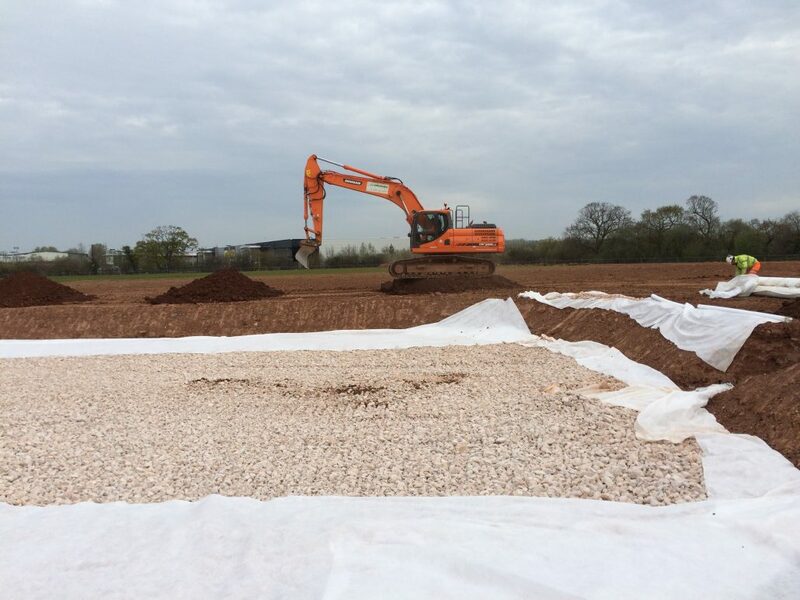 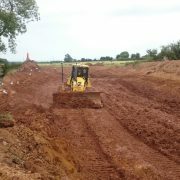 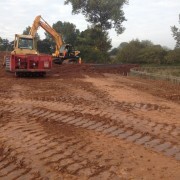 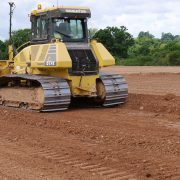 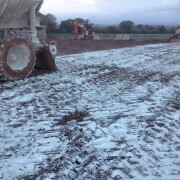 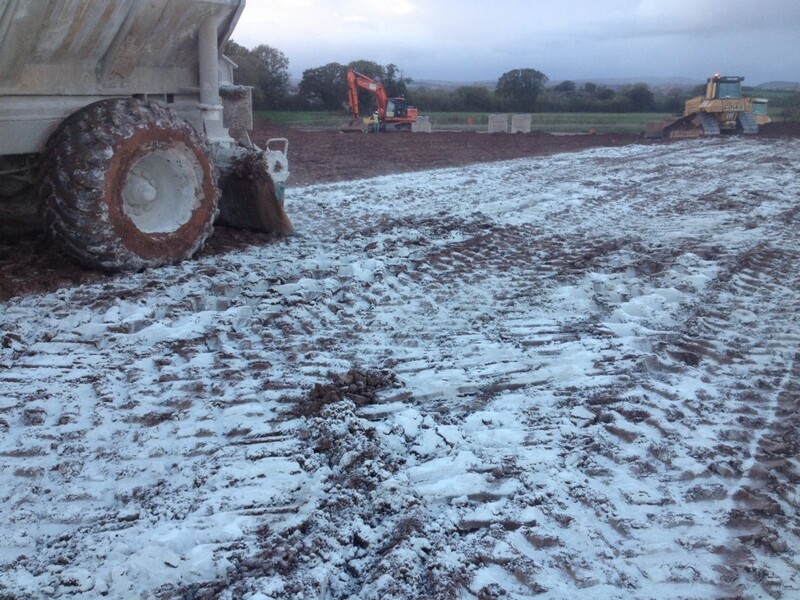 Lime stabilisation of high moisture content soils to achieve required specification for soils placement. 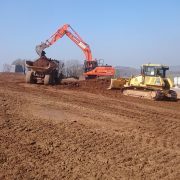 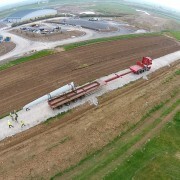 Topsoil strip and stockpile for new tracks and turbine bases. 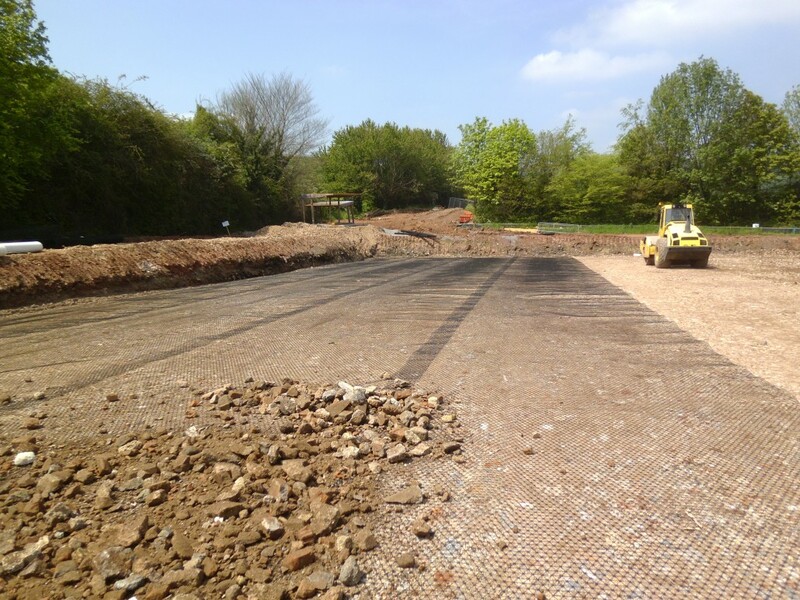 Placement of recycled 6F5 with geogrid/geotextile separation. 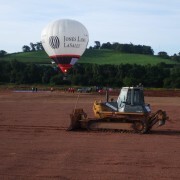 Top off with type 1 803. 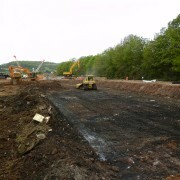 Formation of ‘V’ ditches adjacent to works. 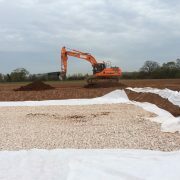 Topsoil reinstatement to compound on completion. 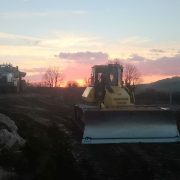 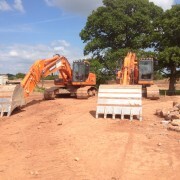 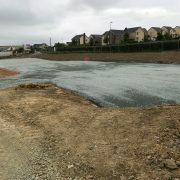 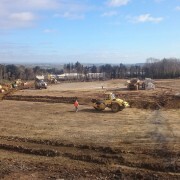 Site preparation for new housing development on a Greenfield site. 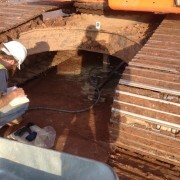 Cut and fill contract to formation level on main spine road. 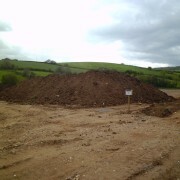 All surplus soils to on site stockpile. 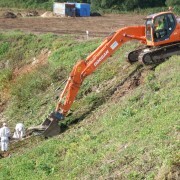 Excavate to formation level for culvert placement by others. 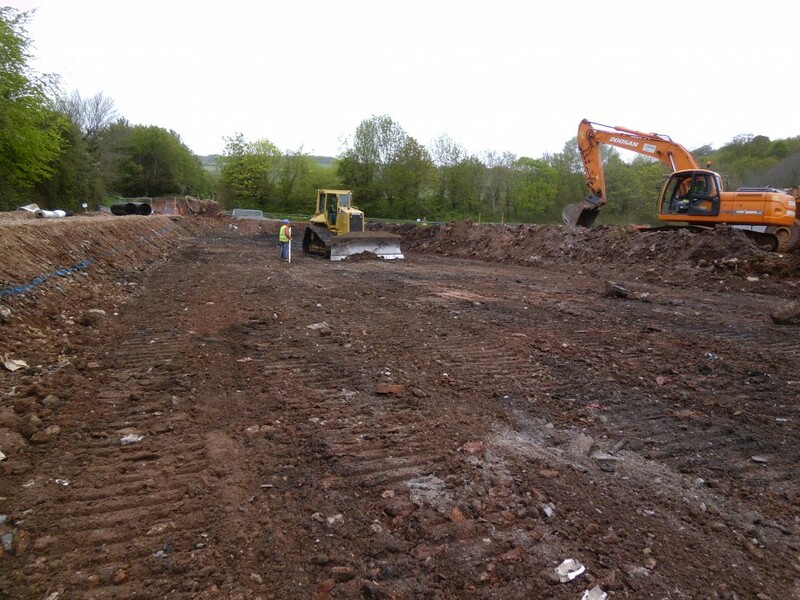 Site preparation for new retail development on a previously wooded site. 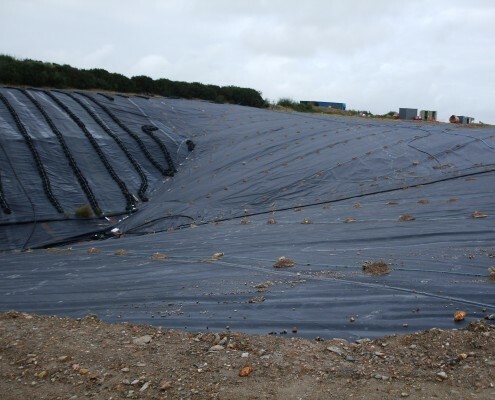 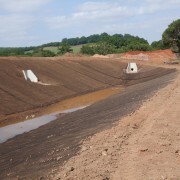 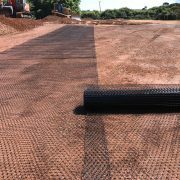 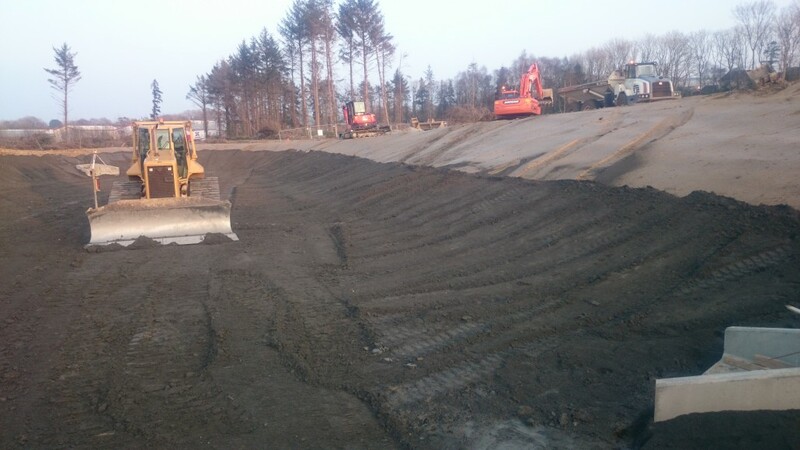 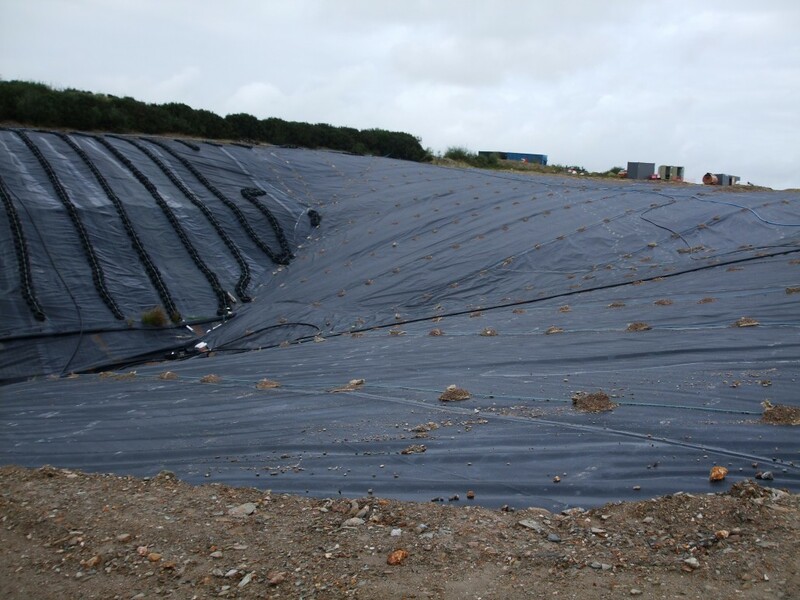 Formation of attenuation pond comprising layers of sand, EDPM geomembrane liner, protective matting and topsoil. 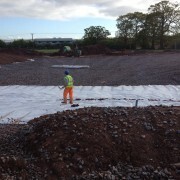 Placement of stone filled drainage blanket beneath fill area to pick up springs. 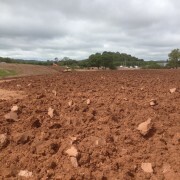 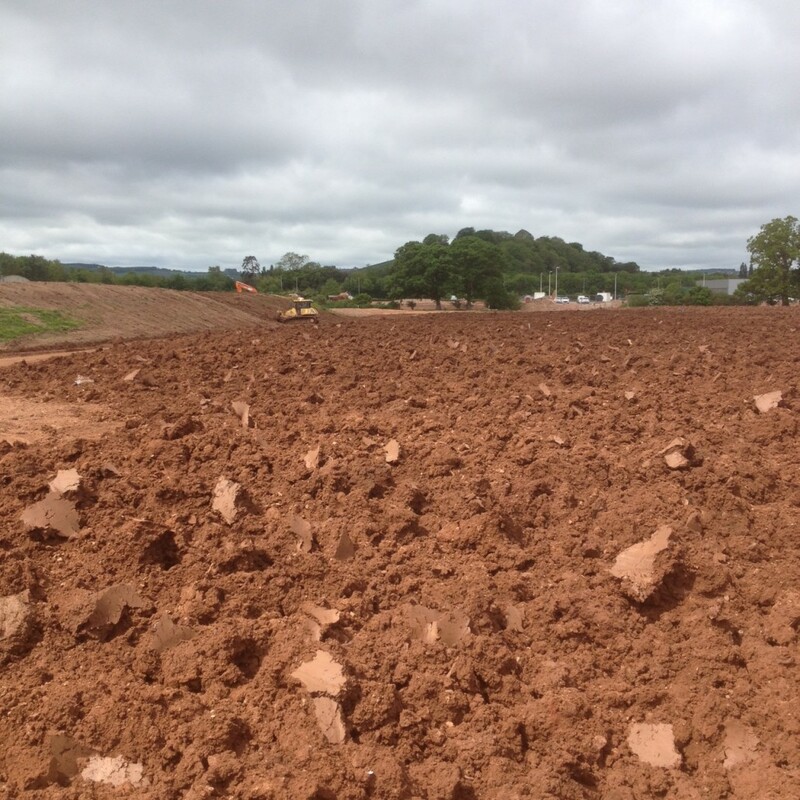 Cut and fill contract of clay soils with high moisture content. 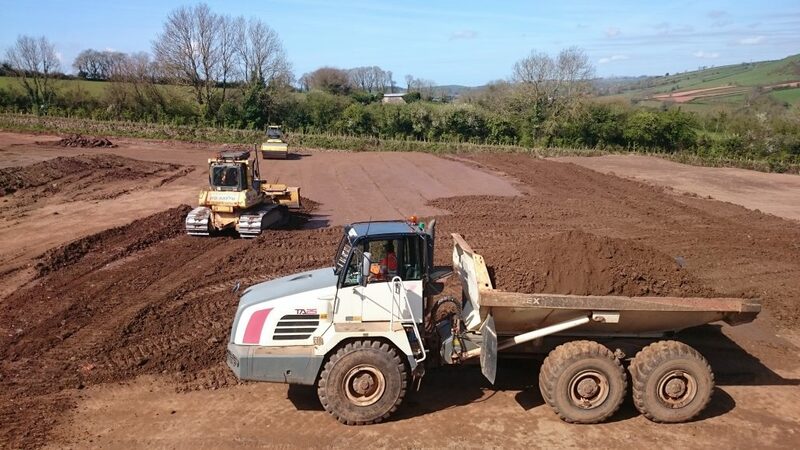 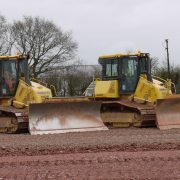 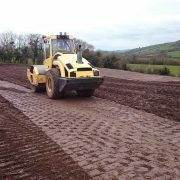 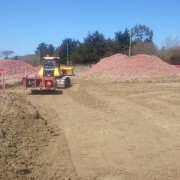 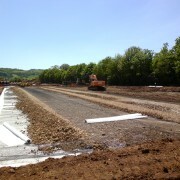 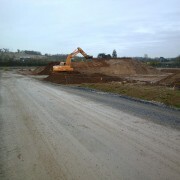 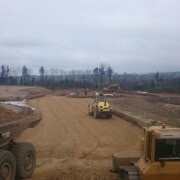 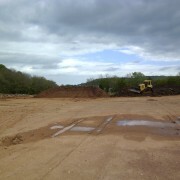 Site preparation for new Travel Rest Service Area on the A3, Nr Bodmin. 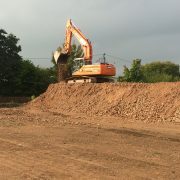 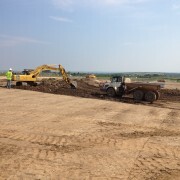 Strip existing field of topsoil and stockpile on site. 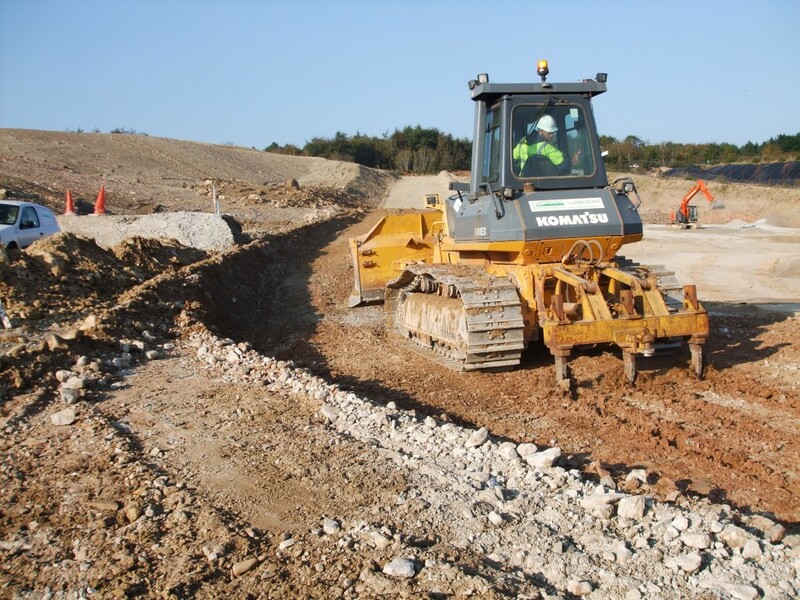 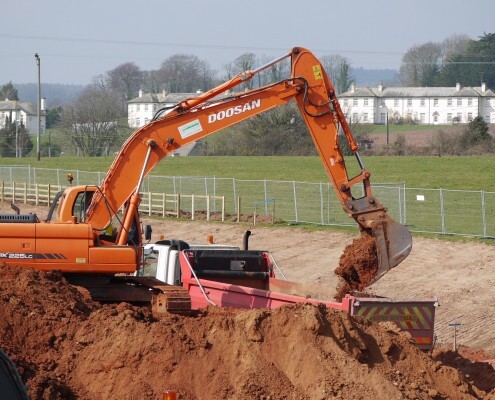 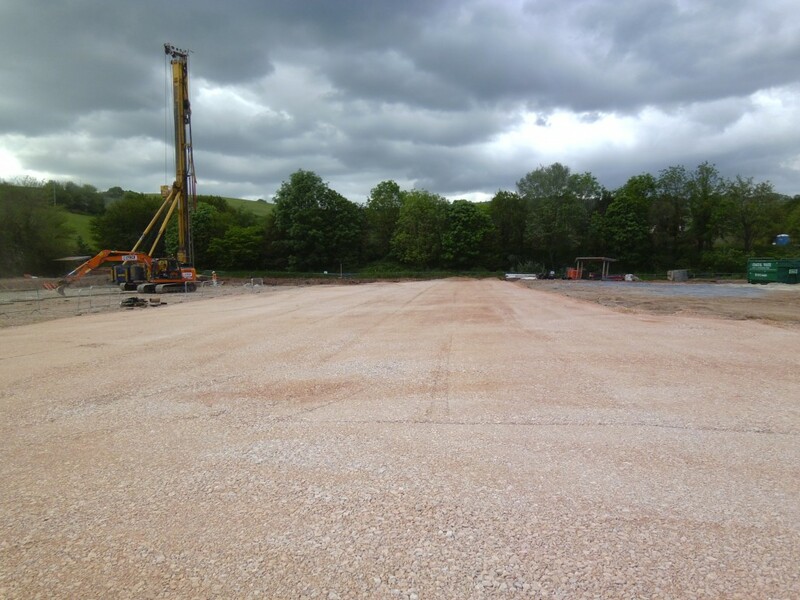 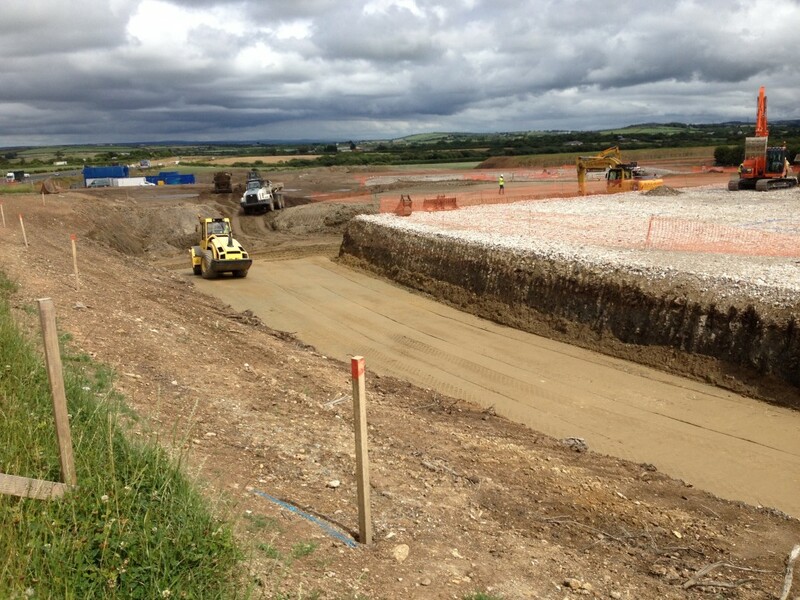 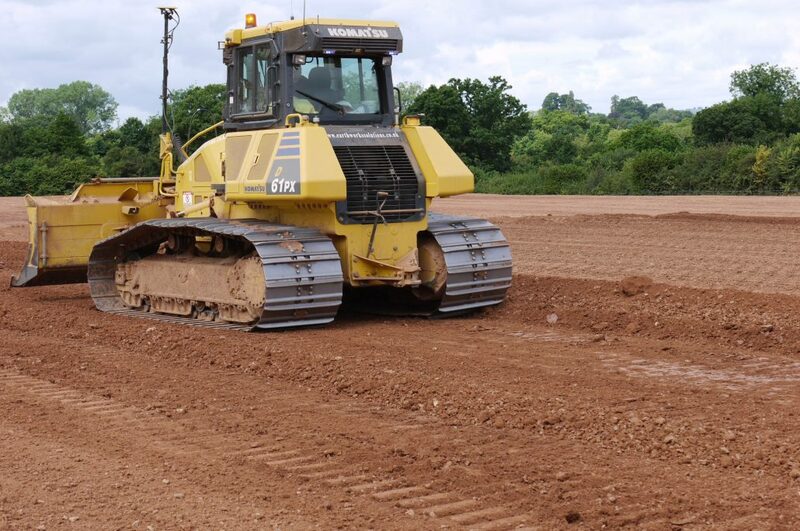 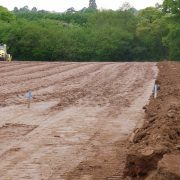 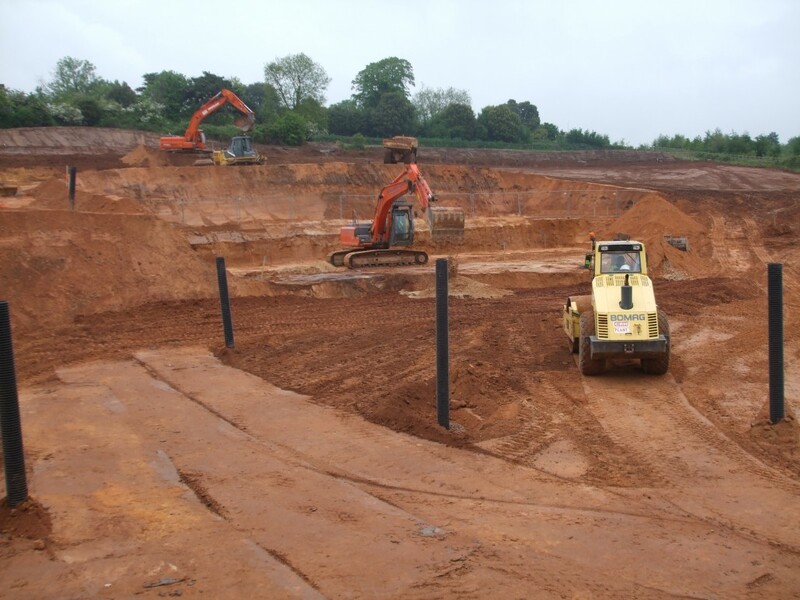 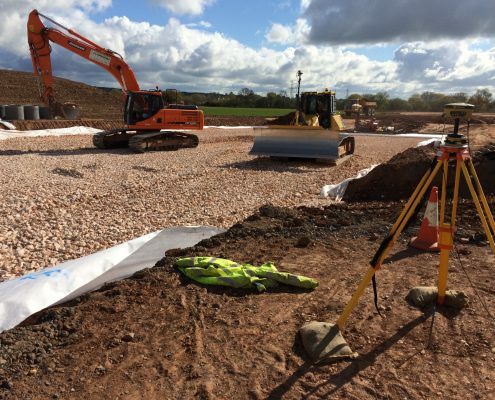 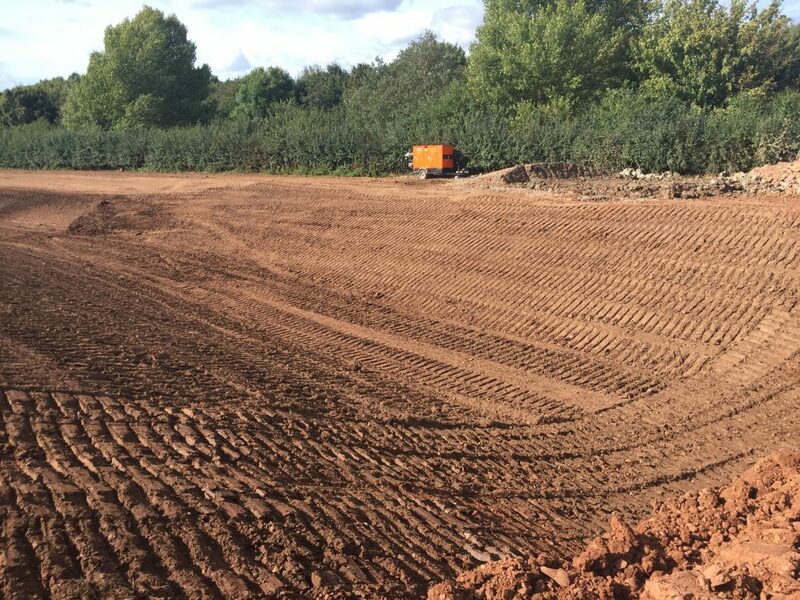 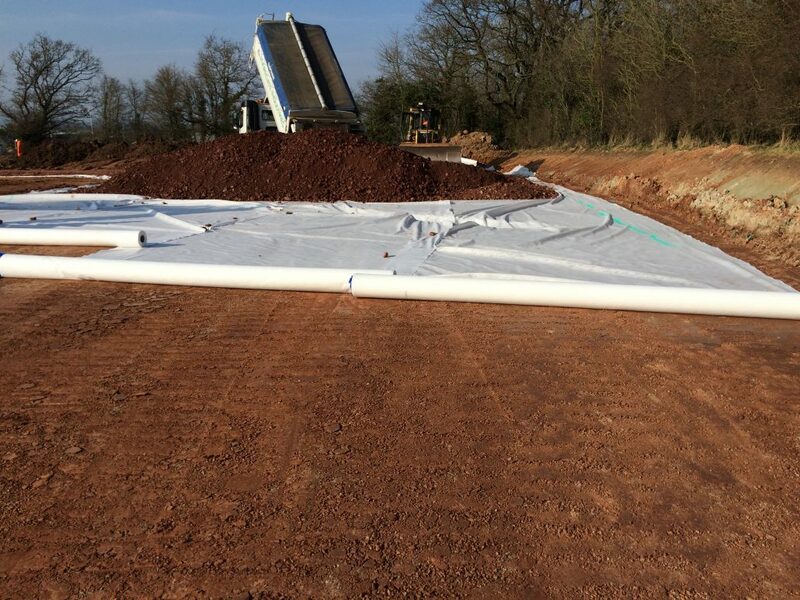 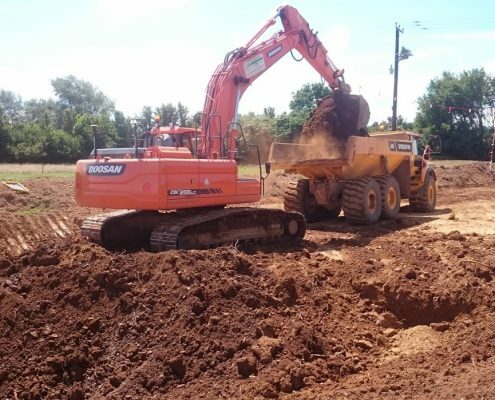 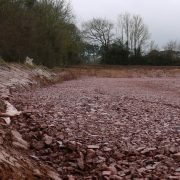 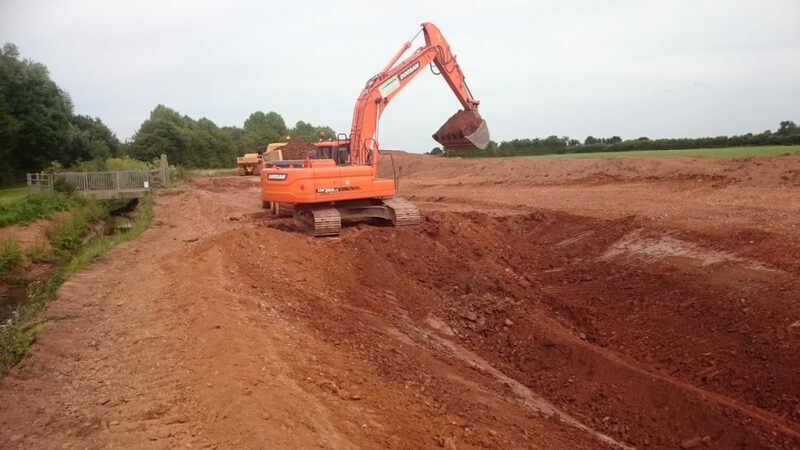 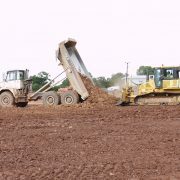 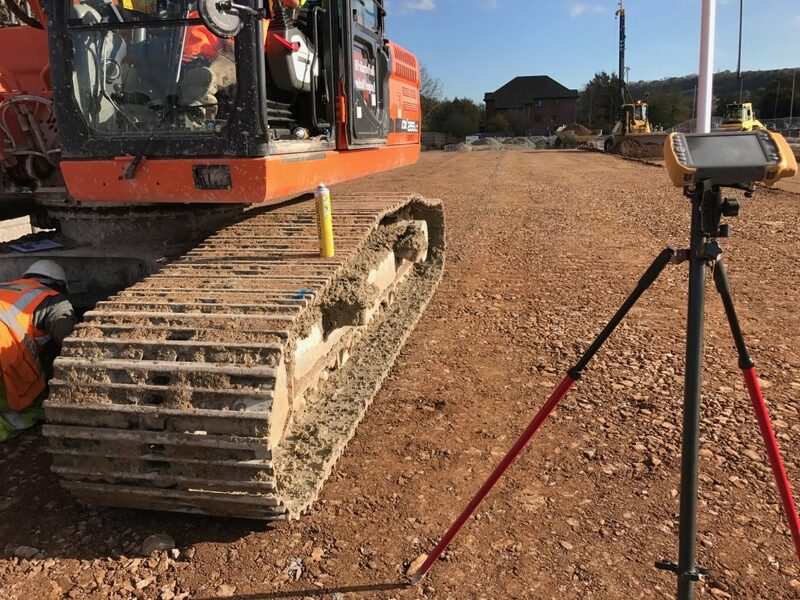 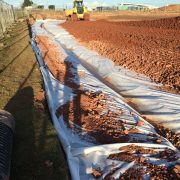 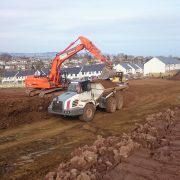 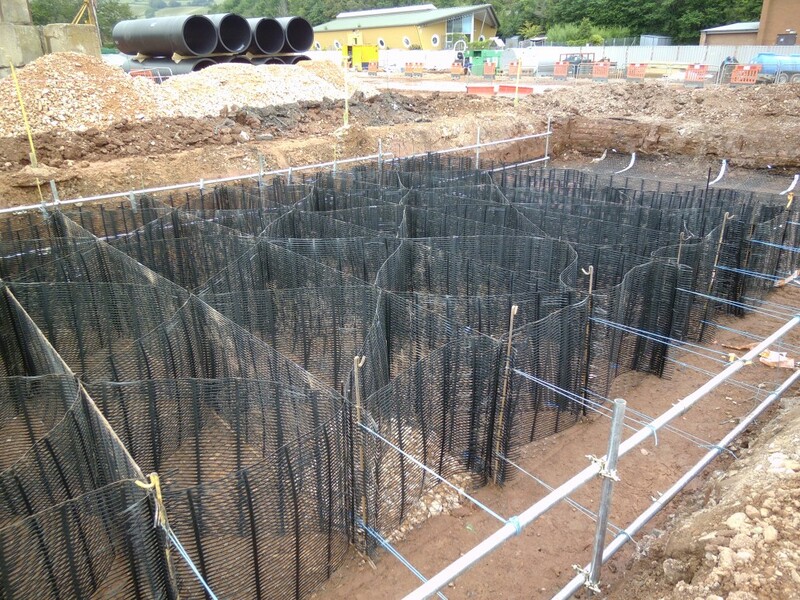 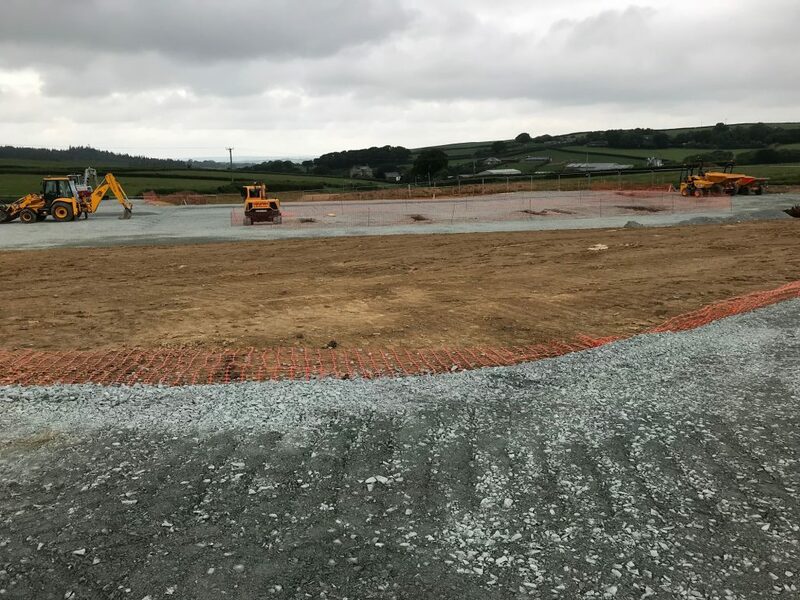 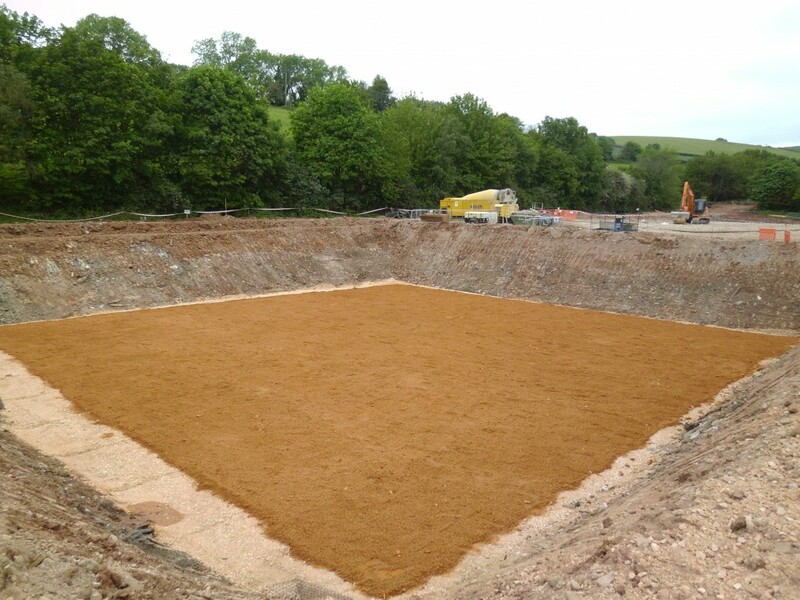 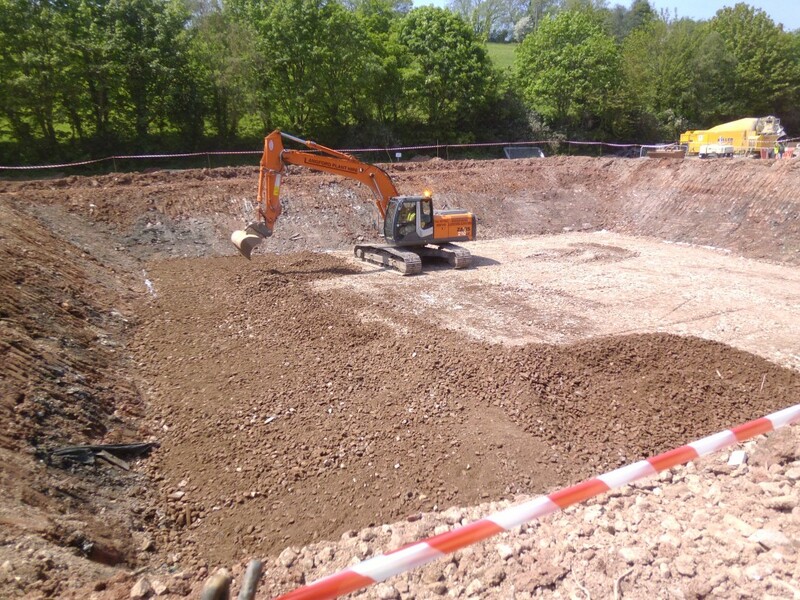 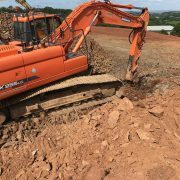 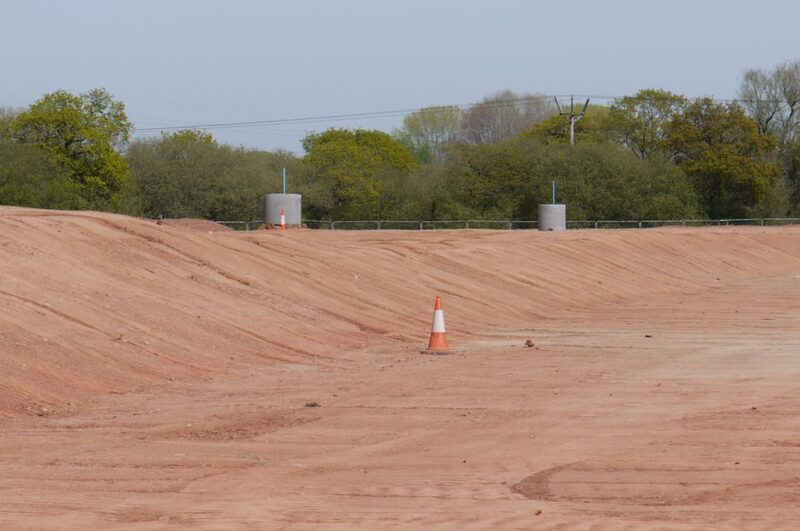 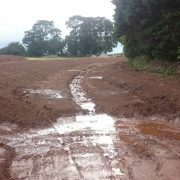 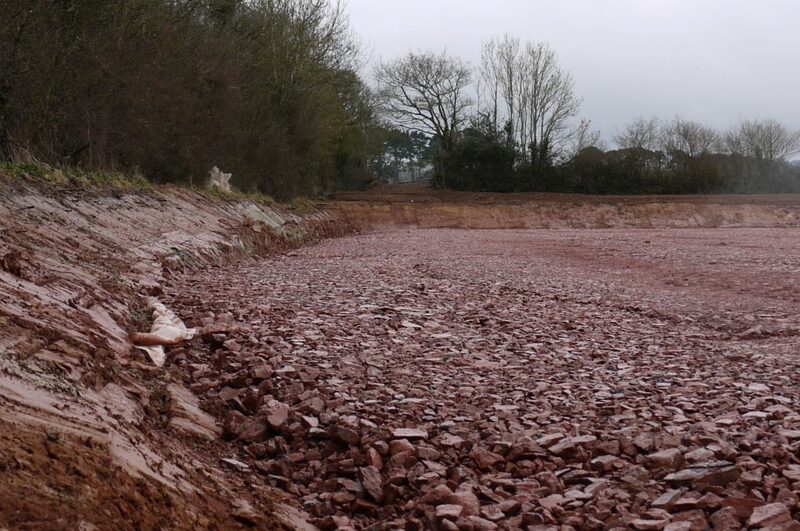 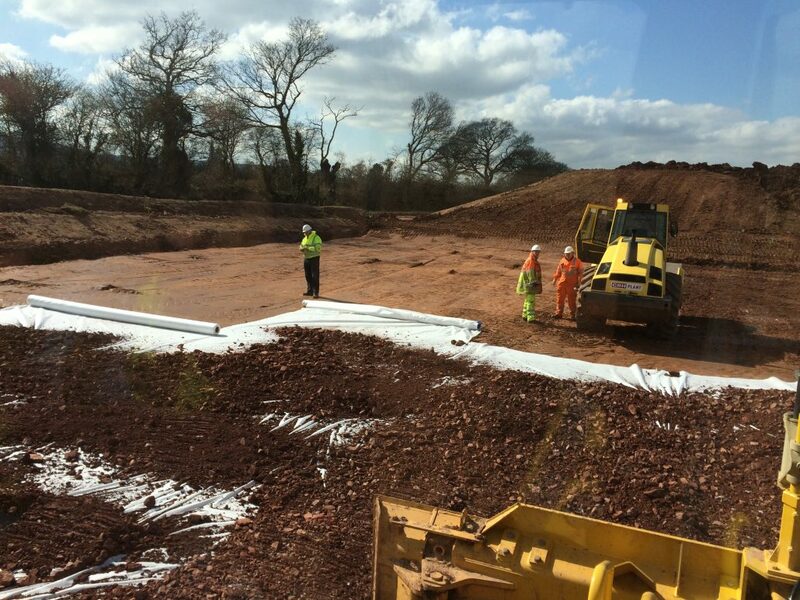 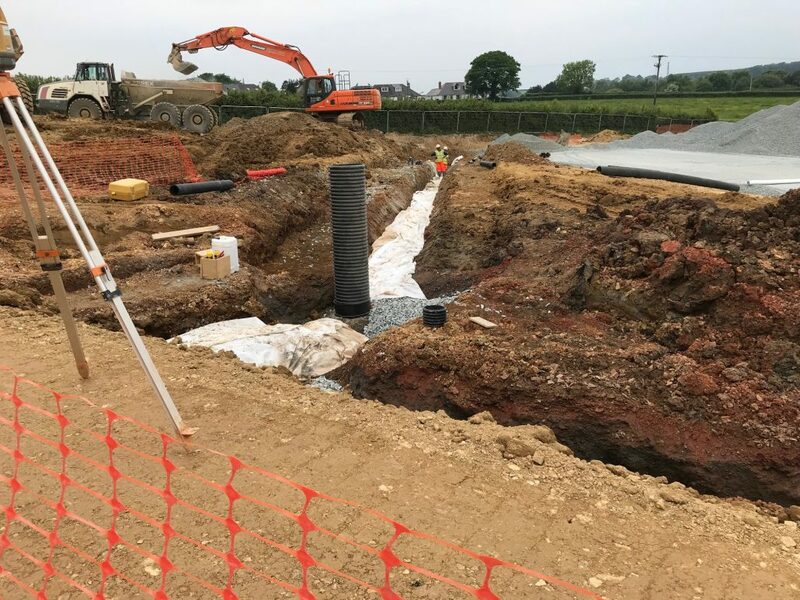 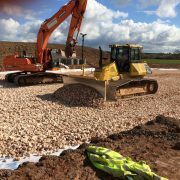 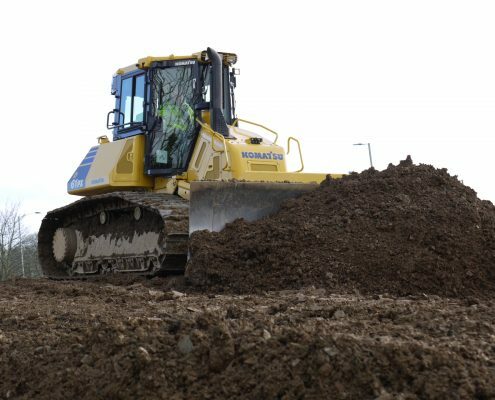 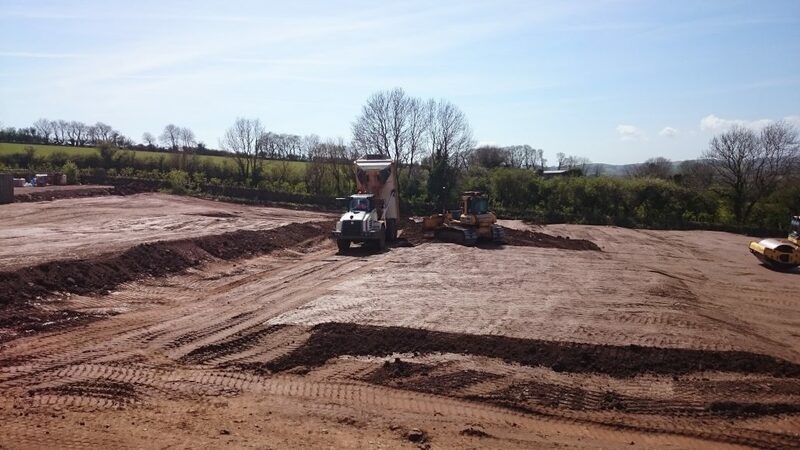 Reduce level excavation in unacceptable soils to establish existing underlying ground for suitable approved surface for filling and stockpile off site. 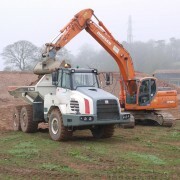 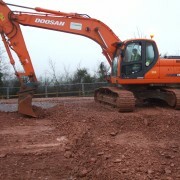 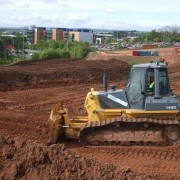 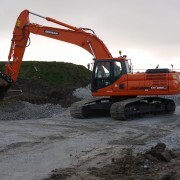 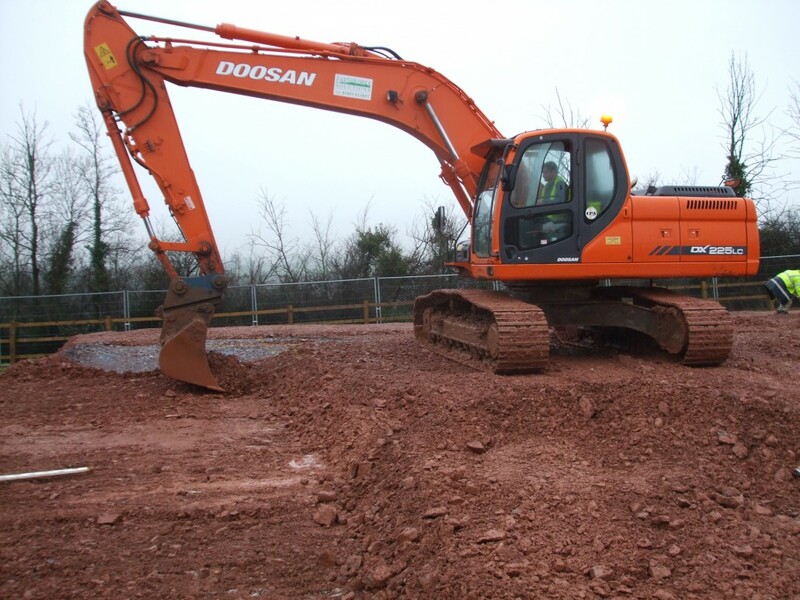 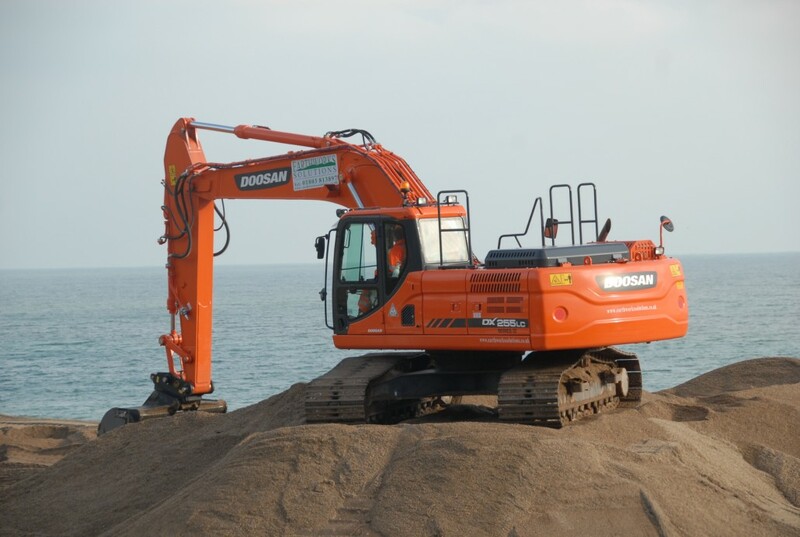 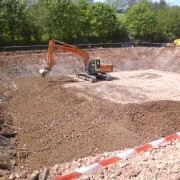 Excavate to reduce level suitable excavated material for filling on site. 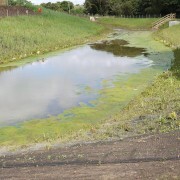 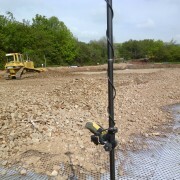 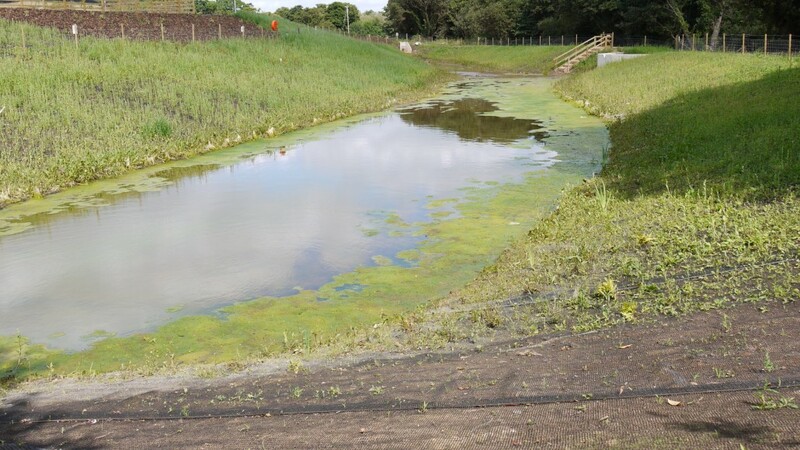 Shortfall of suitable site won fill material was excavated on site utilising borrow pits throughout the site. 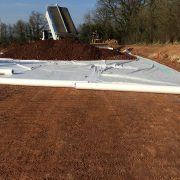 Supply, spread and compact capping layer of recycled 6F5 over development footprint. 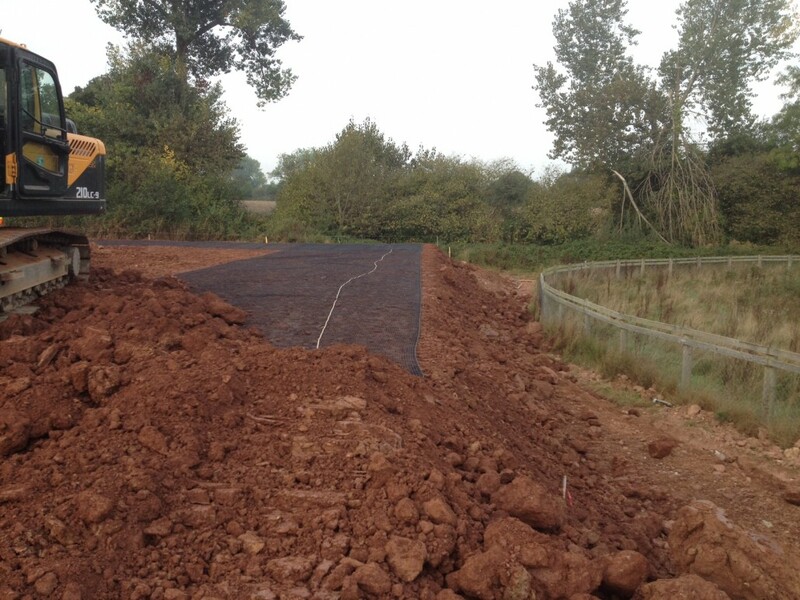 Formation of landscape bunds with unsuitable excavated material. 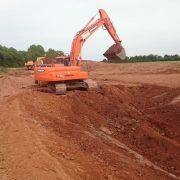 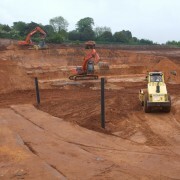 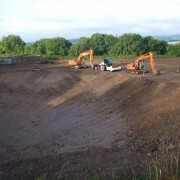 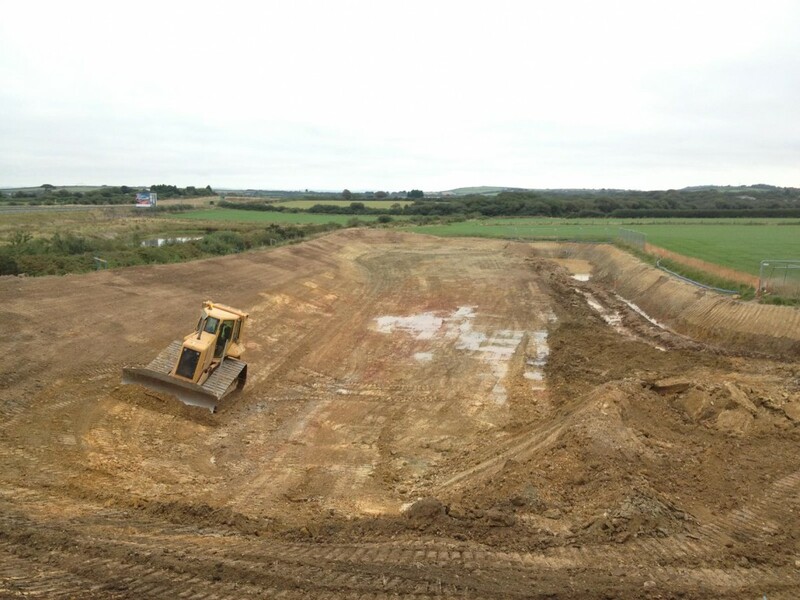 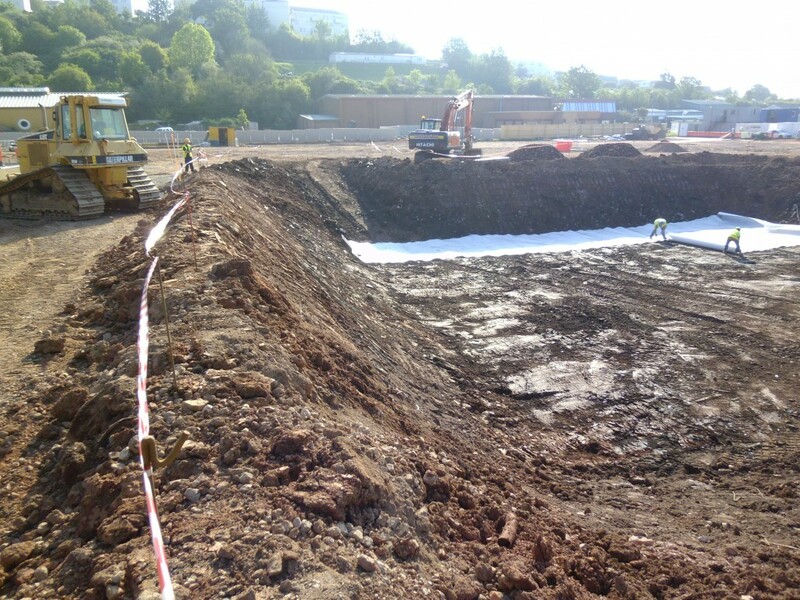 Excavation of a series of attenuation ponds including GCL pond liner. 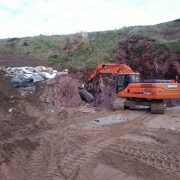 Removal from stockpile of circa 4000m3 of builders waste and excavated arisings from the initial phase of a housing contract. 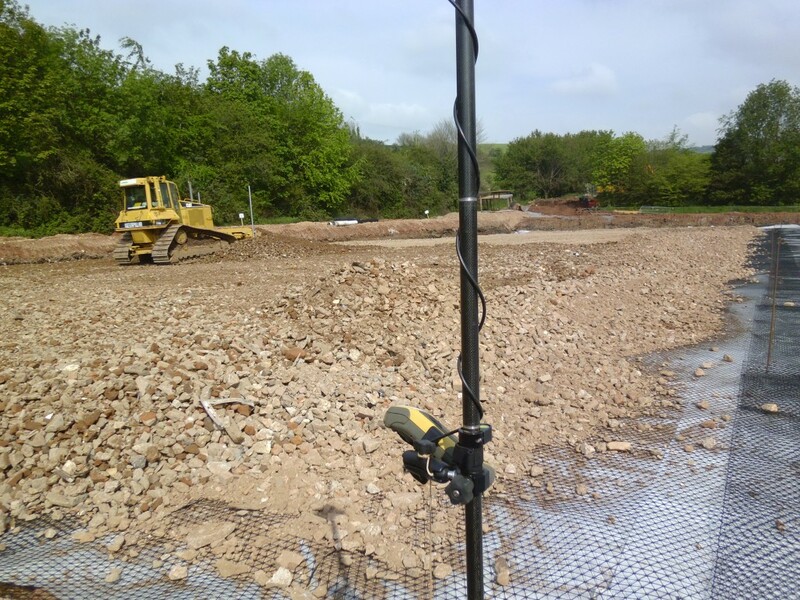 All the materials were mechanically screened prior to disposal to Materials Recovery Facility for reuse on a development site. 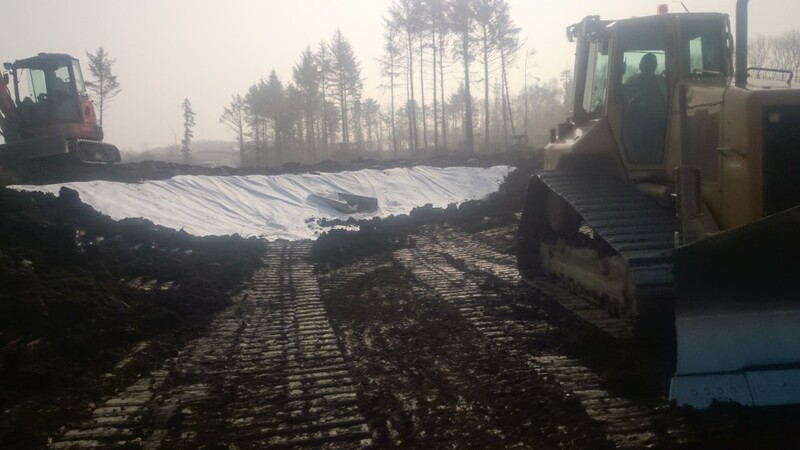 All over-size material was segregated and disposed of to various licensed facilities. 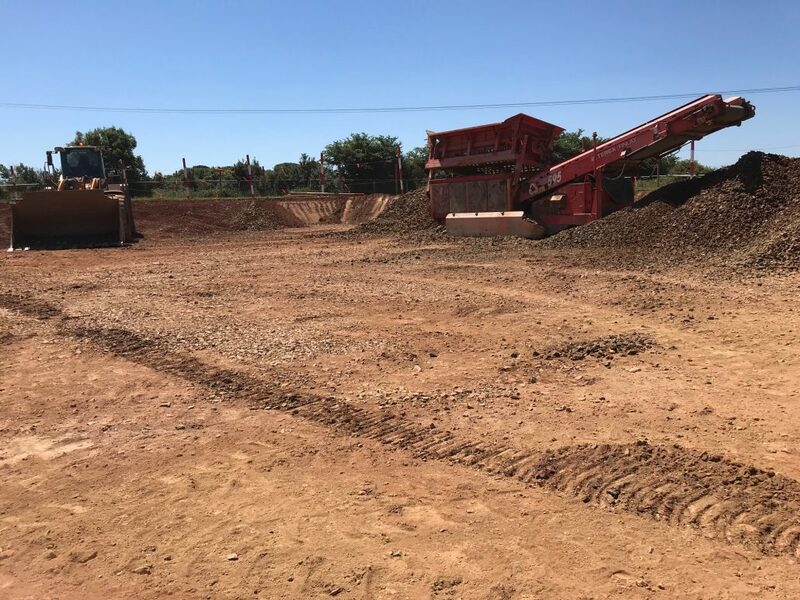 Approximately 400m3 of oversized concrete was broken up by mechanical hammer and disposed of locally for crushing to a recycled 6F specification aggregate. 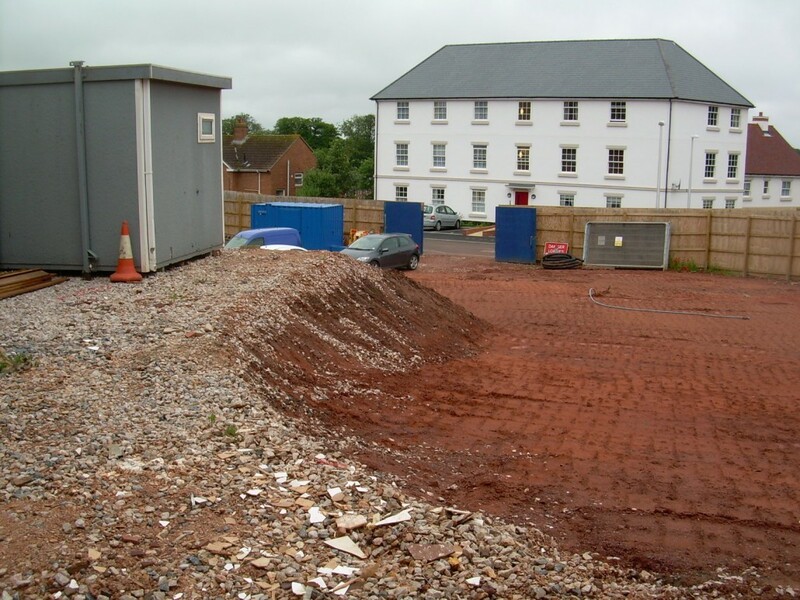 Builders waste and discarded pre-fabricated timber frame units were segregated and disposed off site. 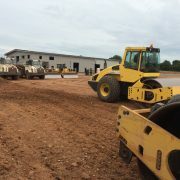 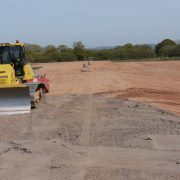 The final site was then evenly graded in preparation for a building contractor to commence the next phase of construction. 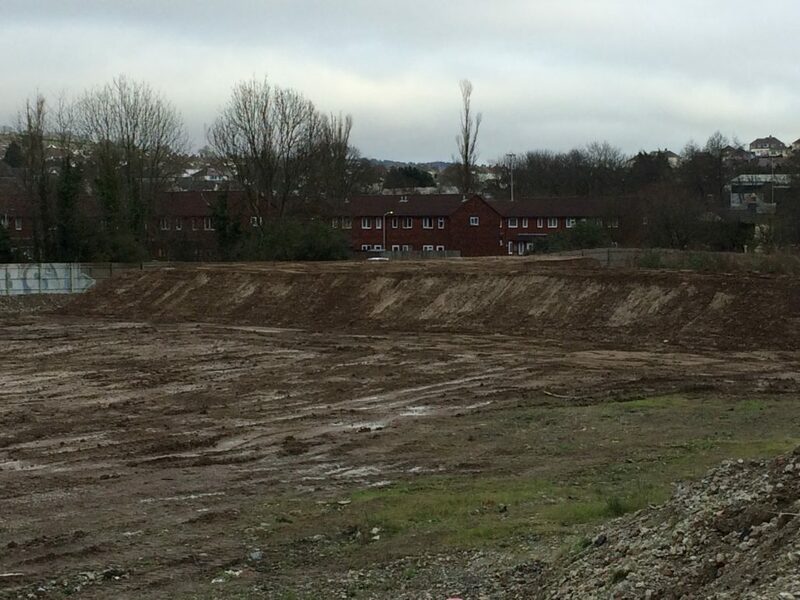 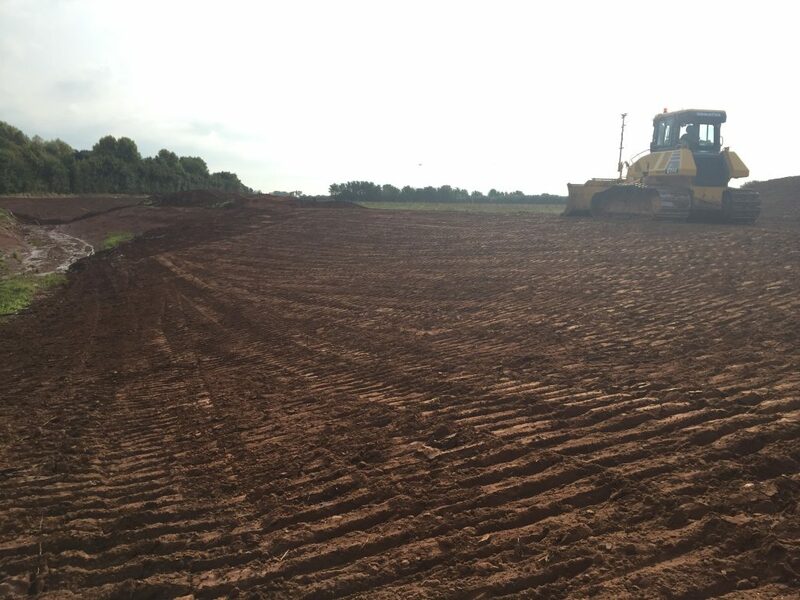 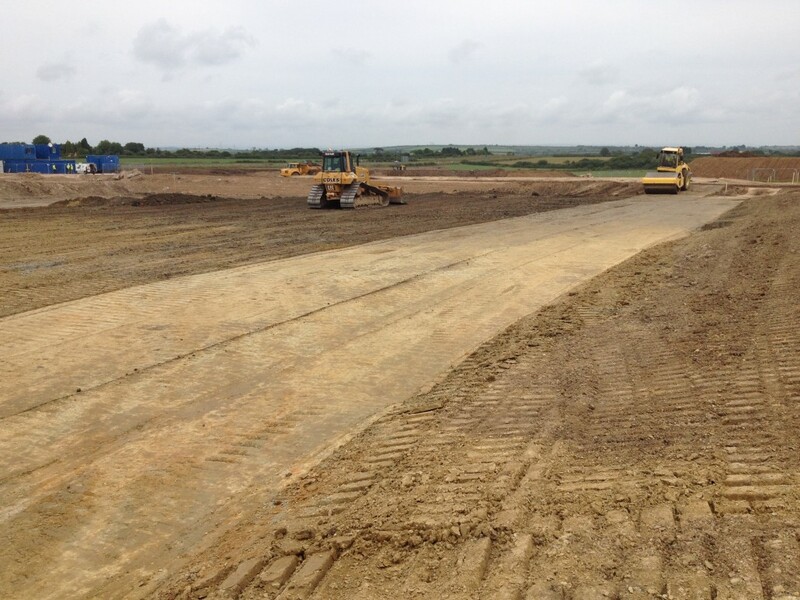 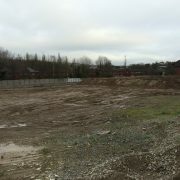 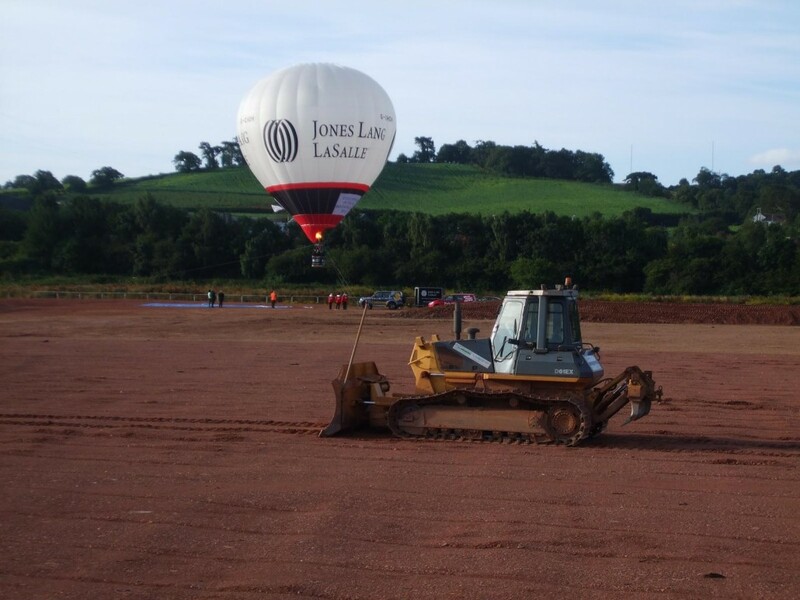 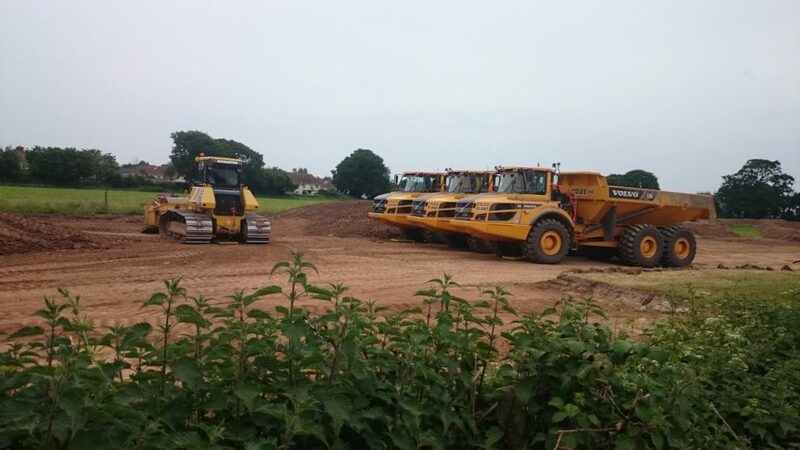 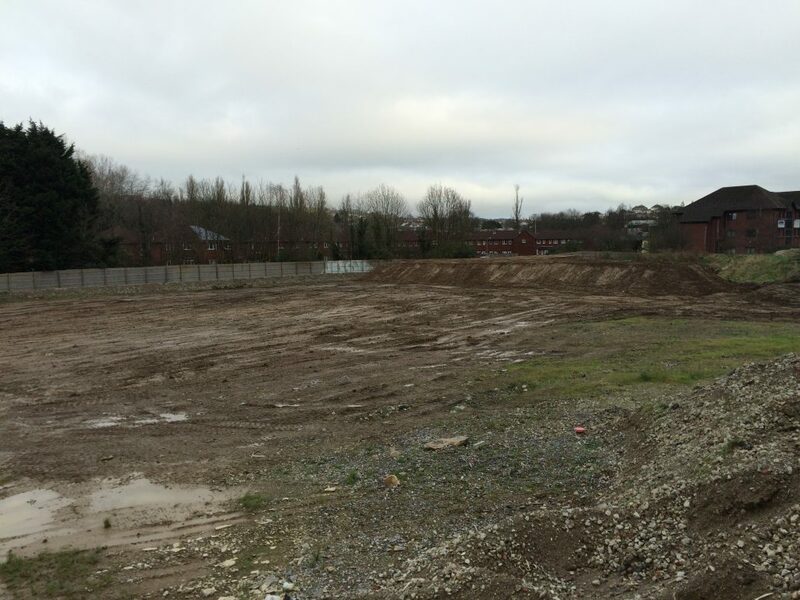 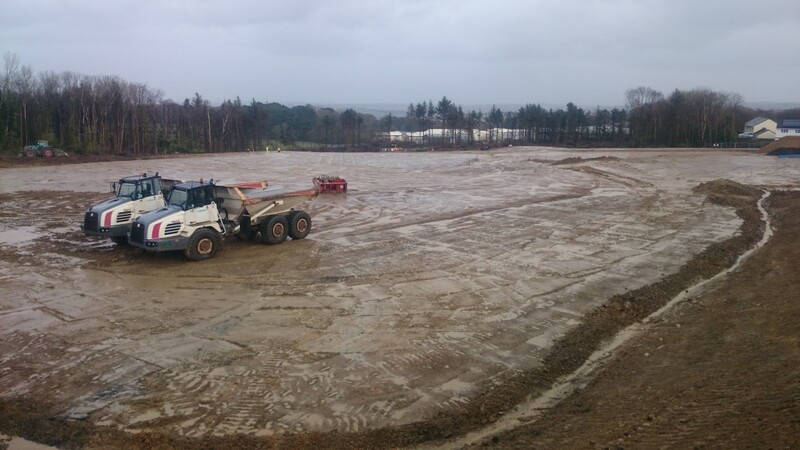 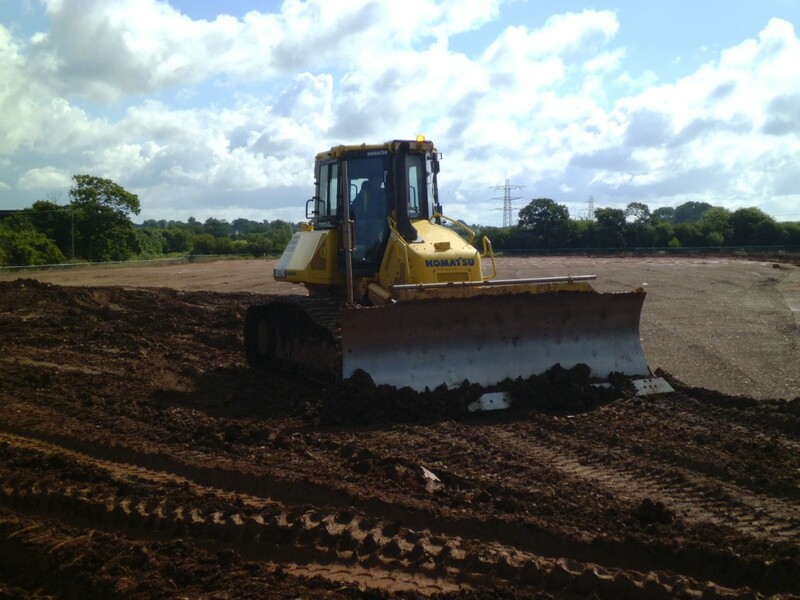 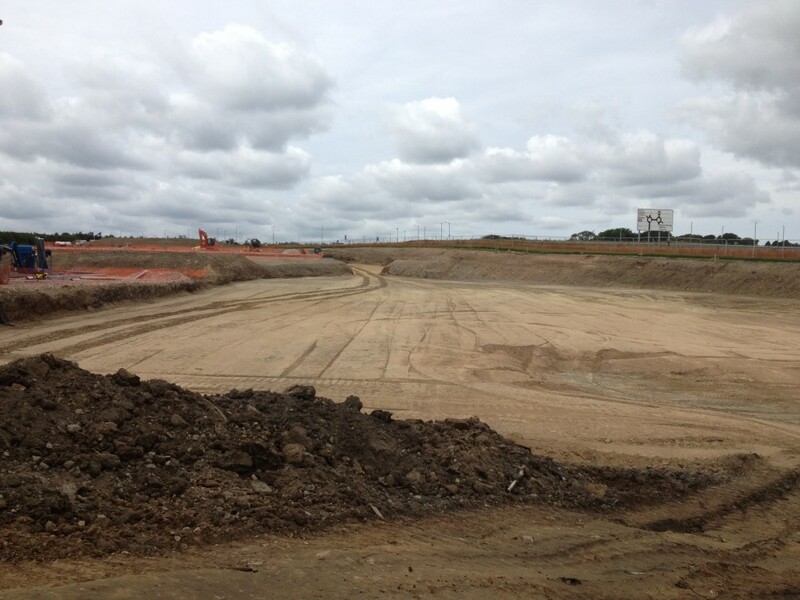 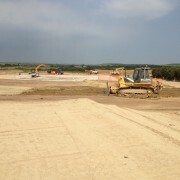 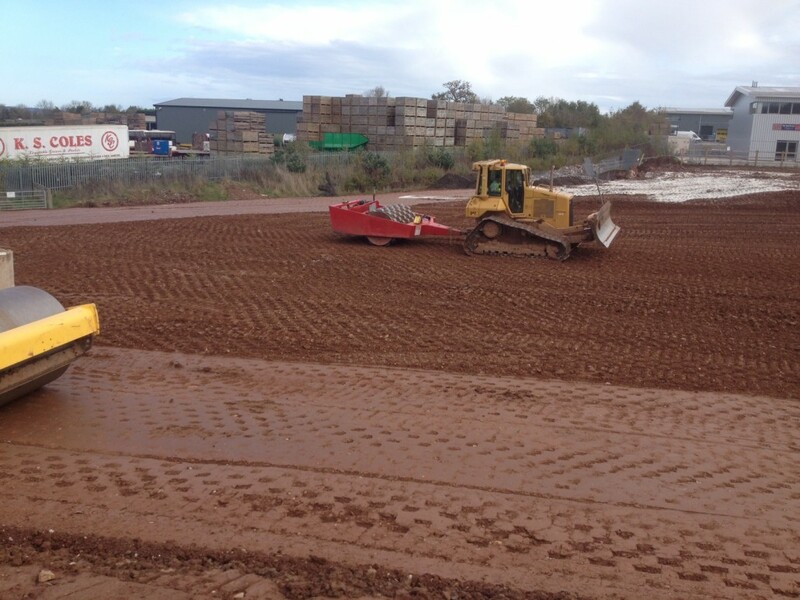 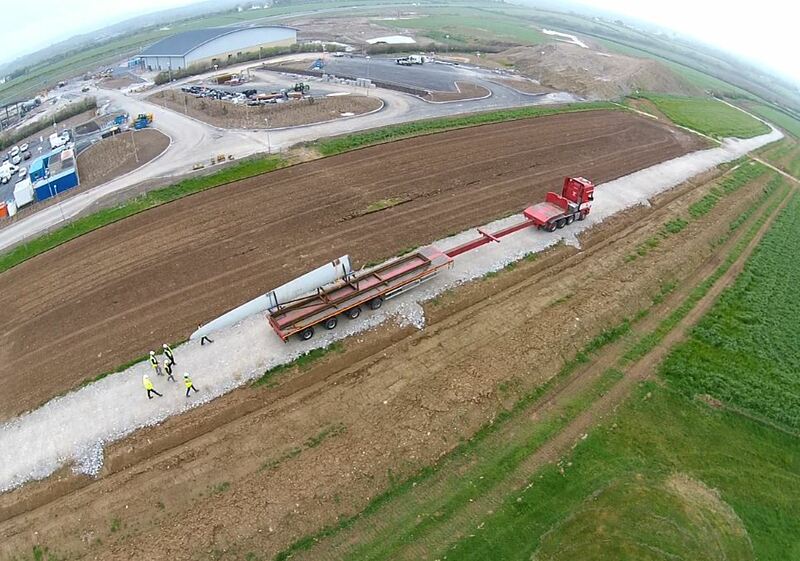 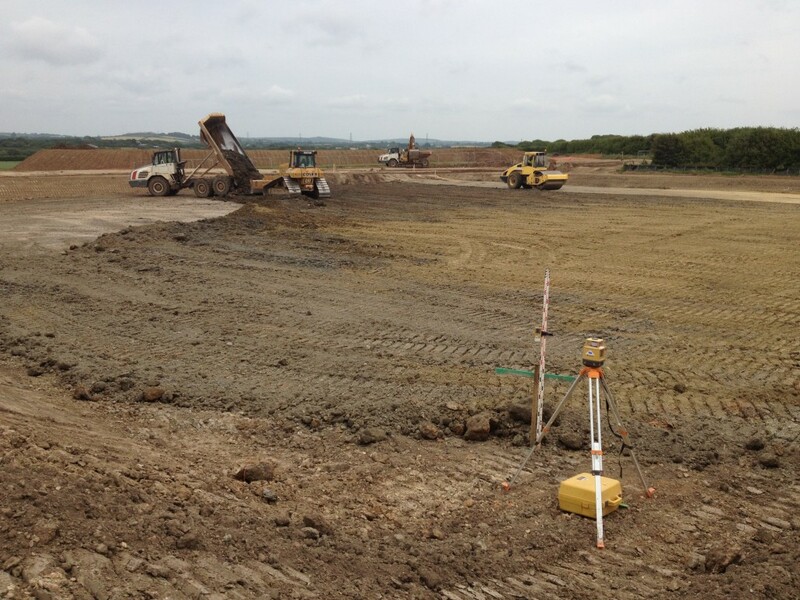 Site preparation for new supermarket development on a redundant landfill site previously used for sports pitches. 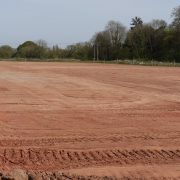 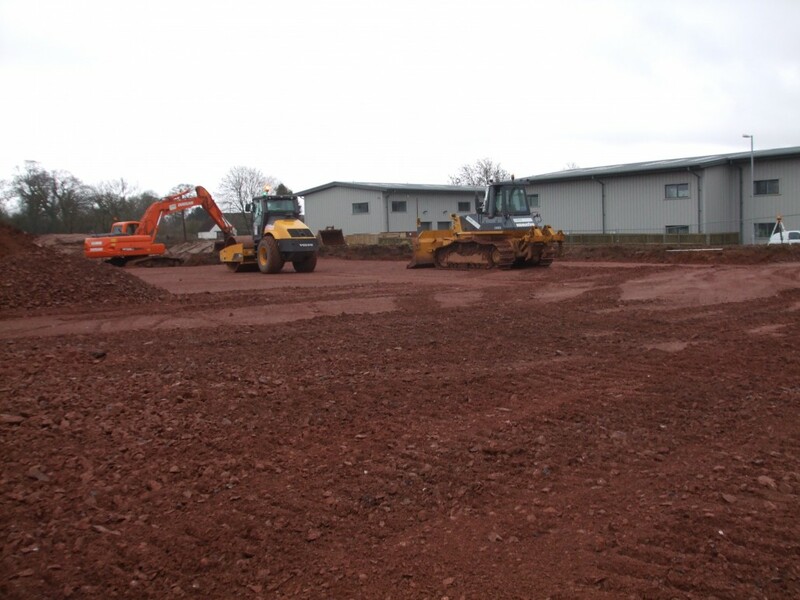 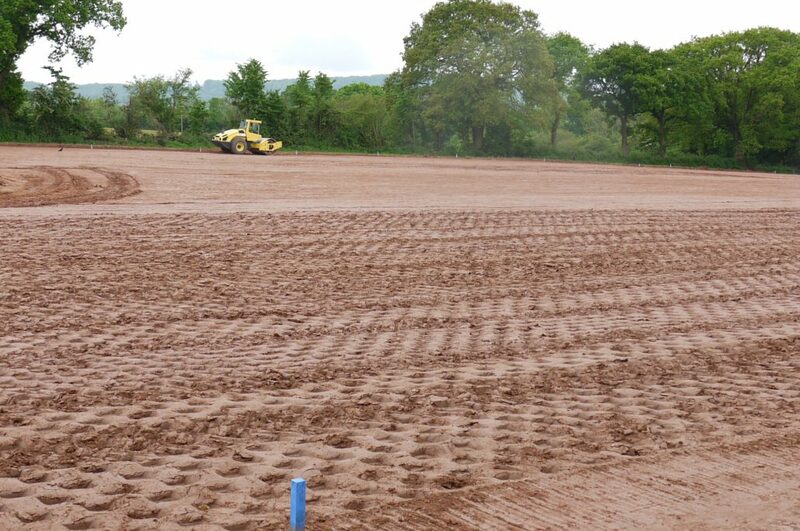 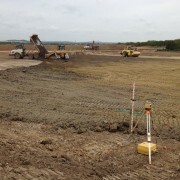 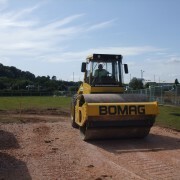 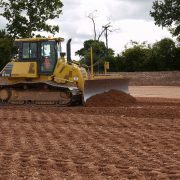 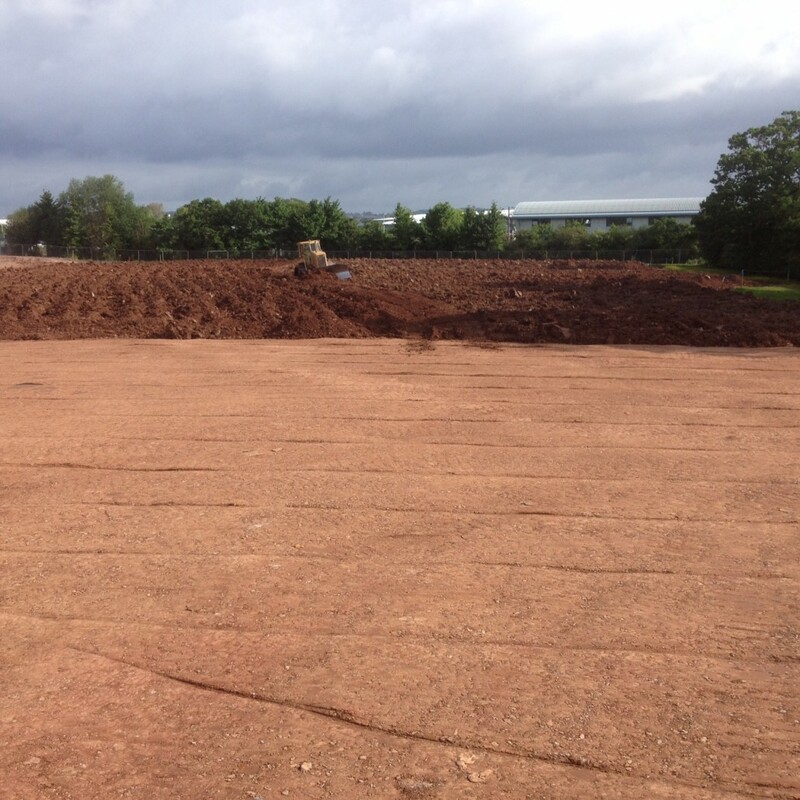 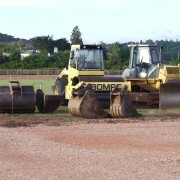 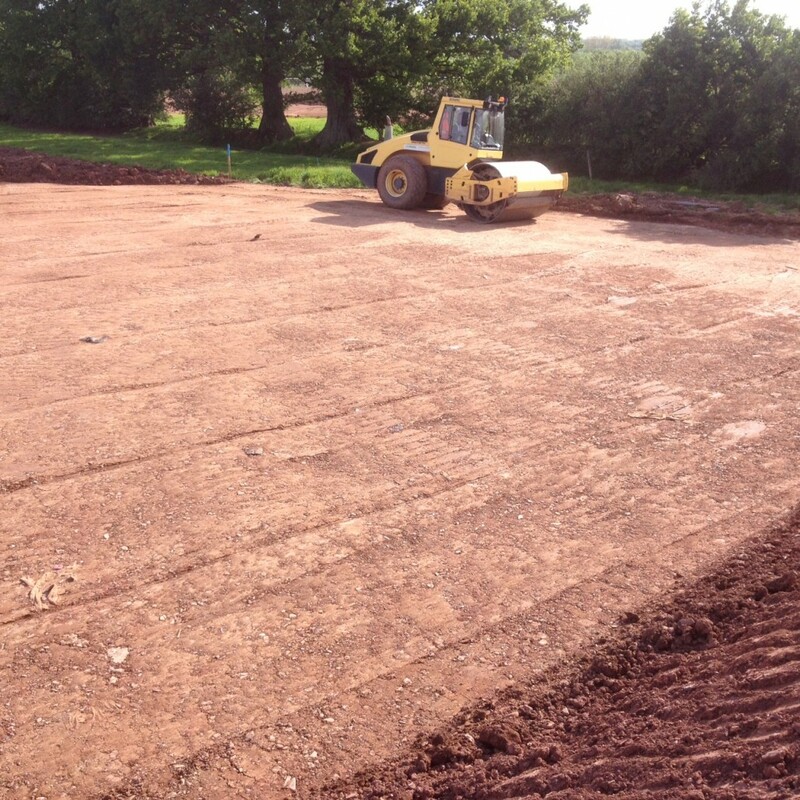 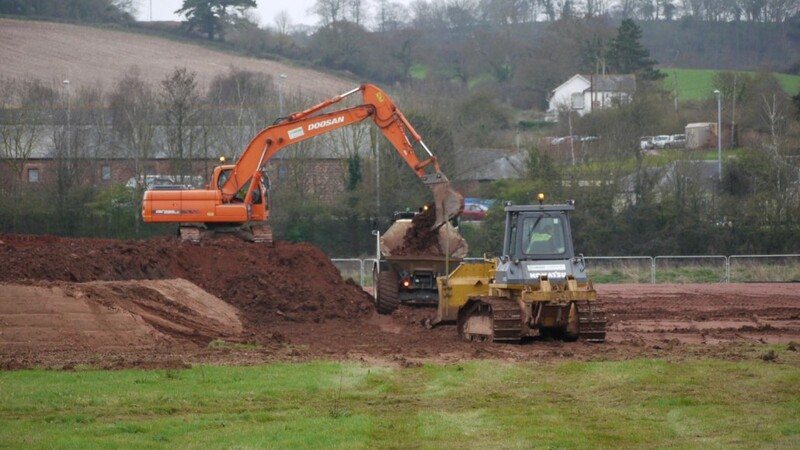 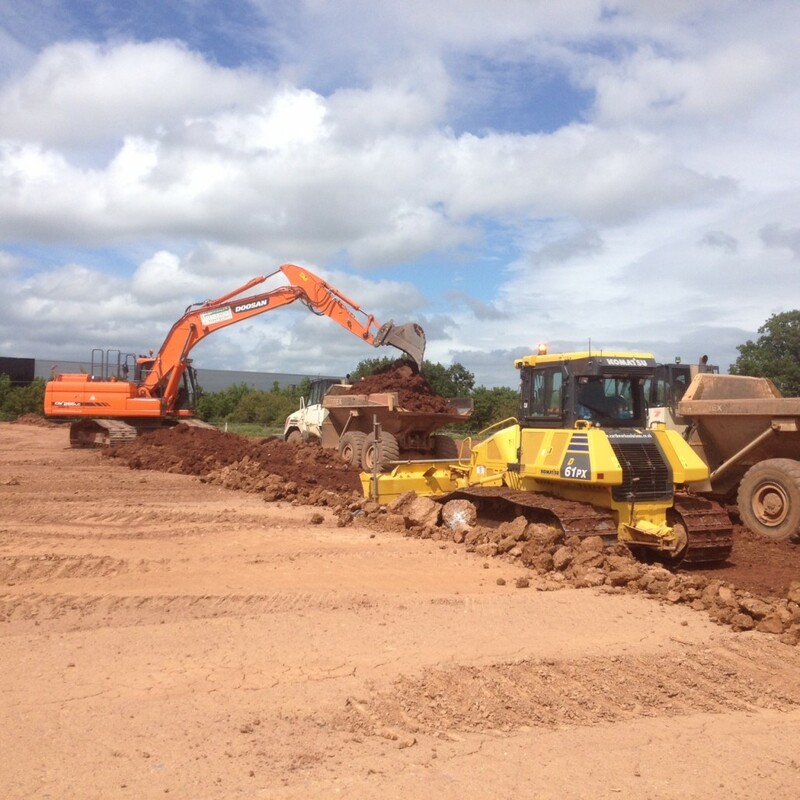 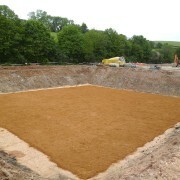 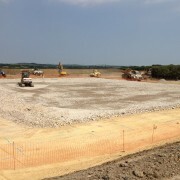 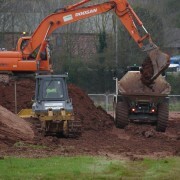 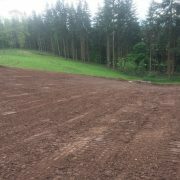 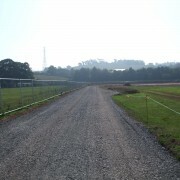 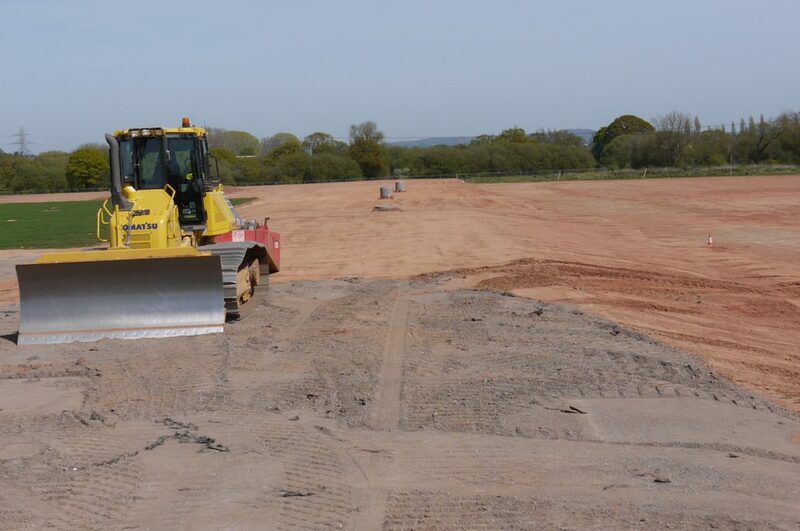 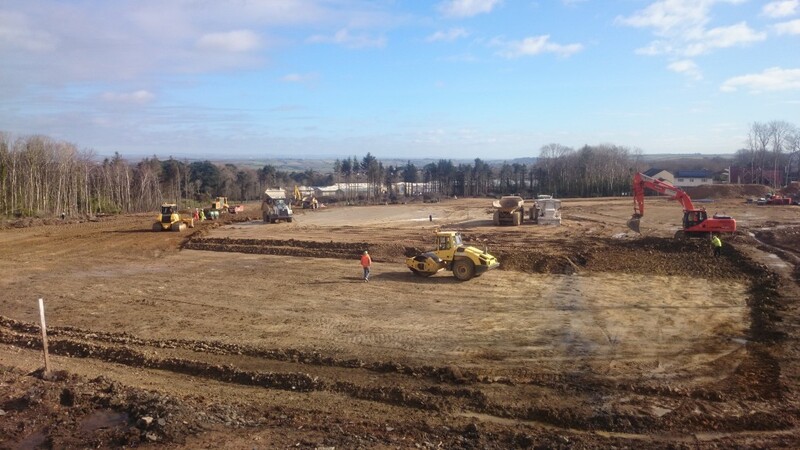 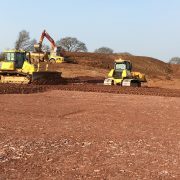 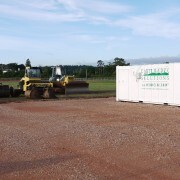 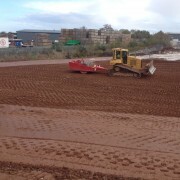 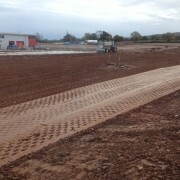 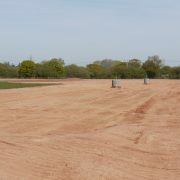 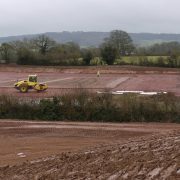 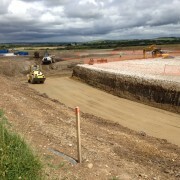 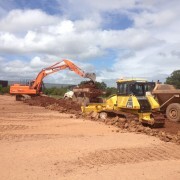 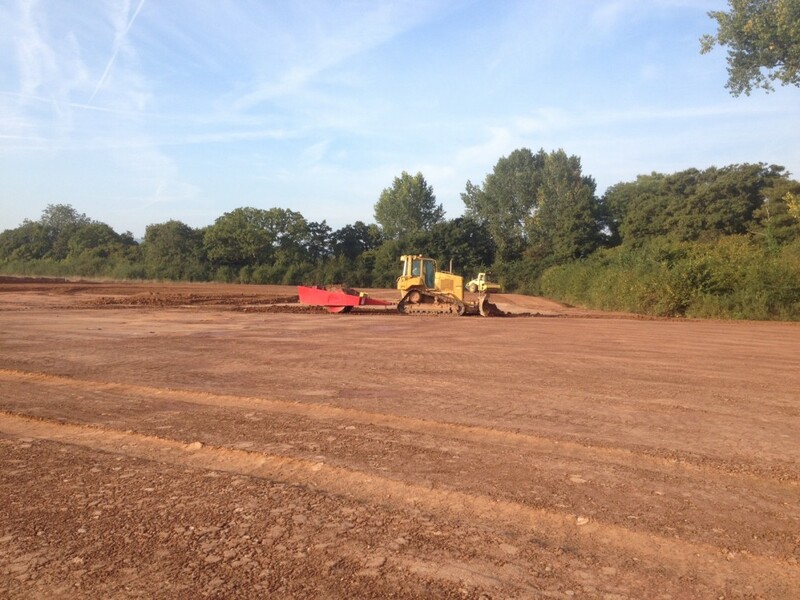 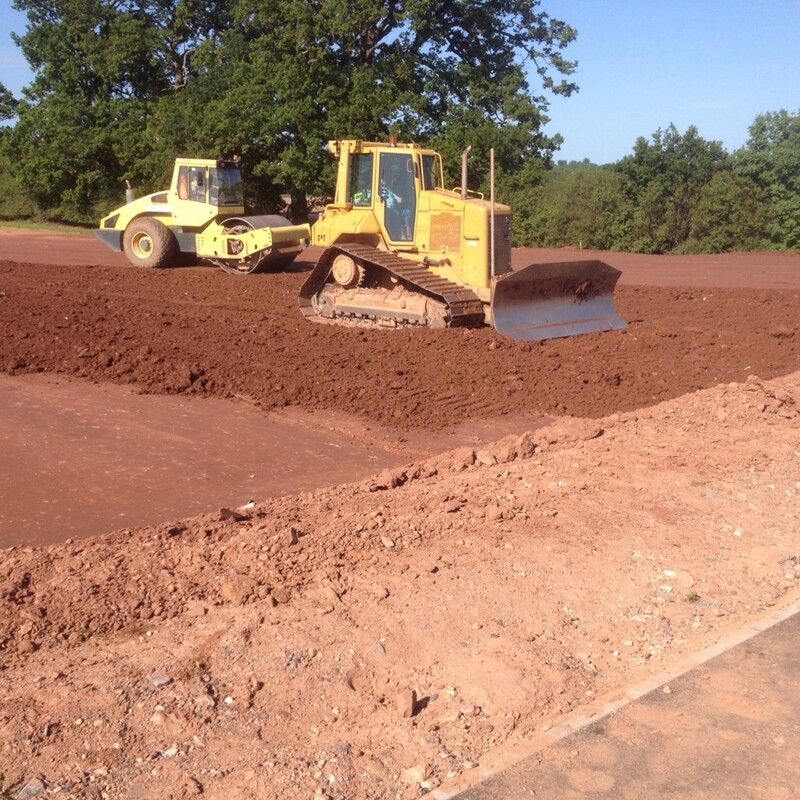 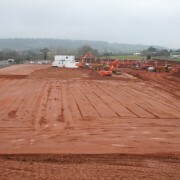 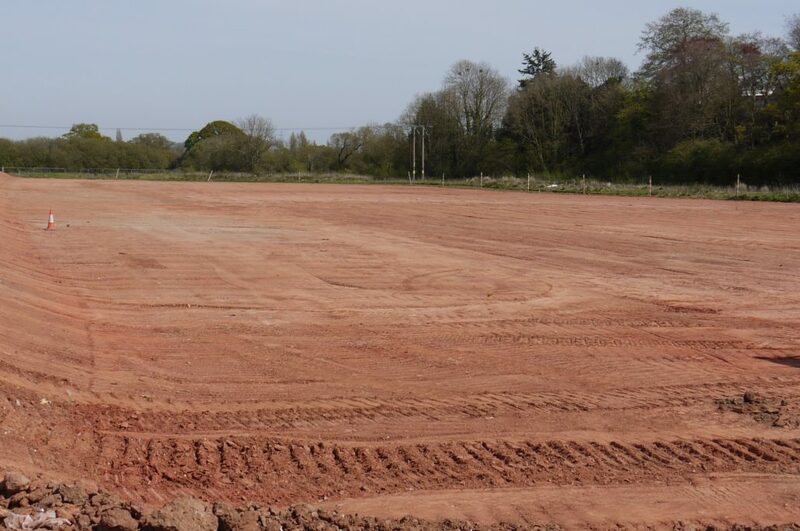 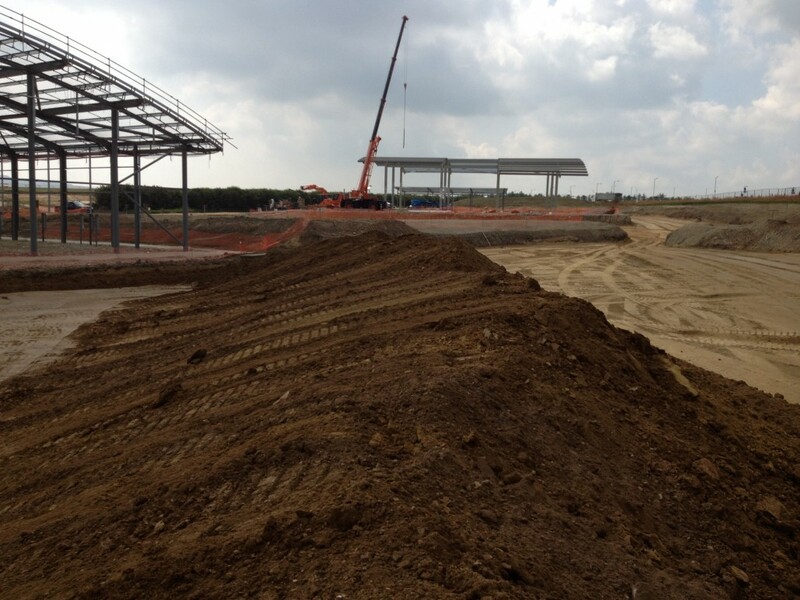 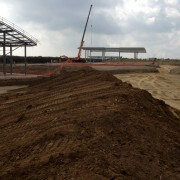 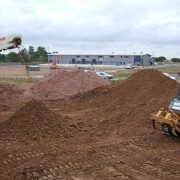 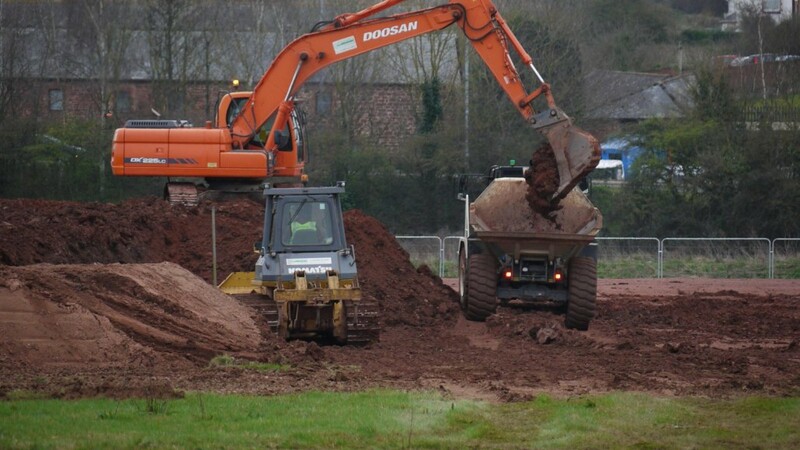 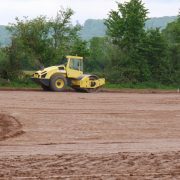 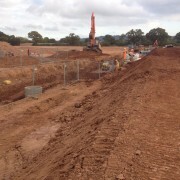 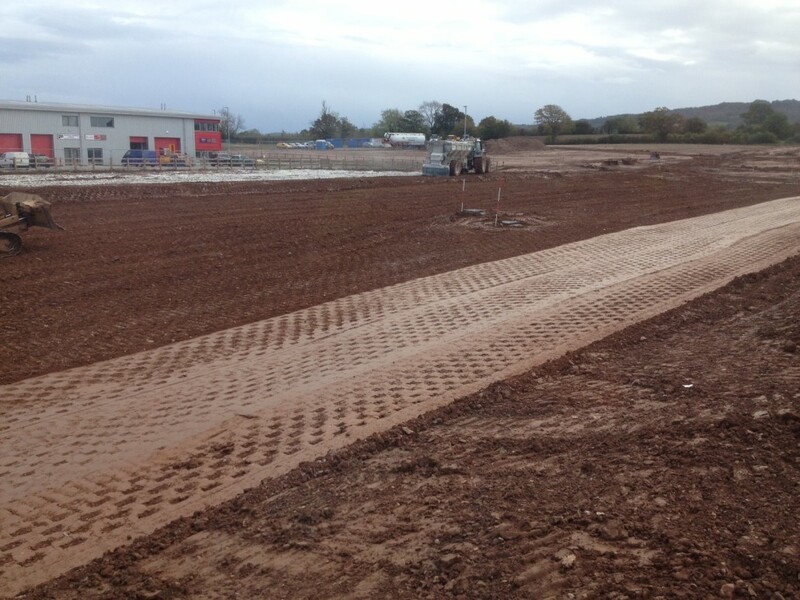 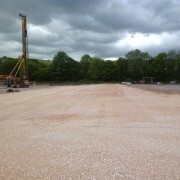 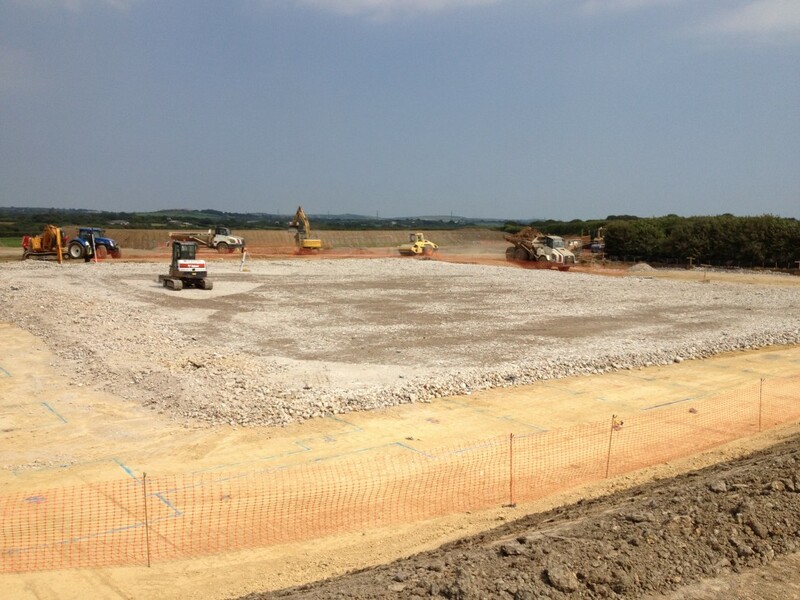 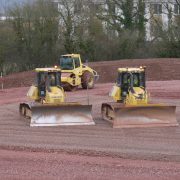 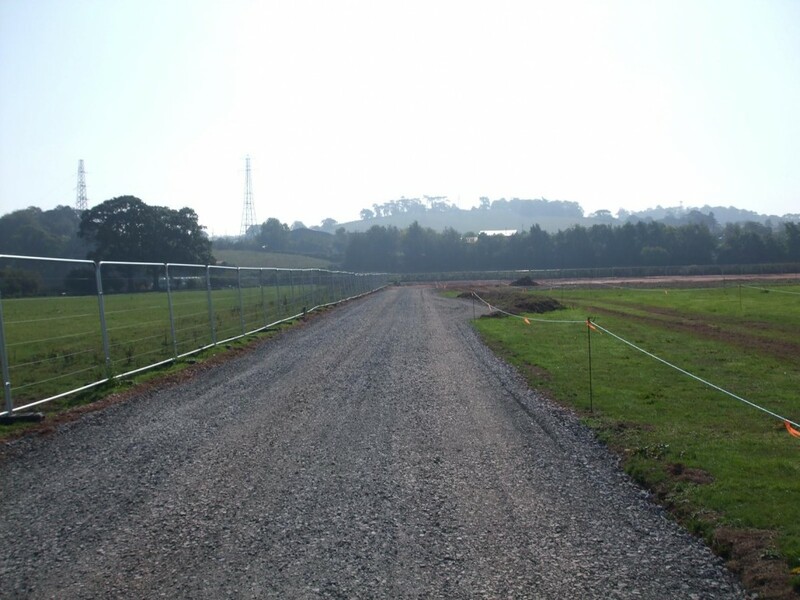 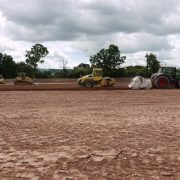 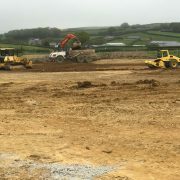 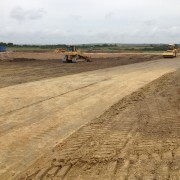 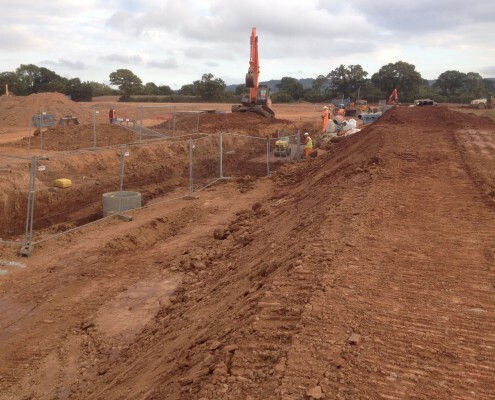 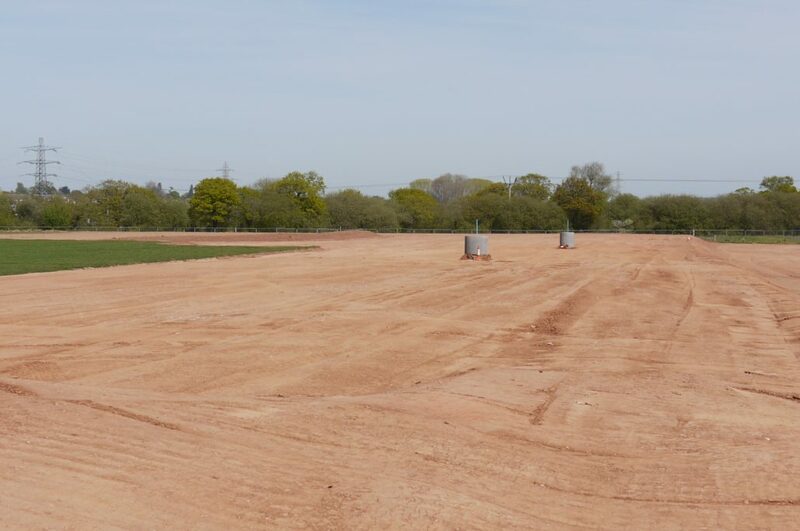 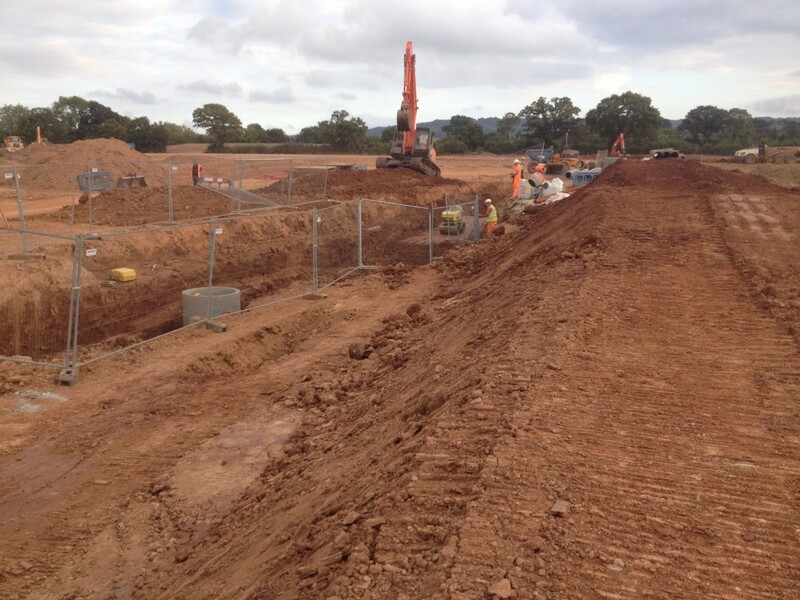 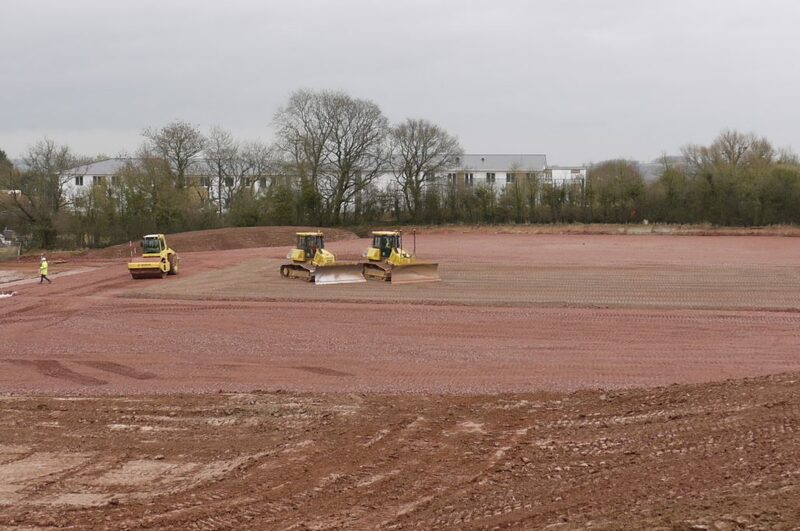 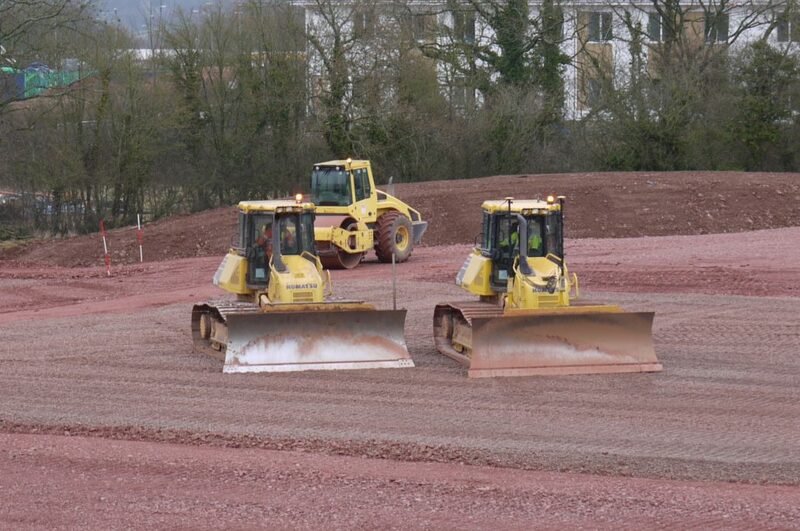 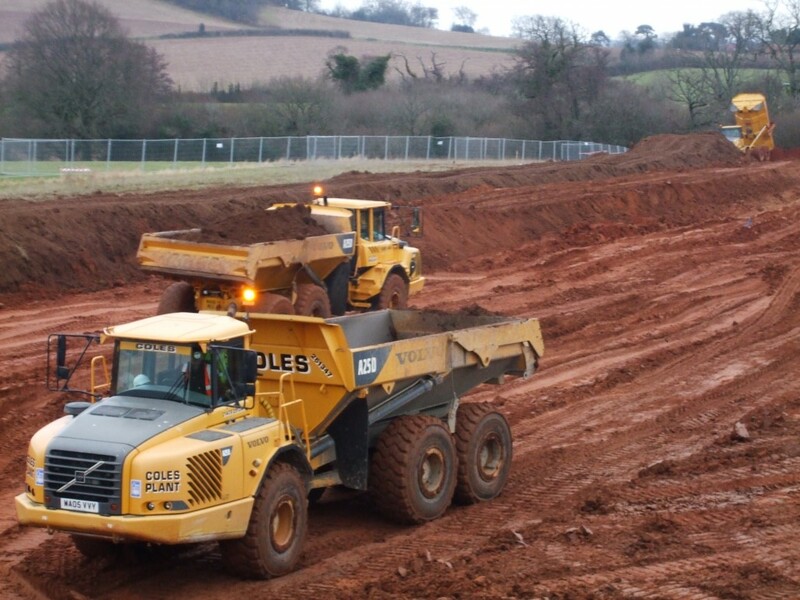 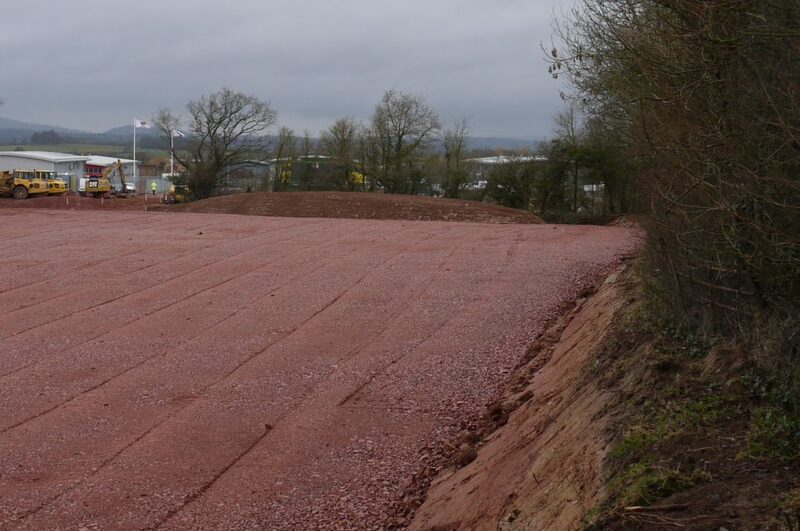 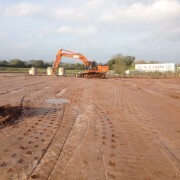 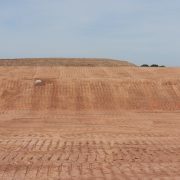 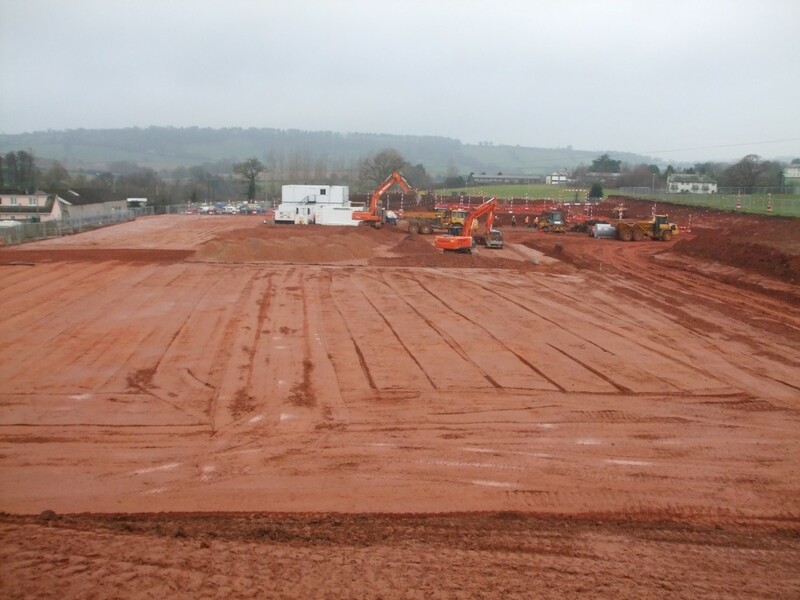 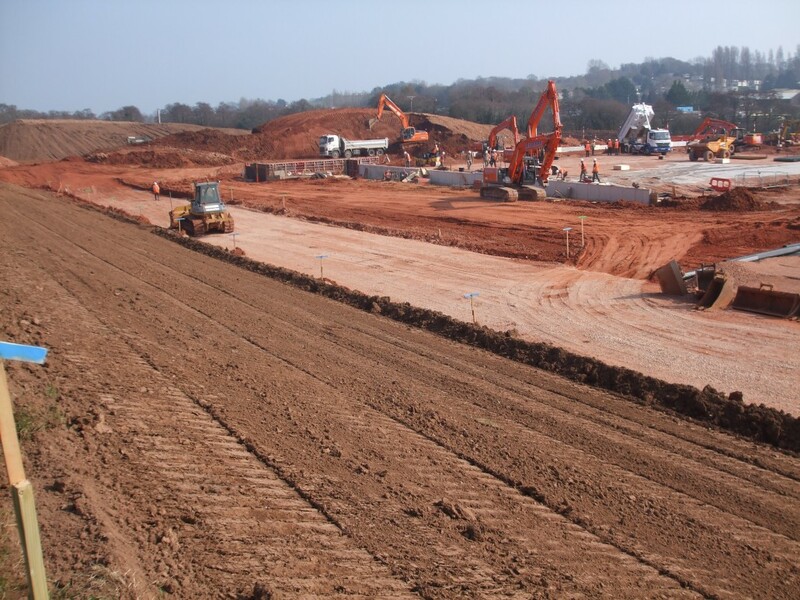 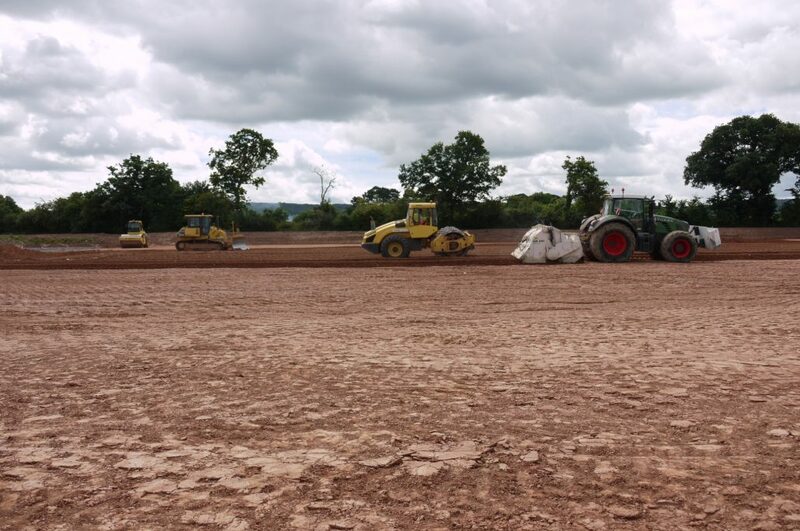 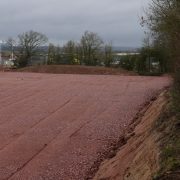 Strip existing sports pitches of topsoil and stockpile on site. 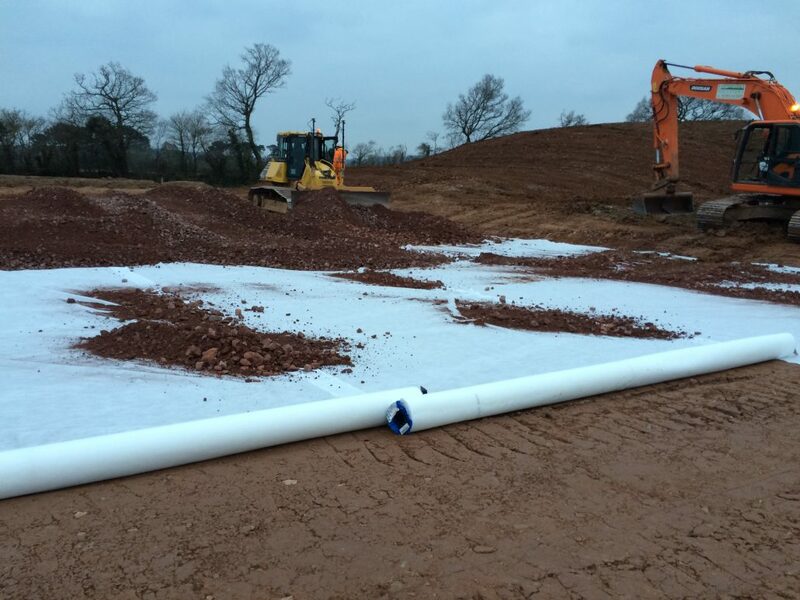 Spread and compact capping layer of 6F5 over development footprint. 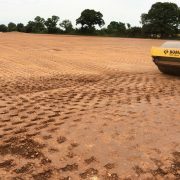 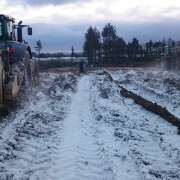 Top up depressions left on site after dynamic compaction. 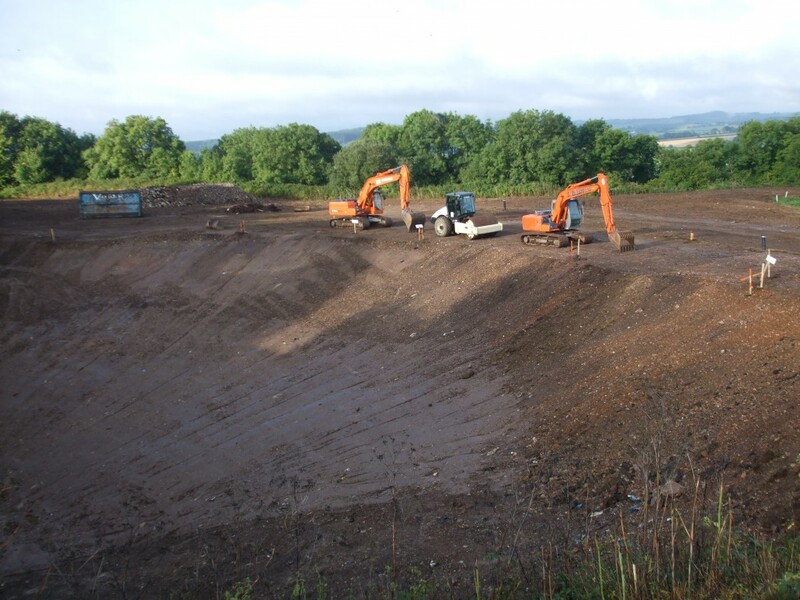 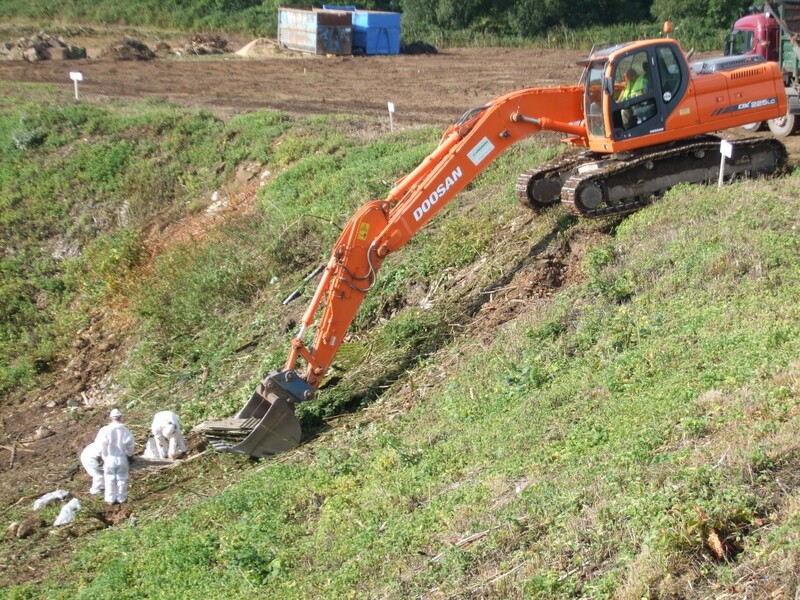 Excavate for attenuation tank and dispose of all arisings to adjacent field to depth of 3.0m. 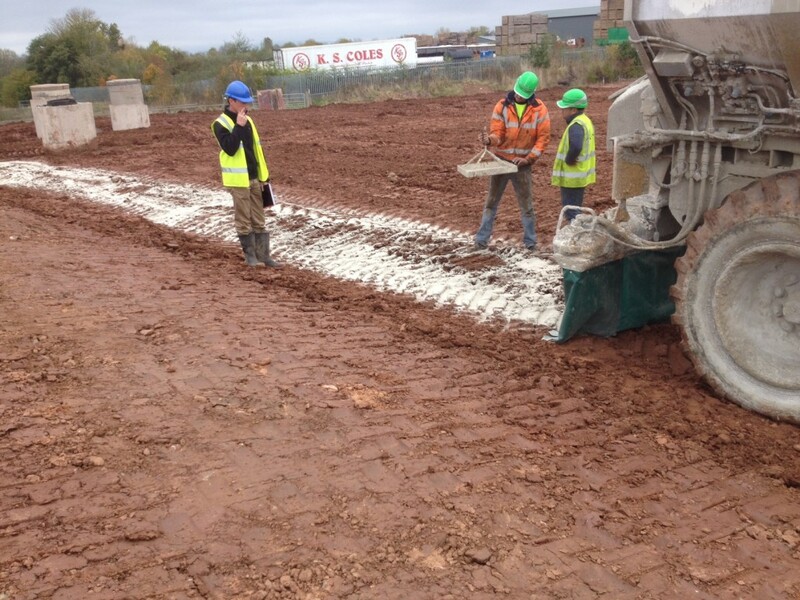 Fill to all surfaces with imported 6F5 in 250mm layers. 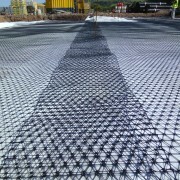 Each layer was separated with layers of Tensar TX160 geogrid. 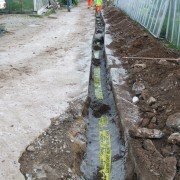 Form bus route with 1.0m depth of Tensar Geocell. 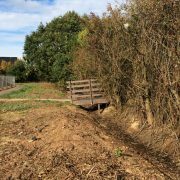 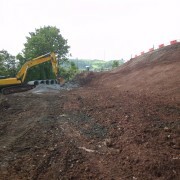 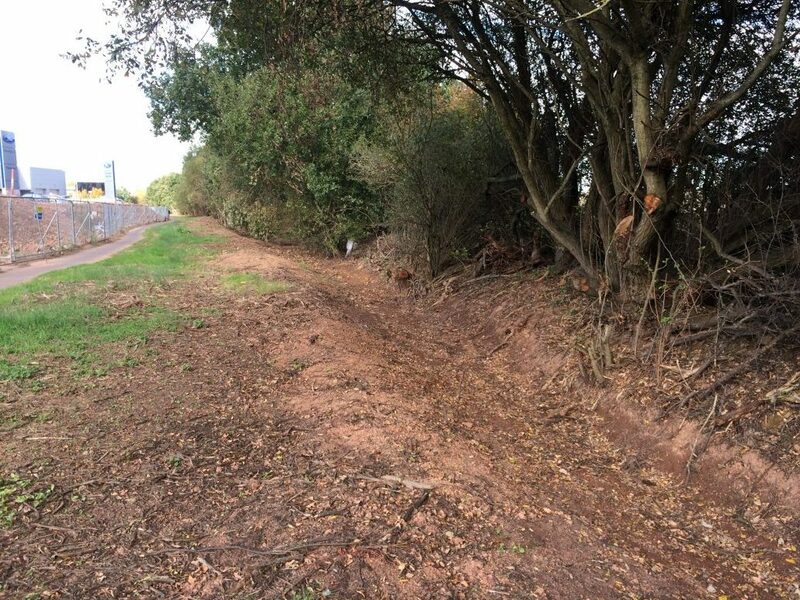 Excavate existing overgrown slope to profile to form new site access. 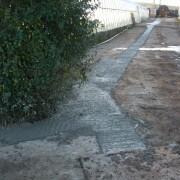 Trim and compact all surfaces in preparation for tarmac. 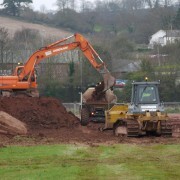 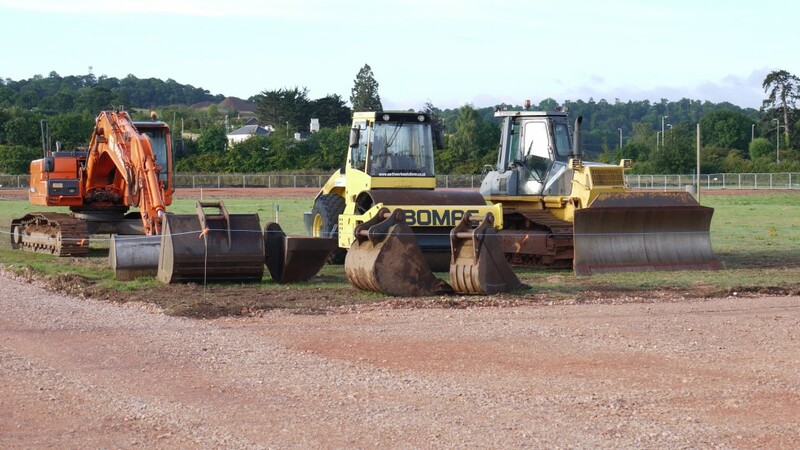 Import of approved topsoil for reinstatement of future sports facility. 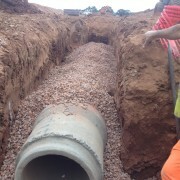 Backfilling of existing 1200mm culvert. 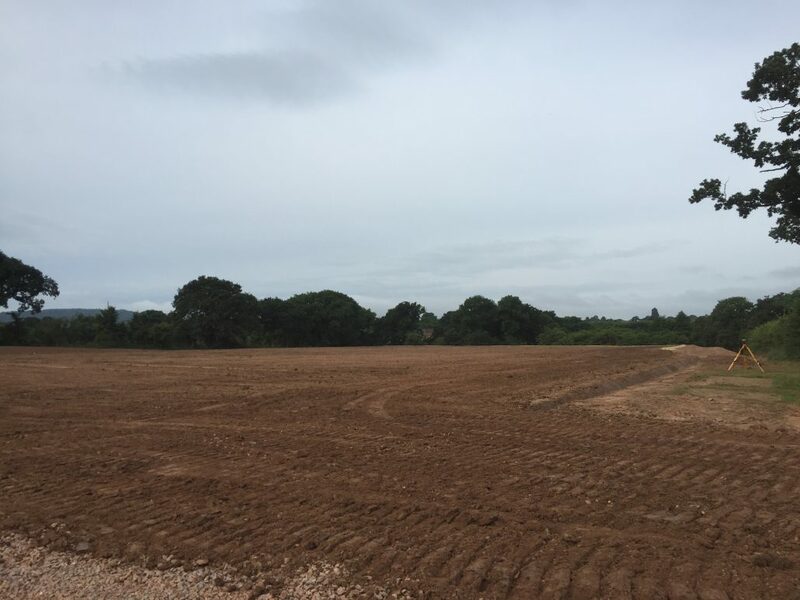 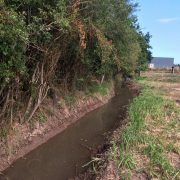 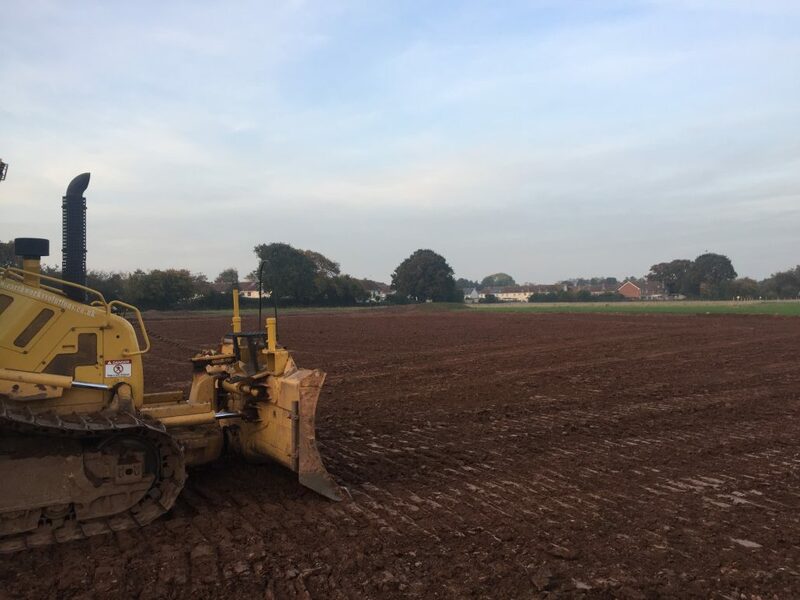 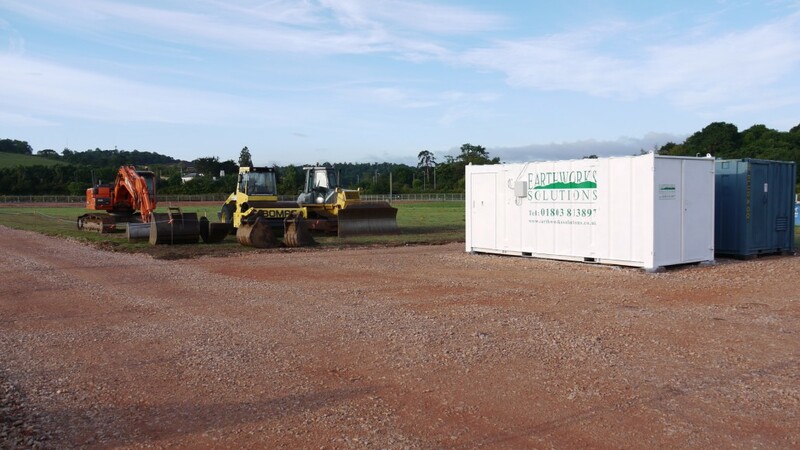 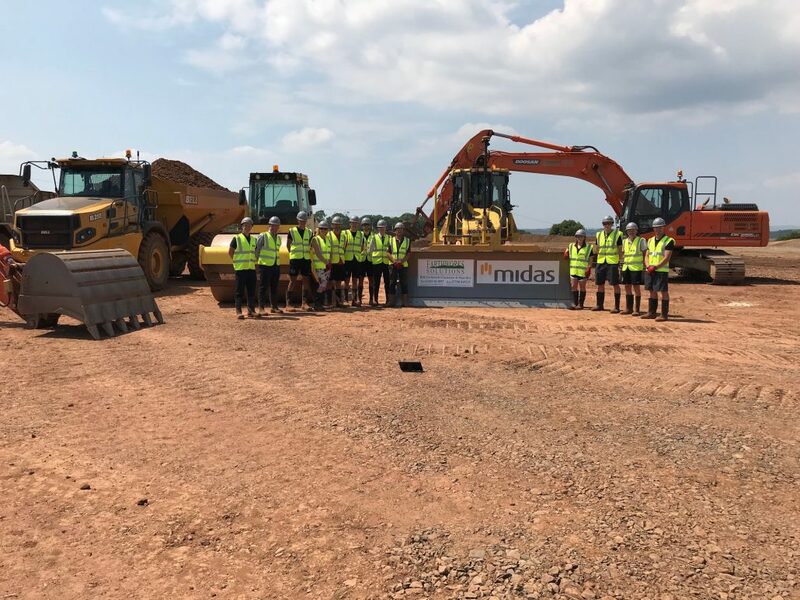 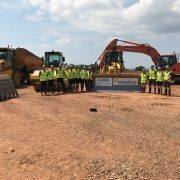 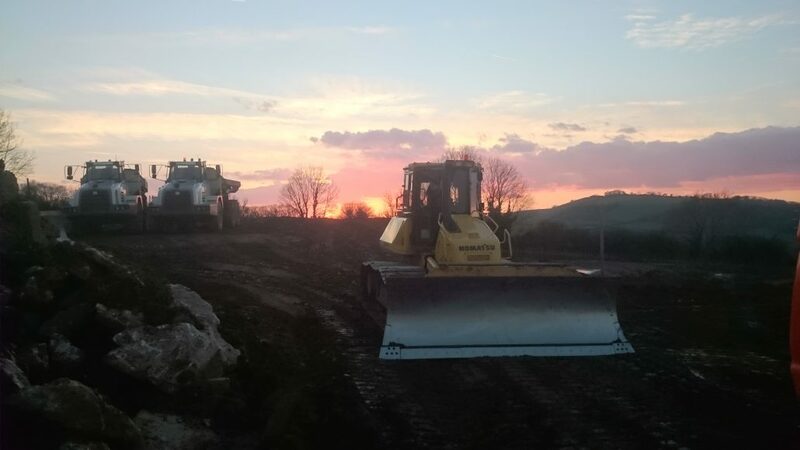 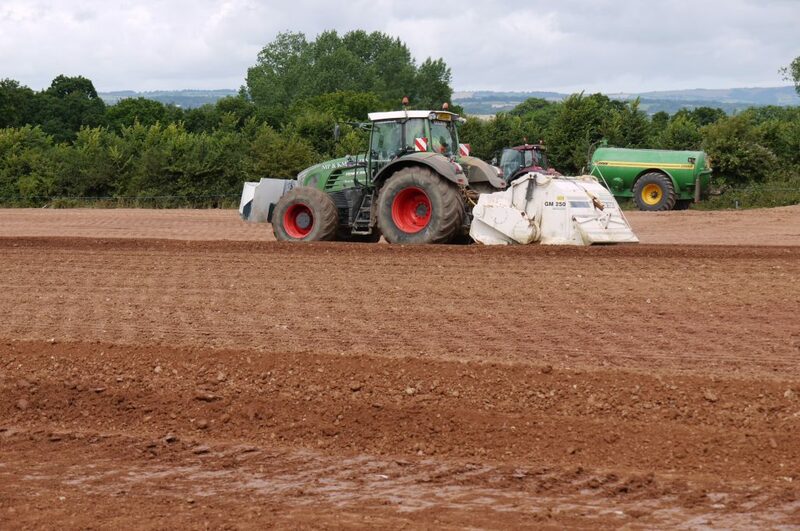 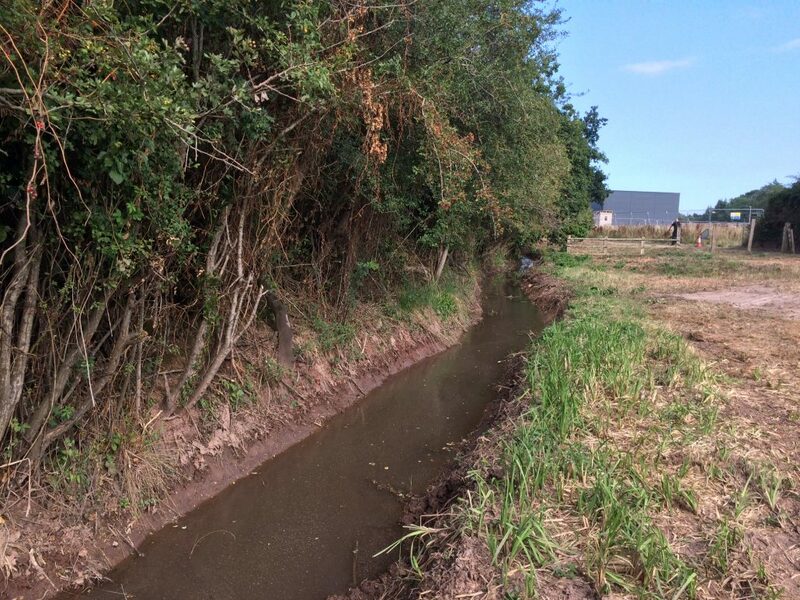 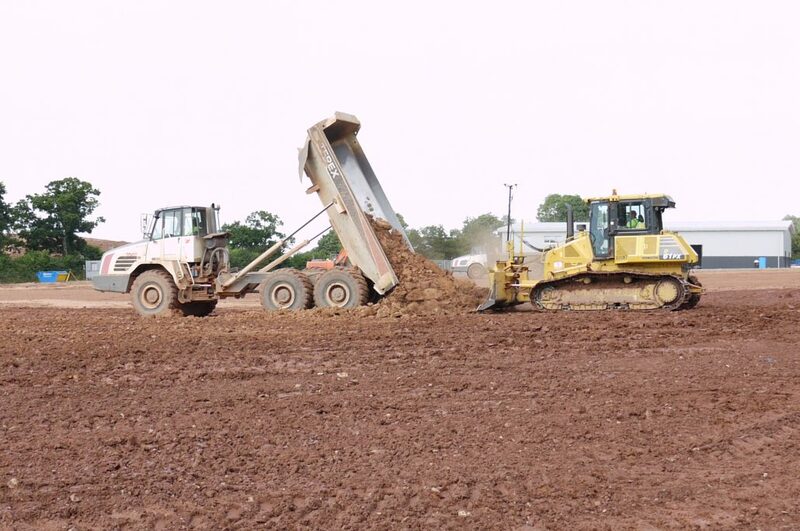 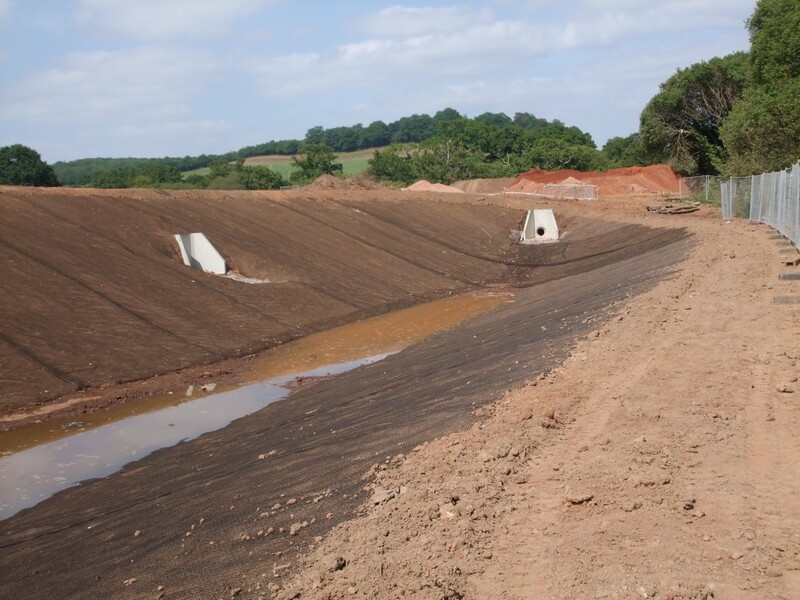 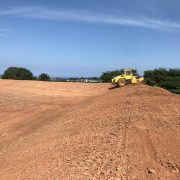 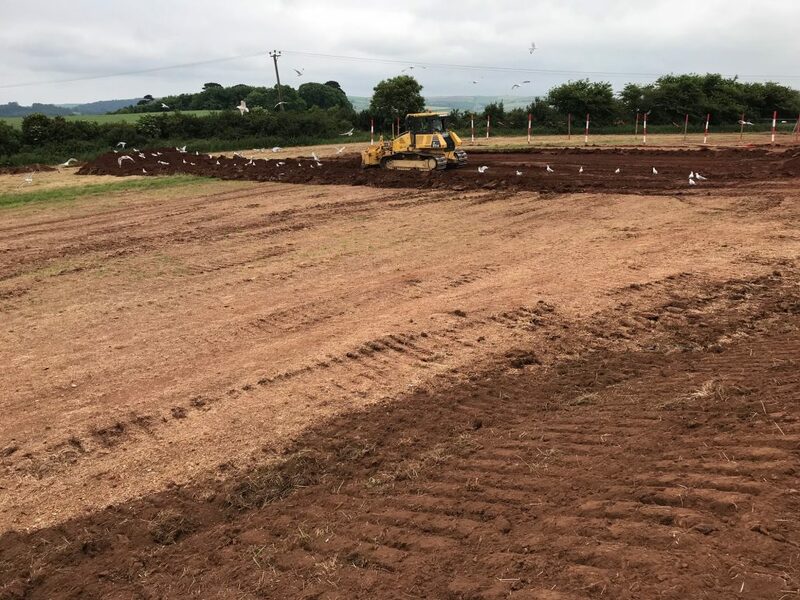 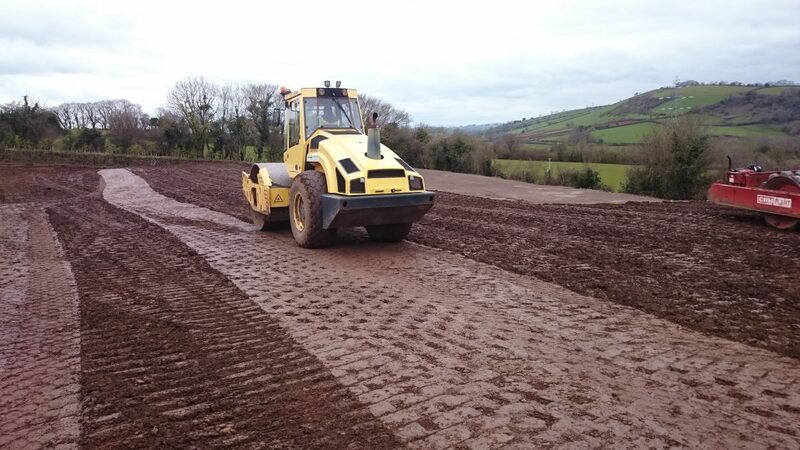 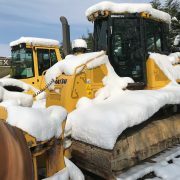 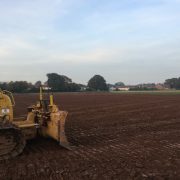 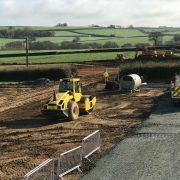 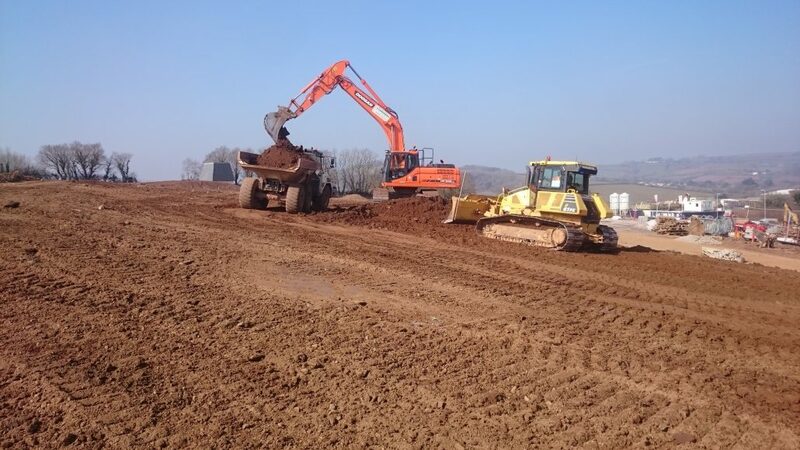 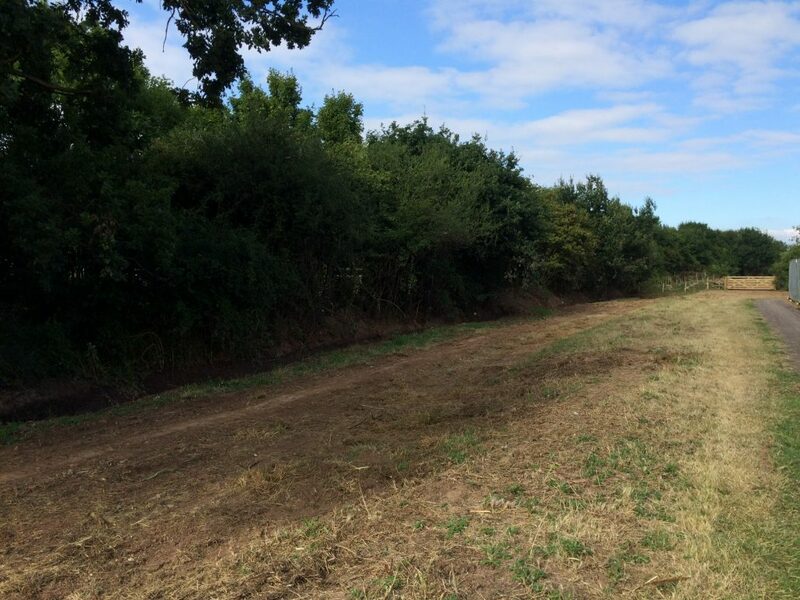 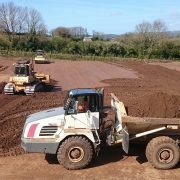 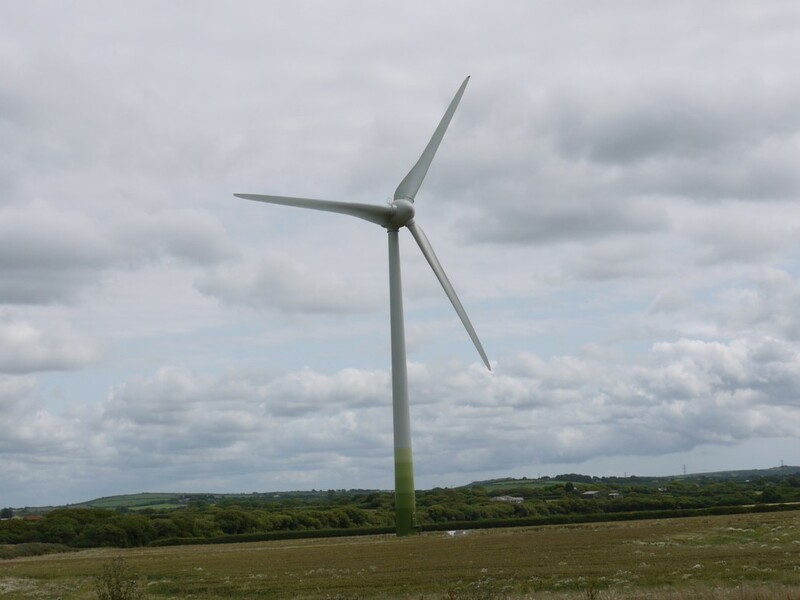 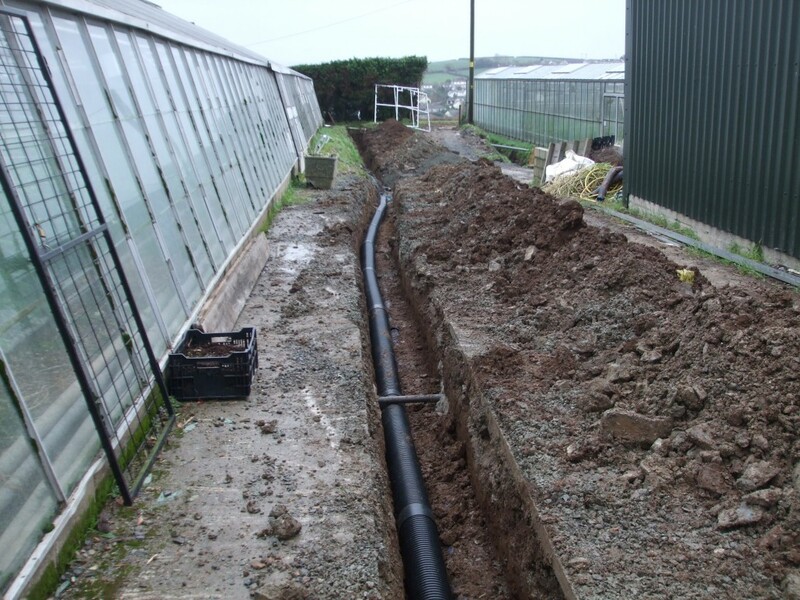 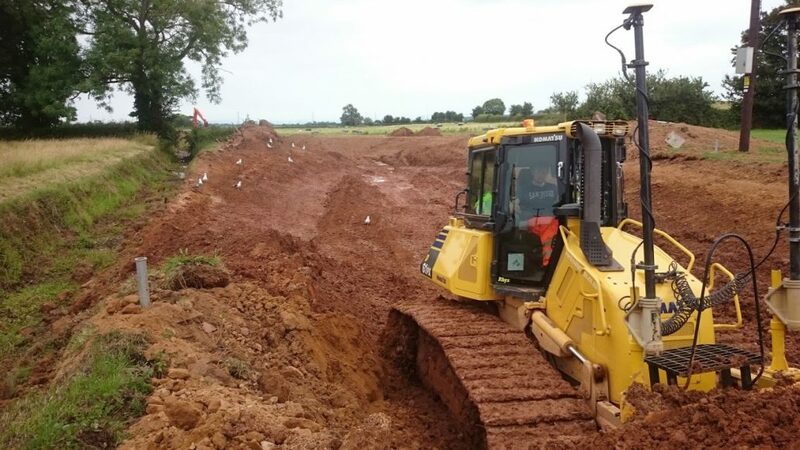 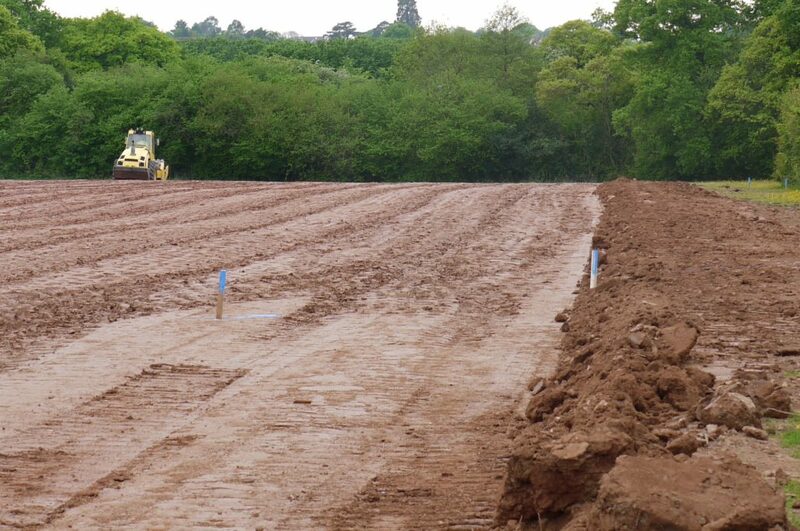 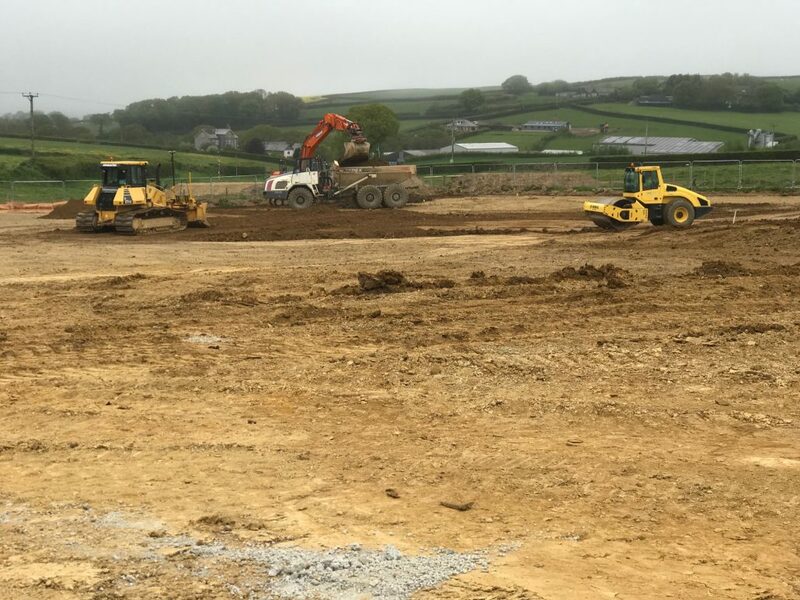 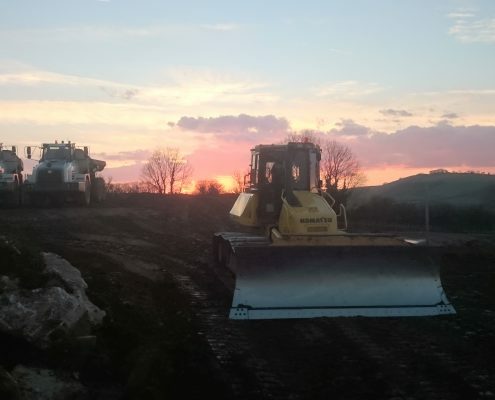 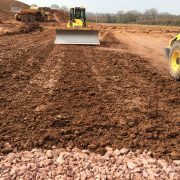 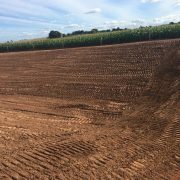 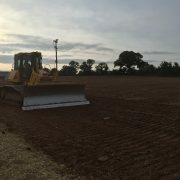 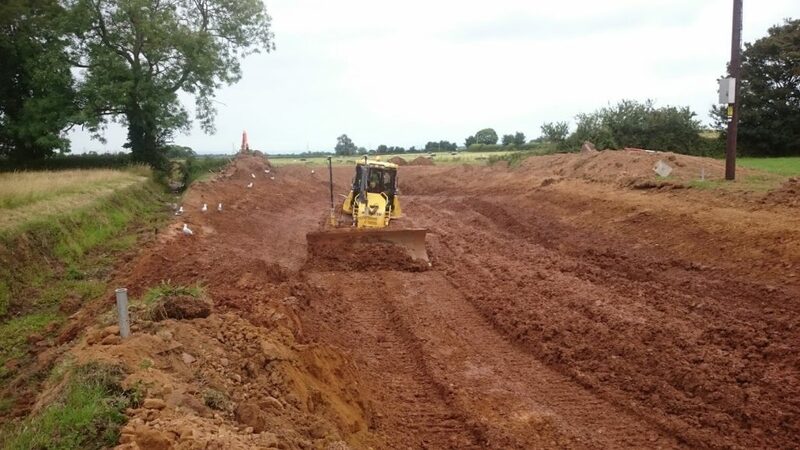 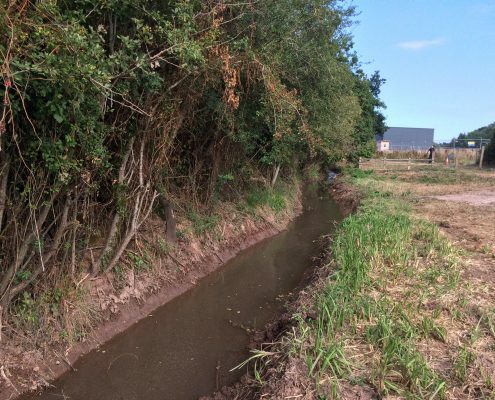 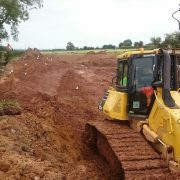 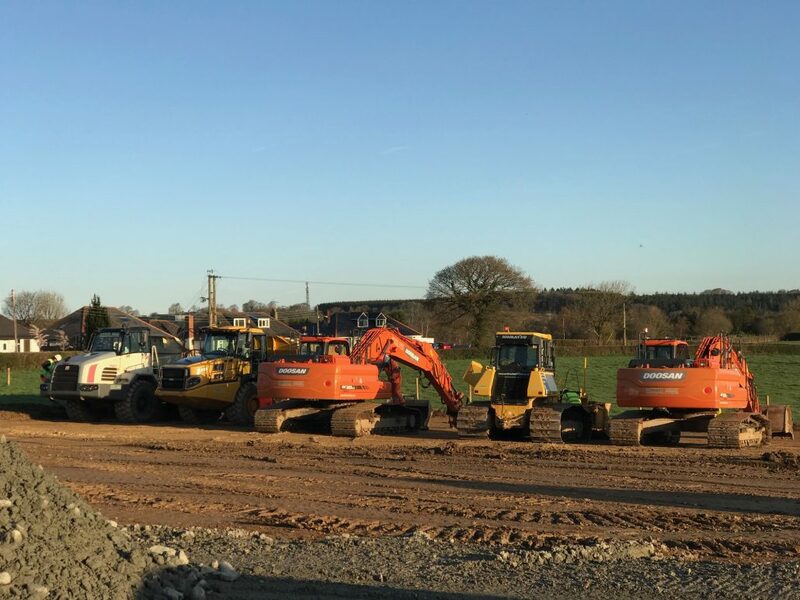 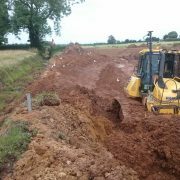 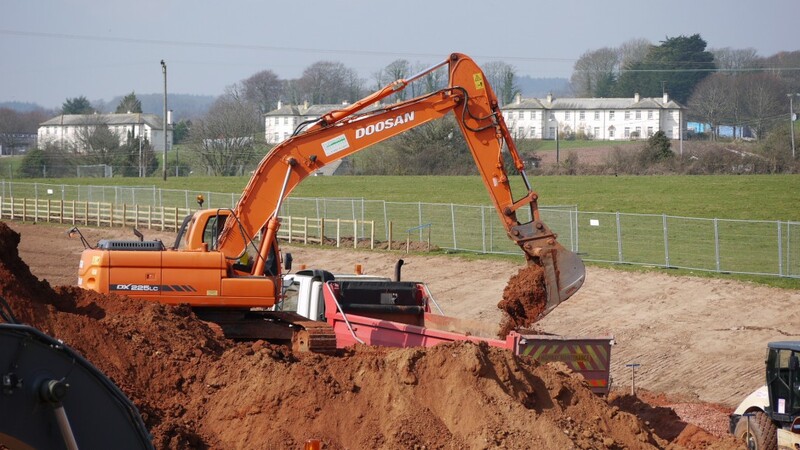 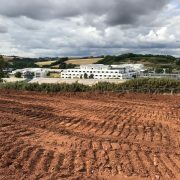 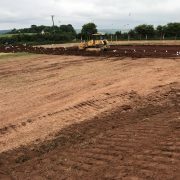 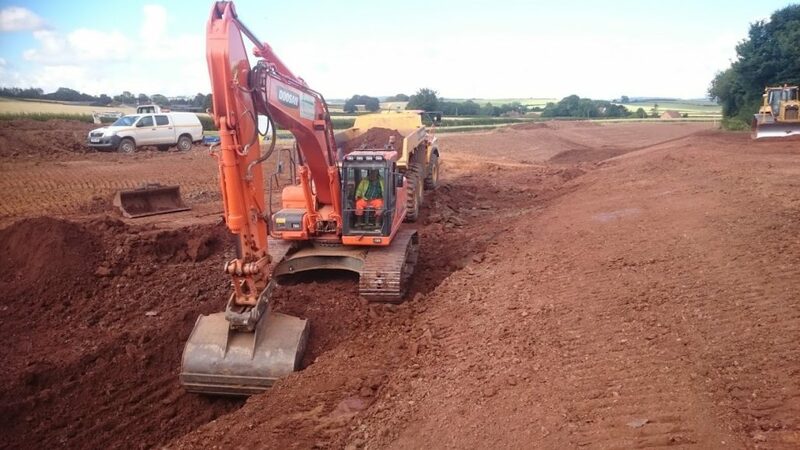 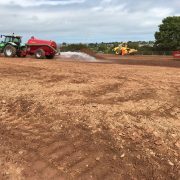 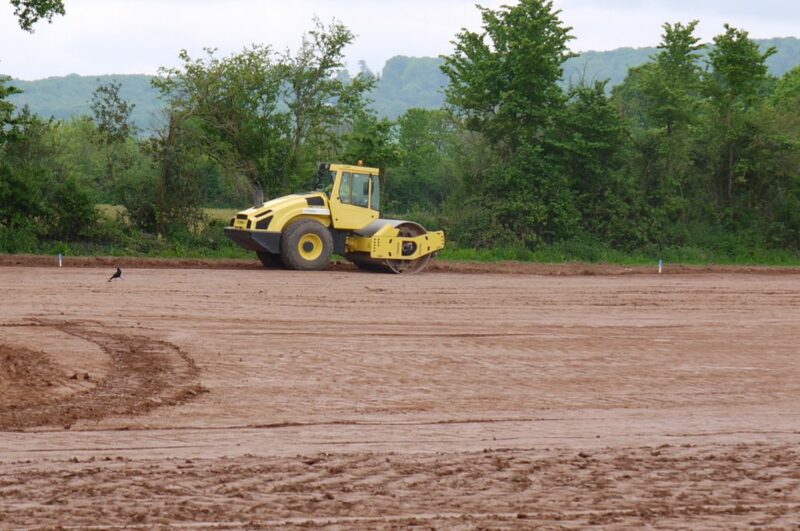 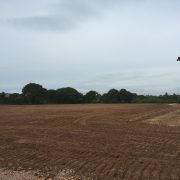 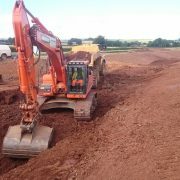 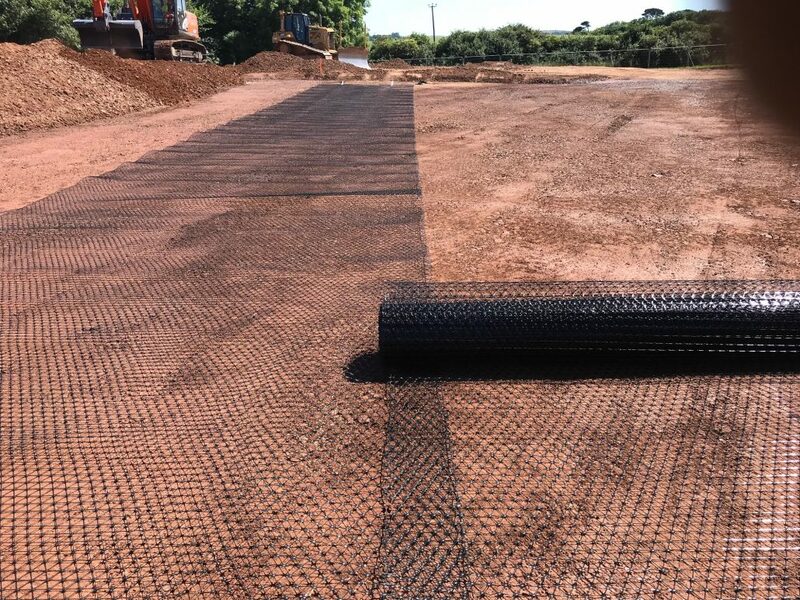 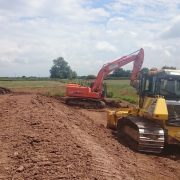 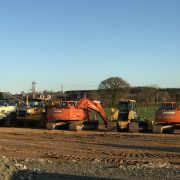 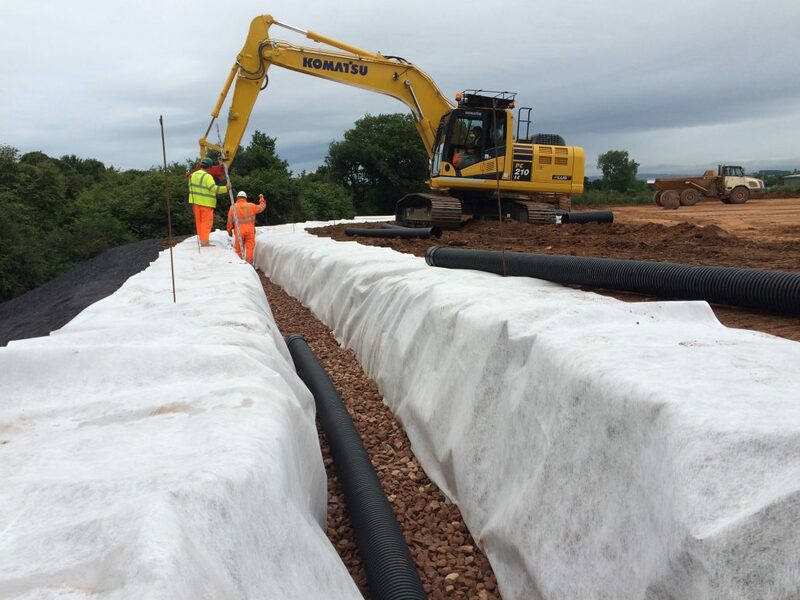 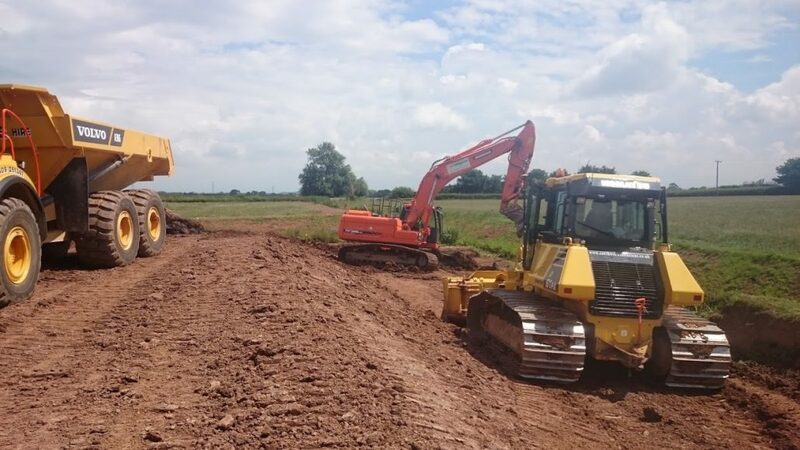 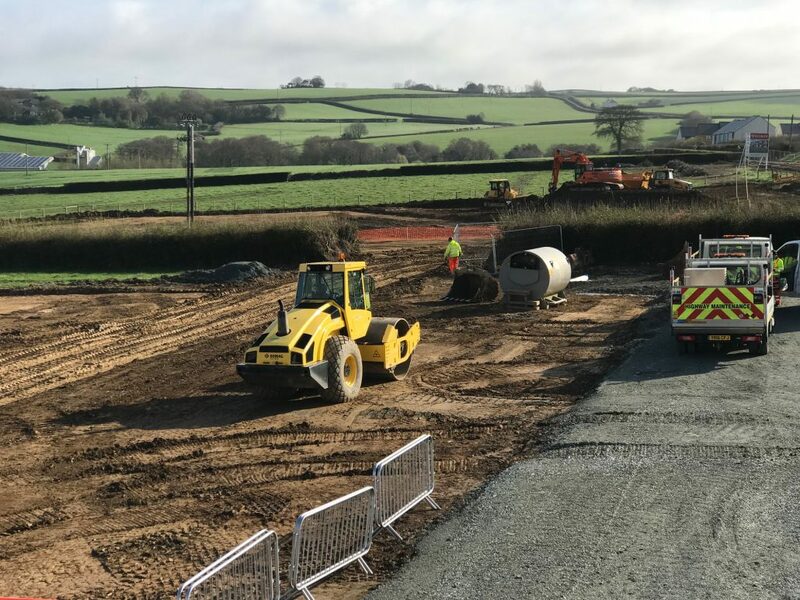 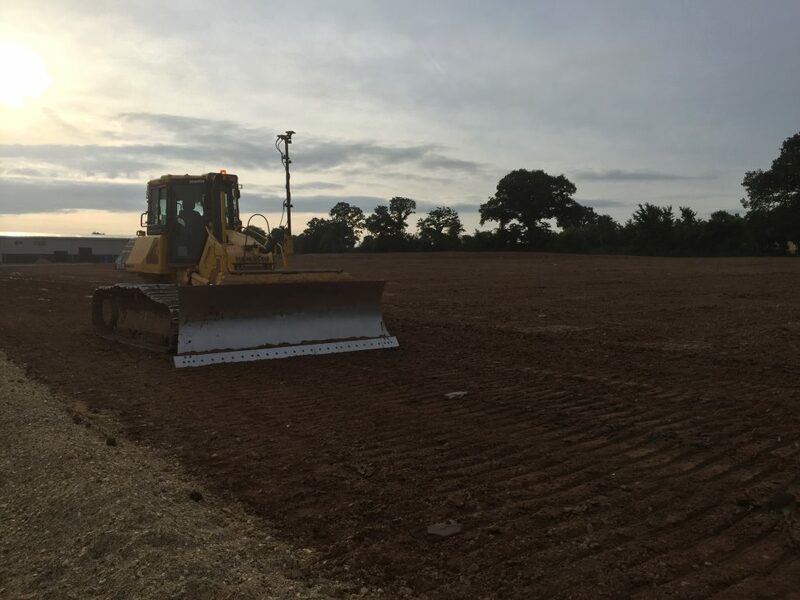 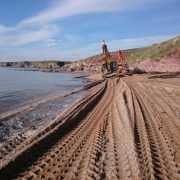 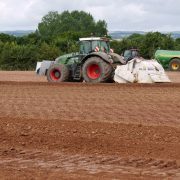 Our works involved coordinating between Client, Landowners, WPD, cable laying contractors and utility companies on a total of 16 farm sites throughout Devon, Cornwall and Somerset. 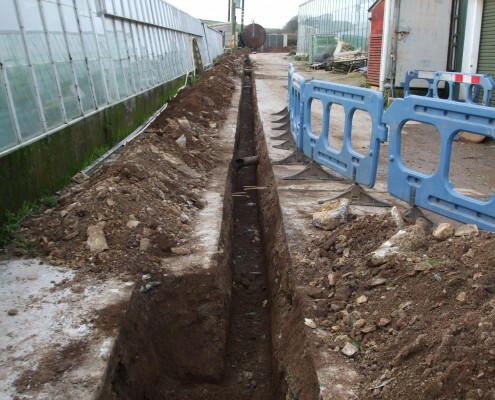 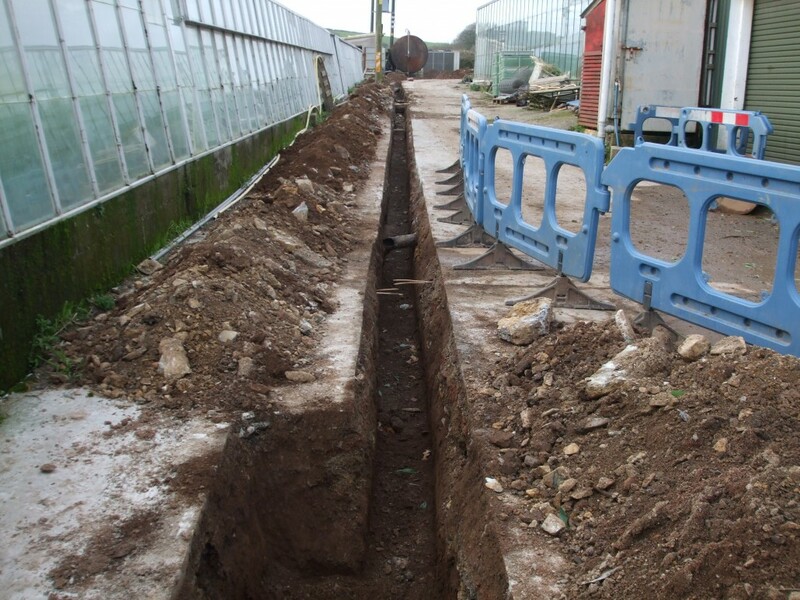 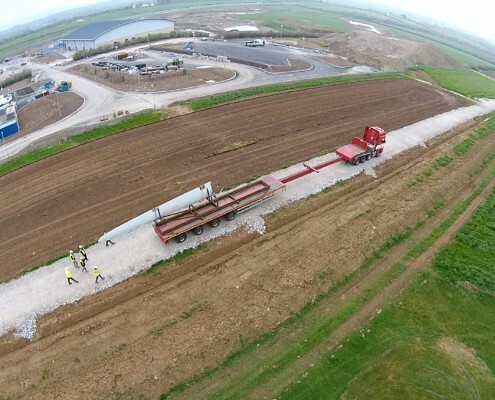 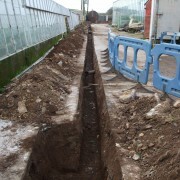 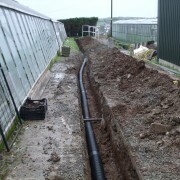 The works involved excavating a trench to the specified depth to accept a cable from the switchgear to the solar array panel field, typically 200m in length. 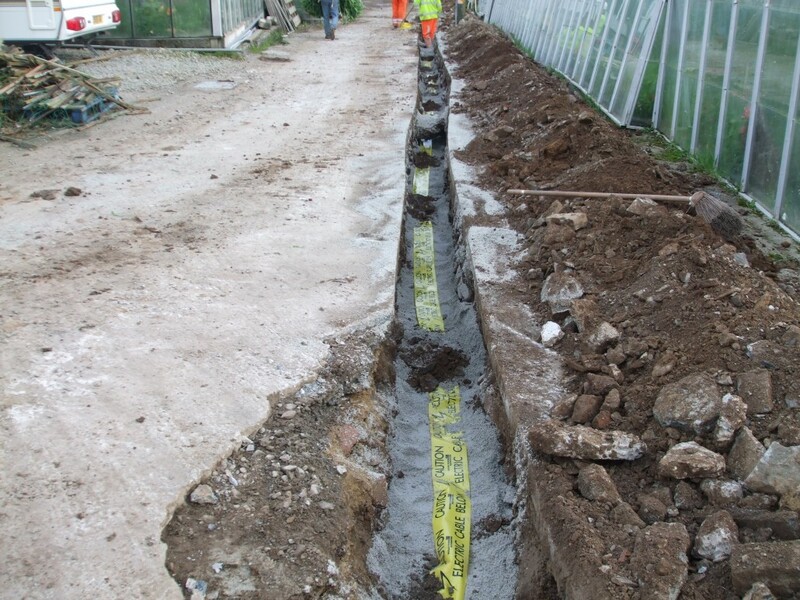 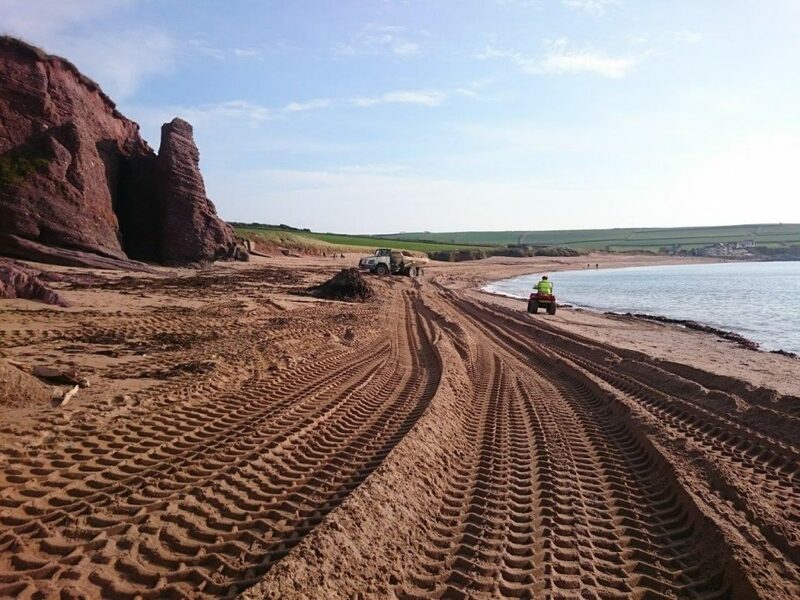 Cables were laid on a sand bed with surround or ducted where required, warning tape placed prior to backfilling and compacting with suitable selected material. 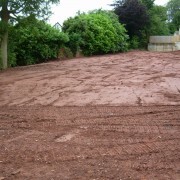 All sites were reinstated to match the existing surface and signed off to the satisfaction of the landowner.